Wyoming Class Battleship: Displacement 26,000 Tons, Dimensions, 562' (oa) x 93' 3" x 29' 7" (Max). Armament 12 x 12"/50, 21 x 5"/51, 2 x 21" tt. Armor, 11" Belt, 12" Turrets, 3" Decks, 11 1/2" Conning Tower. 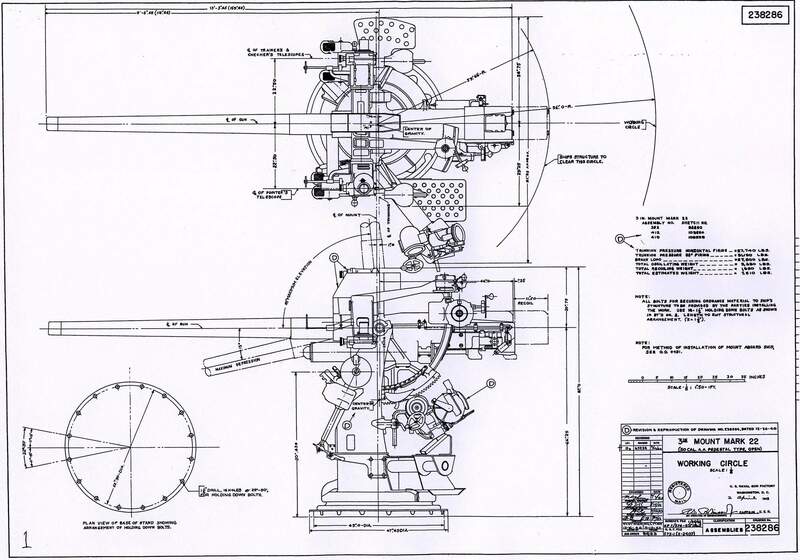 Machinery, 28,000 SHP; Direct Drive Turbines, 4 screws. Speed, 20.5 Knots, Crew 1063. Operational and Building Data: Laid down by New York, Shipbuilding, Camden, NJ., January 25, 1910. Launched January 14, 1911. Commissioned September 17, 1912. Decommissioned July 29, 1946. Stricken August 15, 1946. 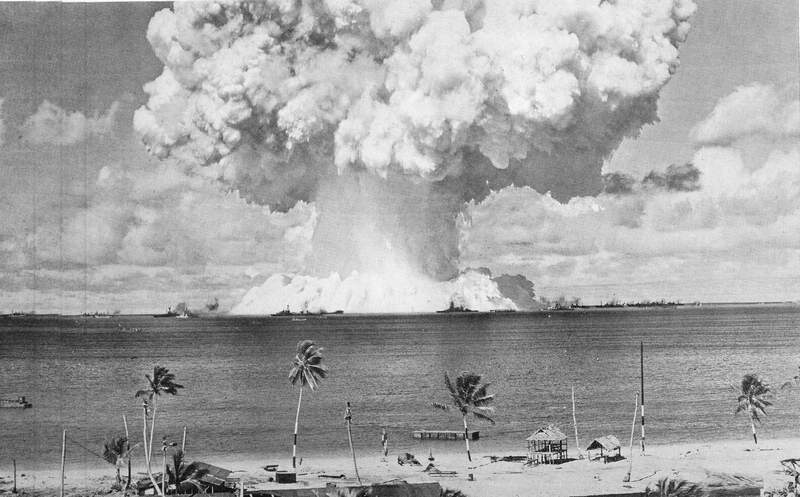 Fate: Sunk July 25, 1946, During Atomic Bomb Test "Baker" at Bikini Atoll, Marshall Islands. 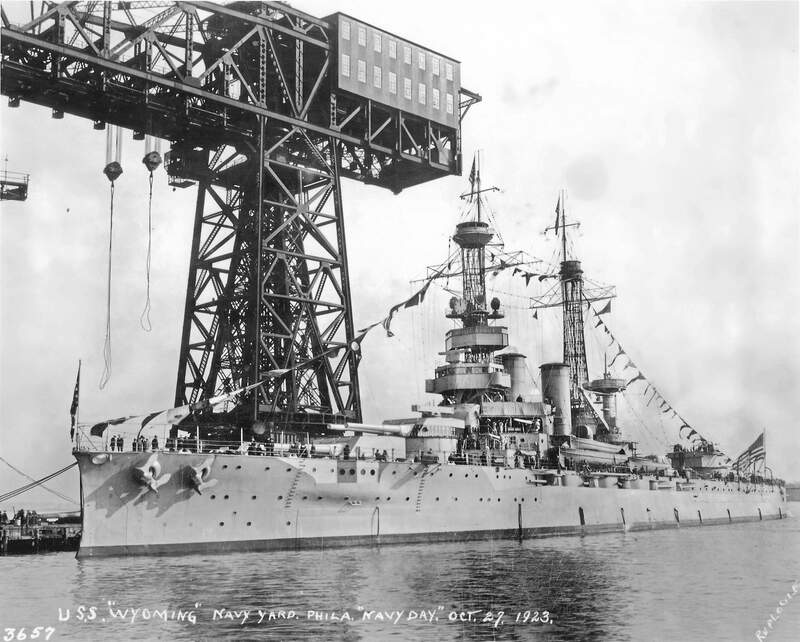 Lessons learned from the building of the Dreadnought incorporated into construction of what would be the Wyoming class (BB-32 / 33). Image and text provided by University of Utah, Marriott Library. Photo by Deseret Evening News. (Great Salt Lake City [Utah]) 1867-1920, 12 January 1907, Last Edition, Image 10, courtesy of chroniclingamerica.loc.gov. 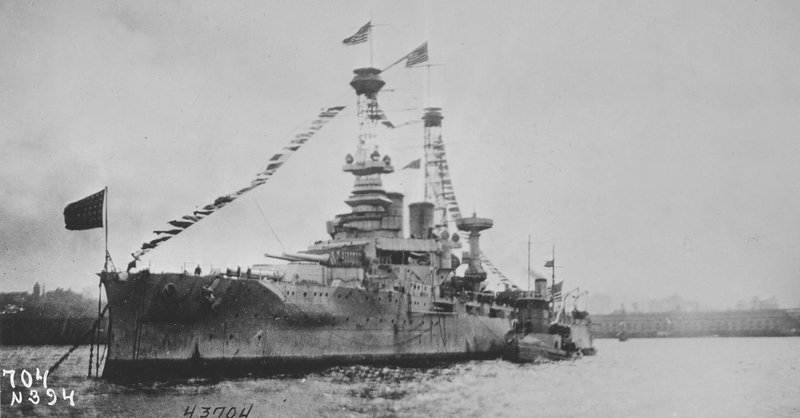 392k Arkansas (BB-33) sometime shortly before launching, circa January 1911. Photo courtesy of old-picture.com. THE BATTLESHIP ARKANSAS, AS IT LOOKED BEFORE IT STARTED DOWN THE WAYS AT CAMDEN SHIPYARDS. Image and text provided by Washington State Library; Olympia, WA. Photo from The Tacoma Times. (Tacoma, Wash.) 1903-1949, 18 January 1911, Image 8, courtesy of chroniclingamerica.loc.gov. 778k Great Fighting Craft Ready for the Water, and Its Sponsor Image and text provided by Library of Congress, Washington, DC. Photo by The Washington Times. (Washington [D.C.]) 1902-1939, 13 January 1911, Last Edition, Image 1, courtesy of chroniclingamerica.loc.gov. 566k Arkansas (BB-33) immediately prior to being launched on 14 January 1911. Library of Congress photo # LC-B2-2134-5 via Mike Green. 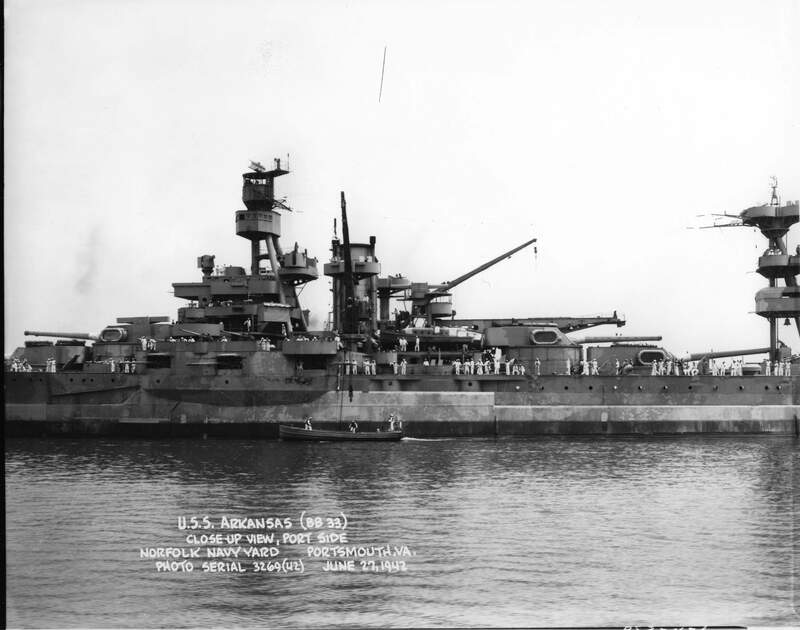 1.19k Arkansas (BB-33), Largest in American Navy, Glides Into Water. GREAT DAY AT CAMDEN, N. J. 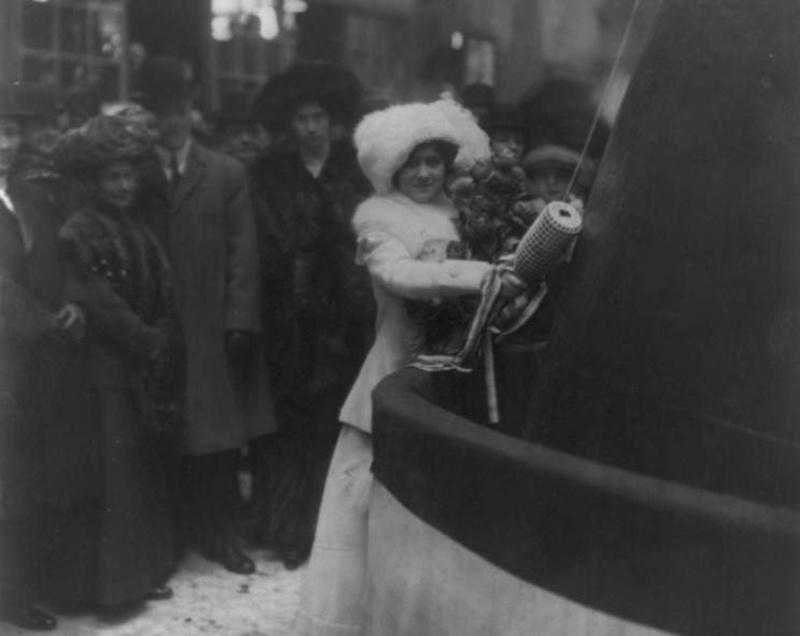 Miss Macon Baptizes Vessel with Champagne, Despite Home Folks' Protest. Image and text provided by Library of Congress, Washington, DC. Photo from the New-York Tribune. (New York [N.Y.]) 1866-1924, 15 January 1911, Image 1, courtesy of chroniclingamerica.loc.gov. 133k Miss Nancy Louise Macon is about to introduce the Arkansas (BB-33) to the liquid realm. USN photo courtesy of Scott Koen & ussnewyork.com. 2.70k BIG BATTLESHIP ARKANSAS (BB-33) LAUNCHED AT CAMDEN. Image and text provided by University of California, Riverside. Photo from the The San Francisco Call. (San Francisco [Calif.]) 1895-1913, 15 January 1911, Image 31, courtesy of chroniclingamerica.loc.gov. 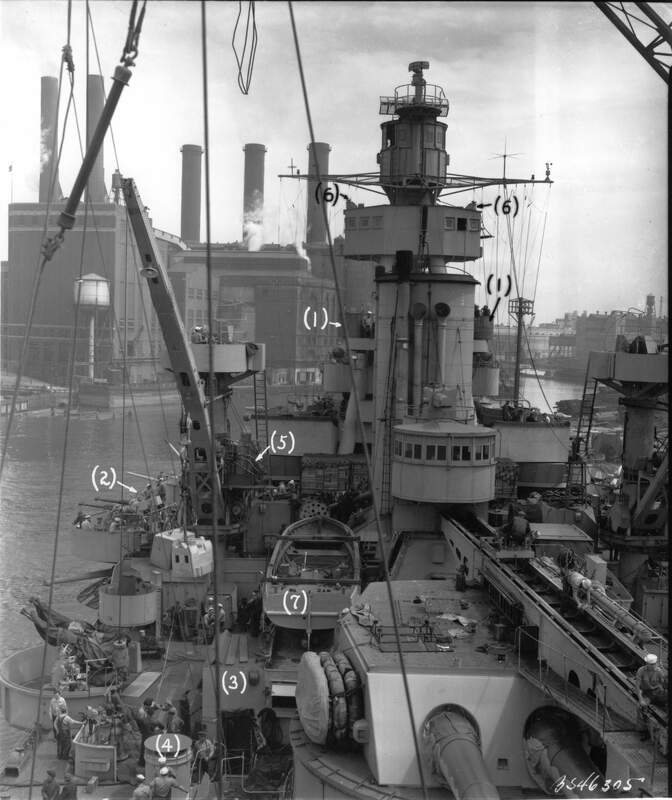 450k Arkansas (BB-33) fitting out with the Williamsburg Bridge in the background. Digital ID: # LC-B2-2940-6. Source: Library of Congress Prints and Photographs Division, from the George Grantham Bain Collection, via flickr.com/photos/library_of_congress. 3.04k Arkansas (BB-33) port view, at 16 knots while on trials, 21 May 1912. USN photo # 19-N-5-21-10, courtesy of the National Museum of the U.S. Navy, courtesy of flickr.com. Photo from the The Evening World. (New York, N.Y.) 1887-1931, 04 June 1912, Final Edition-Extra, Image 1, courtesy of chroniclingamerica.loc.gov. Which struck the edge of a reef while preparing for speed trials and was saved from probable serious damage by the construction of her compartments. Newest American Battleship Runs 44 Feet Over a Reef in Penobscot Bay. Naval System of Small Compartments in the Hull Saves the Great Ship from Serious Harm. Image and text provided by Library of Congress, Washington, DC. Photo from the New-York Tribune. (New York [N.Y.]) 1866-1924, 05 June 1912, Image 5, courtesy of chroniclingamerica.loc.gov. 1.09k BIG BATTLESHIP IN DRYDOCK. 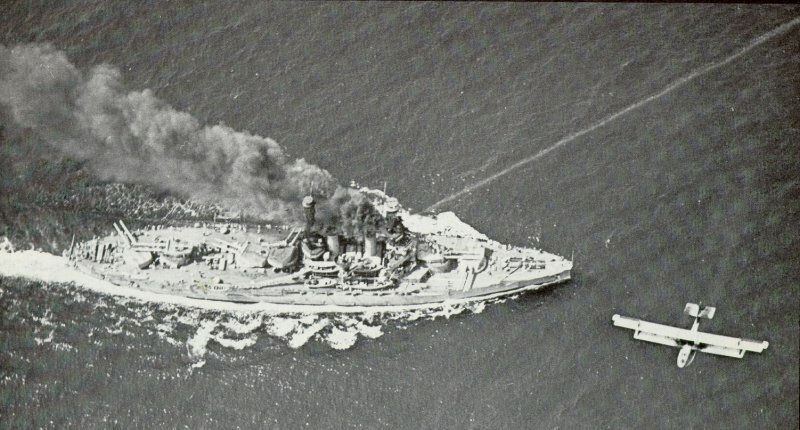 During her speed trials off the coast of Maine the other day, the new battleship Arkansas (BB-33) ran onto an uncharted reef that damaged her bottom and forced her into drydock. Despite the accident the powerful destroyer exceeded her contract speed of 20& 3/4 knots by attaining 21 & 1/2 knots an hour. Image and text provided by Louisiana State University; Baton Rouge, LA. Photo from the The Colfax Chronicle. (Colfax, Grant Parish, La.) 1877-1981, 20 July 1912, Image 6, courtesy of chroniclingamerica.loc.gov. 877k NEW BATTLESHIP ARKANSAS (BB-33) IS THOUGHT TO BE FASTEST VESSEL OF HER CLASS. Image and text provided by University of Utah, Marriott Library. Photo from the The Evening Standard. (Ogden City, Utah) 1910-1913, 14 September 1912, Image 11, courtesy of chroniclingamerica.loc.gov. 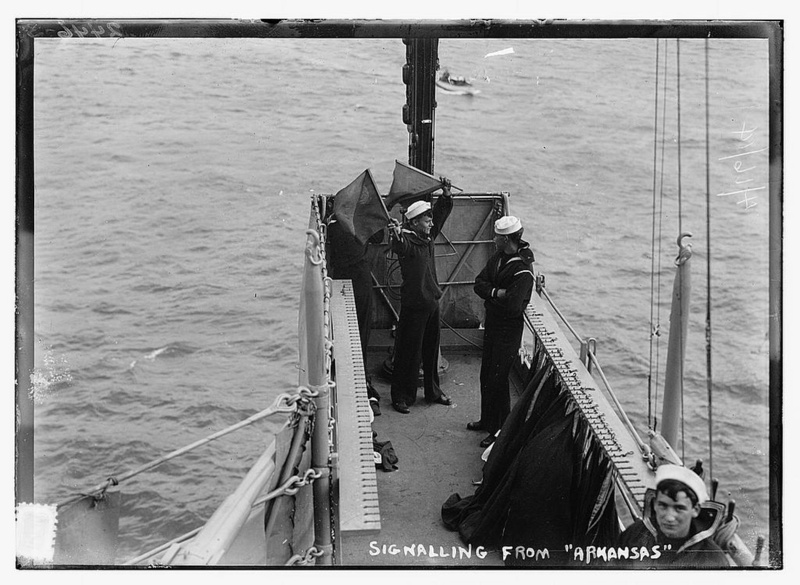 142k Civilians stroll the deck of the Arkansas (BB-33), possibly on 14 October 1912 during the Naval Review. Digital ID: # 2404820229_c65d6780c9. Source: Library of Congress Prints and Photographs Division, from the George Grantham Bain Collection, courtesy of Tom Kermen. 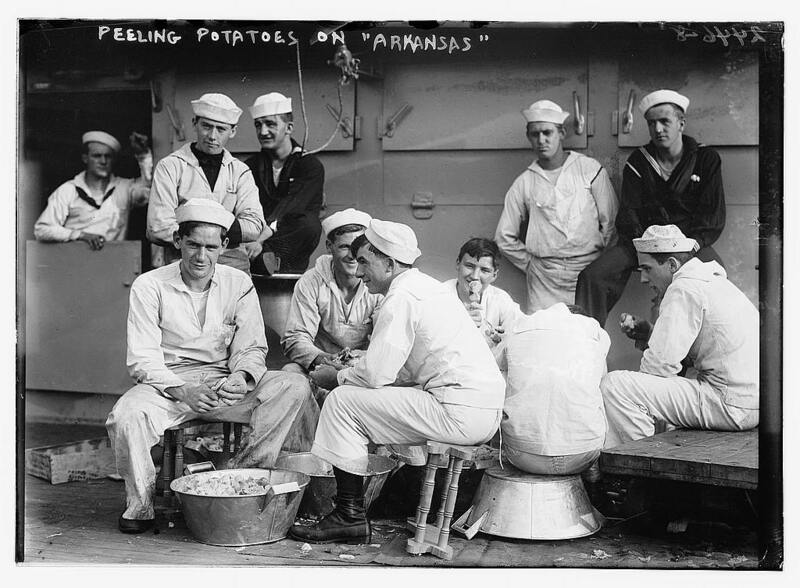 141k Peeling potatoes on the Arkansas (BB-33). Digital ID: # 2387161881_f1e8fd92ab_o. LC-B2-2446-8. Source: Library of Congress Prints and Photographs Division, from the George Grantham Bain Collection, courtesy of Tom Kermen. 315k Playing Ace y-ducey on the Arkansas (BB-33). Digital ID: # 2387992624_c2b49c7370_o. LC-B2-2446-9. Source: Library of Congress Prints and Photographs Division, from the George Grantham Bain Collection, courtesy of Tom Kermen. 305k Signaling from the Arkansas (BB-33). Digital ID: ggbain 10838. # 2387991768_541b175986_o. LC-B2-2446-5. Source: Library of Congress Prints and Photographs Division, from the George Grantham Bain Collection, courtesy of Tom Kermen. 188k Captain Roy Campbell Smith was the commanding officer of the battleship Arkansas (BB-33) from 17 September 1912 to 13 October 1914. Photo courtesy of the Library of Congress via Bill Gonyo. 154k Port side underway, 15 October 1912. National Archives photo # 19-N-13581. 554k President Taft and Secretary Meyer on Their Inspection Visit to Super-Dreadnought Arkansas (BB-33). Image and text provided by University of Utah, Marriott Library. Photo from the The Logan Republican. (Logan, Utah) 1902-1924, 05 November 1912, Image 1, courtesy of chroniclingamerica.loc.gov. 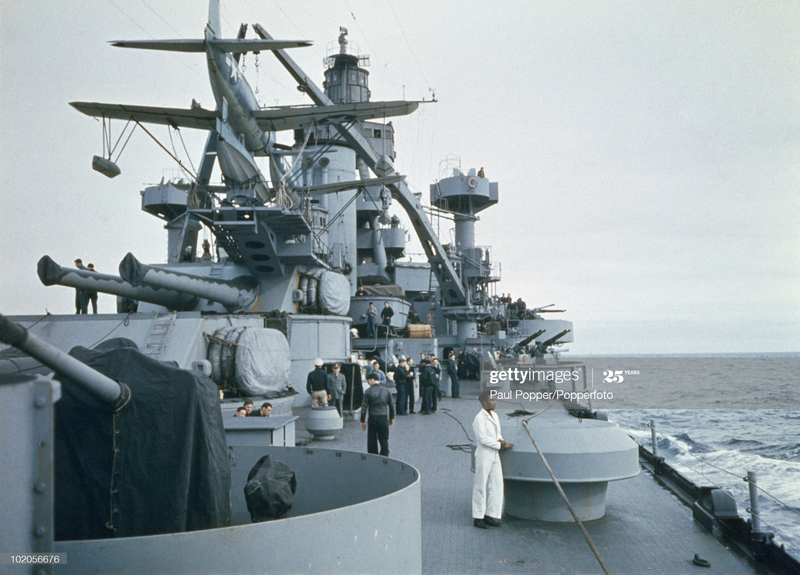 549k Battleship Arkansas (BB-33) Mightiest In World; Interesting View of Life on Board Her. Image and text provided by University of Utah, Marriott Library. Photo from the The Logan Republican. (Logan, Utah) 1902-1924, 09 November 1912, Image 1, courtesy of chroniclingamerica.loc.gov. 110k Unknown battleship photo quite likely taken during trials or shakedown period due to the text written "Making twenty knots" possibly circa 1912-13. 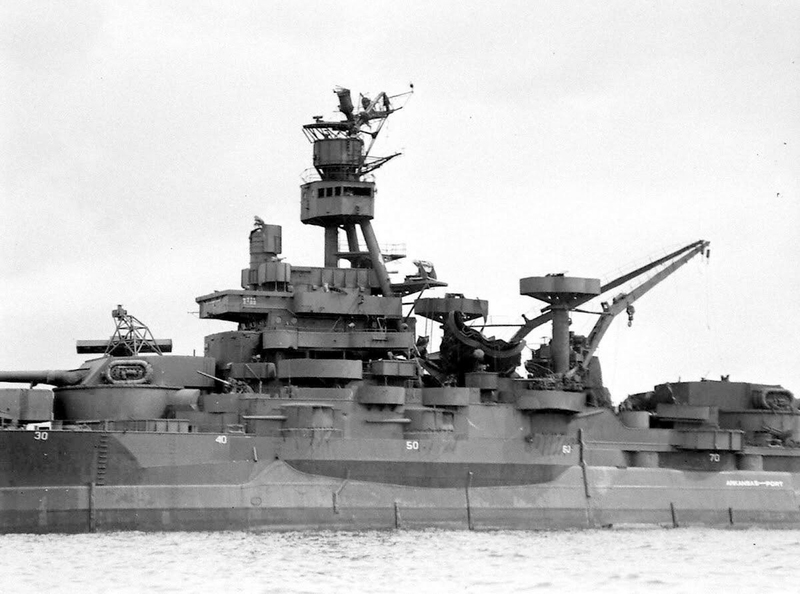 Short Answer: This is either the Wyoming (BB-32) or Arkansas (BB-33). Key Clues: Conning Tower in front of Signal Bridge Deck, which angles back from the tower, wet 5"/51 guns below this deck, saluting battery above, command bridge on mast above, and arrangement of search lights. Long Answer: The date of the photo is definitely prior to America's entry into WW I. The British insisted that an enclosed pilot houses was a necessity when operating in the North Atlantic and North Sea and the USN added them to all battleships sent to England. The only weather protection this ship has is awnings and the canvas wind/spray breaks tied to the deck stanchions. The other clue is the search lights on top of the boat cranes rather than a 3" AA gun; another addition before going "Over There". This is definitely a 12" gunned dreadnought but not one of the South Carolina's (BB-26/27). They have a prominent plated supports at the outer edge of the signal bridge which would be visible where the 5"/51 is peeking out above the awning. Also note the saluting guns on the deck above. The Delaware class (BB-28 / 29) originally had the forward most 5"/51 guns in casemates on the second deck foreword of the No. 1 barbette. 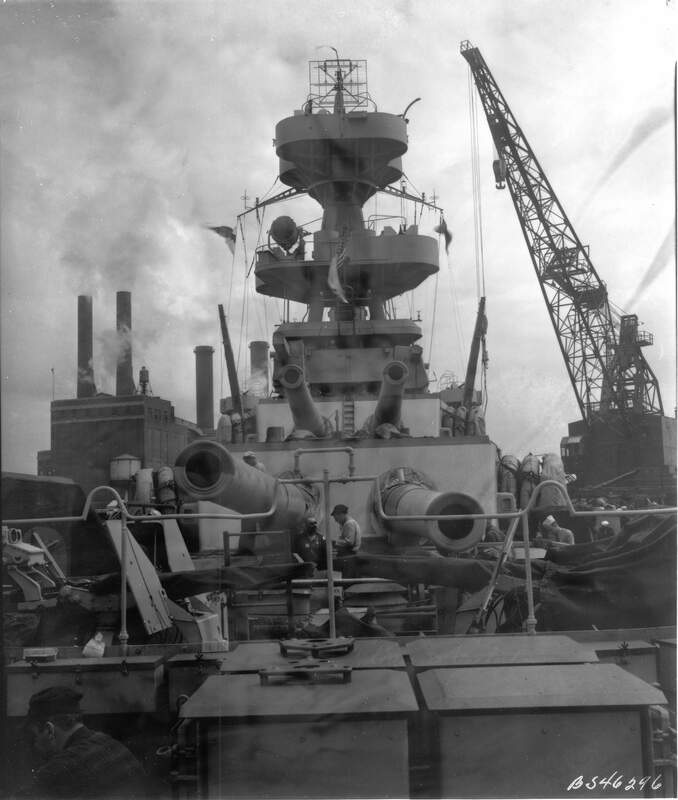 This proved to be too wet and the casemates were removed and plated over and the guns were move to a "wet" mount on the 02 Deck beside the foremast and under the signal bridge deck (03 deck). 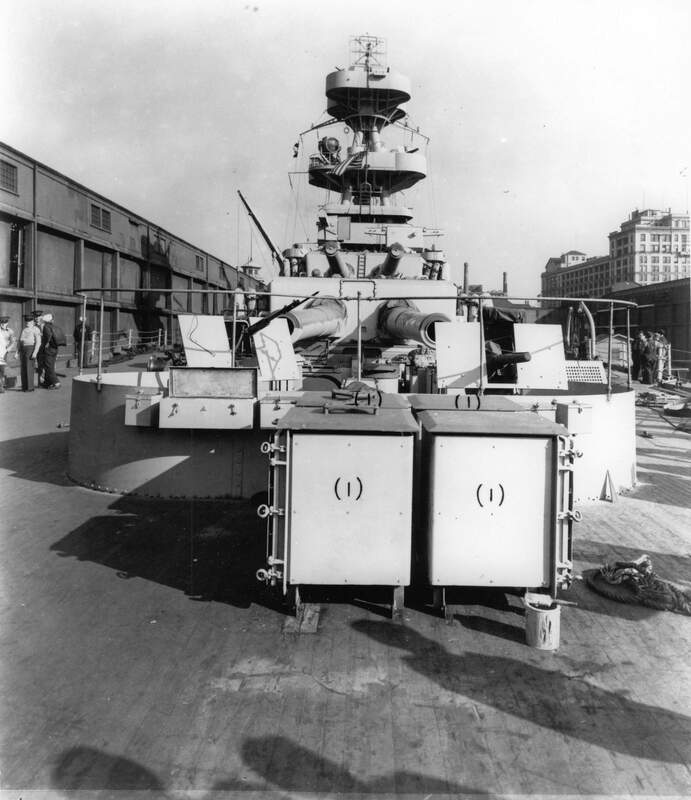 The 03 deck also completely surrounds the conning tower allowing a walkway in front of the conning tower. The ship in the photo lacks this walkway. Also I have not seen any photos of either Delaware (BB-28) or North Dakota (BB-29) with only 2 searchlights mounted on the foremast in an over/under arrangement. So I do not think this either of the Delaware's. The Florida's (BB-30/31) can be eliminated as all of this class' secondary battery were mounted in casemates in the forecastle or on the Second Deck amidships and aft. They have no "wet" mount 5"/51's though the saluting battery was located in this position. Also their signal bridge deck extends straight back from the conning tower to the bridge wings, which extends outboard perpendicularly. 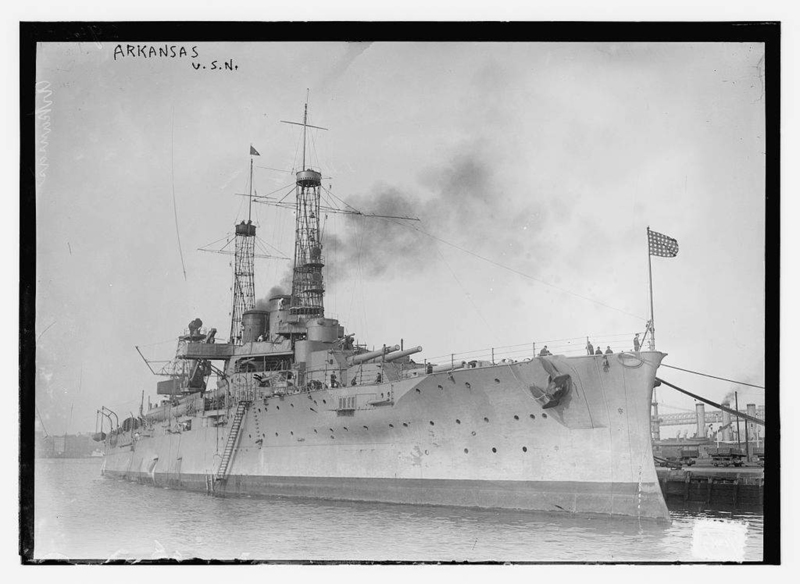 The USNHC page for the "Arkansas" has a photo album from a European cruise taken in the fall of 1913, just a year after commissioning. 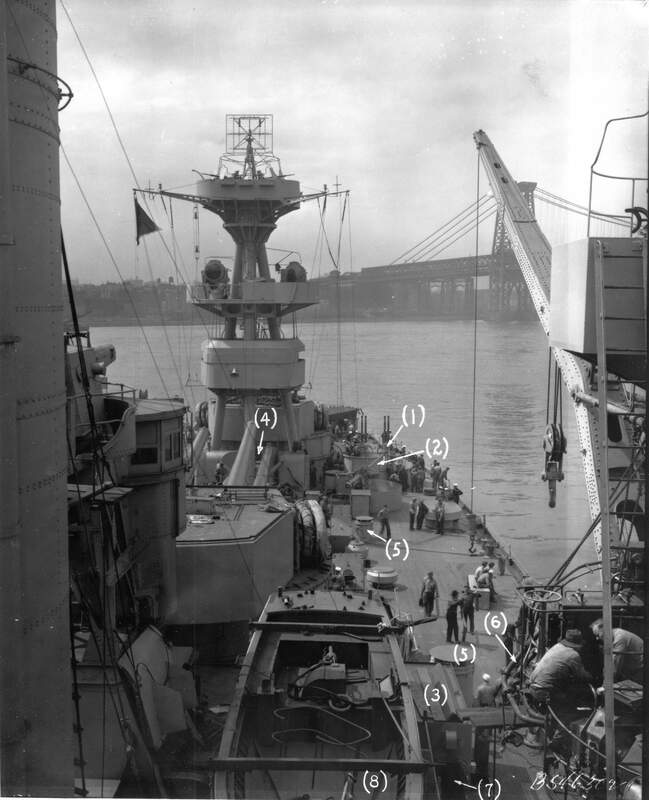 The first photo is an over-all picture of the Arkansas in which she is carrying the same search light arrangement as in this photo. 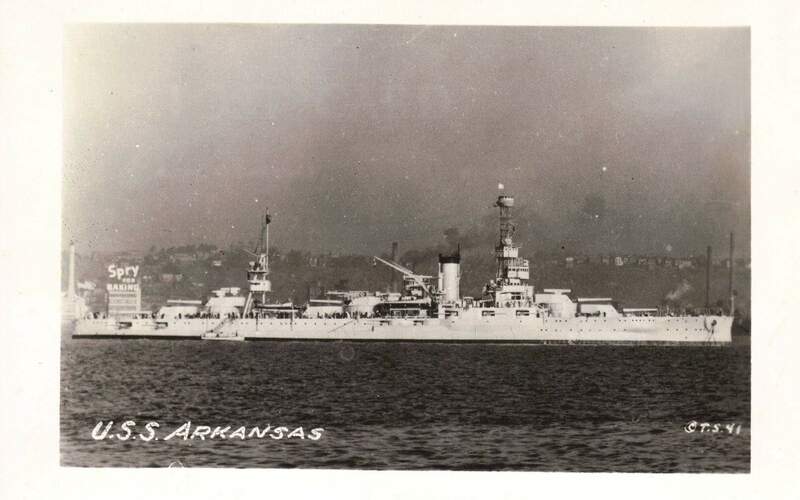 Assuming that the cover photo from the album was taken at the same time as the other photos, its reasonable to assume that it represents the Arkansas at or near the time of commissioning. 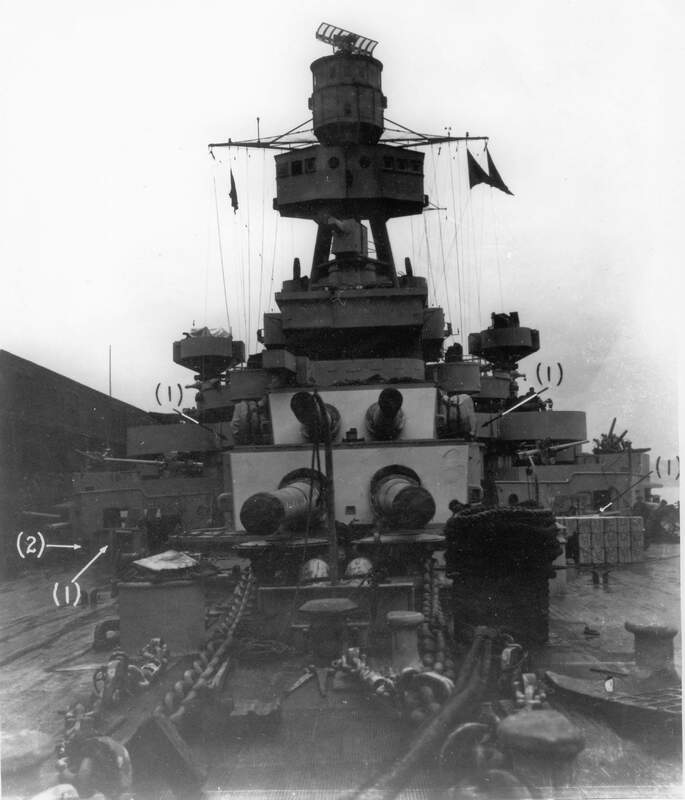 Photos of the Wyoming attributed to her trials show her sporting 6 search lights mounted on the fore mast. All of this suggest that the photo is probably the Arkansas in 1912 or 1913. USN photo courtesy of Jerry Crow. Photo I.d. & text courtesy of Chris Hoehn. 2.72k Arkansas (BB-33) taken shortly after commissioning. The searchlights match the configuration in the fitting out photos. Some of the other dates are suspect because the number of searchlights gradually increased through the WW-I era. Some low-number-of-lights photos are listed as later in the decade while some higher-number-of-lights photos are listed as shortly after commissioning. By 1919, additional platforms began to be added, narrowing the window for dating those shots. Photo i.d. & text courtesy of Richard Jensen. Photo copyright by Waterman, Hampton VA., courtesy of David A. Jones, MMCM(SW), USN Retired. 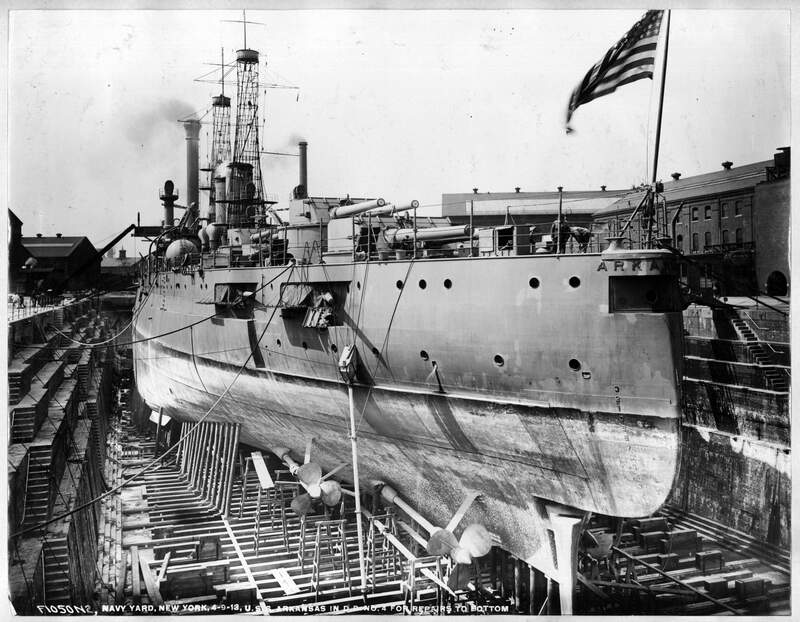 662k Arkansas (BB-33) in dry dock # 4 at the New York Navy Yard for repairs to bottom, 9 April 1913. Photo No. f1050n2, New York Navy Yard Archive - courtesy National Archive and Records Administration, Northeast Region - NYC, Record Group 181 via flickr.com. The Superdreadnought Arkansas (BB-33) coming bow on down the the East River having passed under the Brooklyn Bridge which is seen in the background. Damage Inflicted by Accident in Cuban Waters repaired and She Leaves Navy Yard to Rejoin the North Atlantic Squadron. Photograph by Edward M. Mitchell courtesy of Tommy Trampp. Photo by New-York Tribune. (New York [N.Y.]) 1866-1924, 26 May 1913, Image 14, courtesy of chroniclingamerica.loc.gov. One of the Most Remarkable Photographs Ever Taken, Showing the Dreadnought Arkansas Firing a Broadside of Big Guns During the Recent Target Practise Off the Virginia Capes, in which the World's Big Gun Record Was Made. The Diagram Shows Why the Record, which Was Made On a Small Target at One Mile, Was as Good as if it Had Been at Made Ten Miles on the Larger Targets Used for Longer Ranges. Image and text provided by Library of Virginia; Richmond, VA.
Photo from the The Times Dispatch. (Richmond, Va.) 1903-1914, 12 October 1913, Image 49, courtesy of chroniclingamerica.loc.gov. 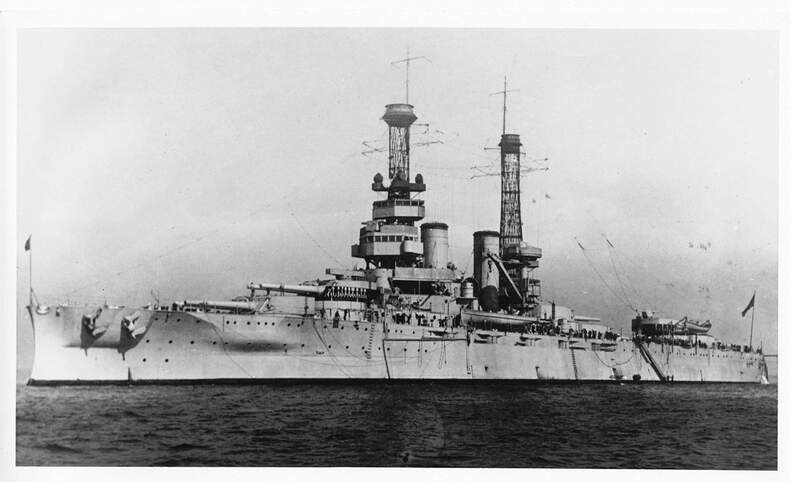 319k Delaware (BB-28) with what probably are Utah (BB-31) & Arkansas (BB-33) in 1913. Photo i.d. courtesy of Chuck Haberlein & Ronald J. Nash. 1.84k Vessels Alongside Pier D Looking Southwest from Pier E, 18 December 1913. 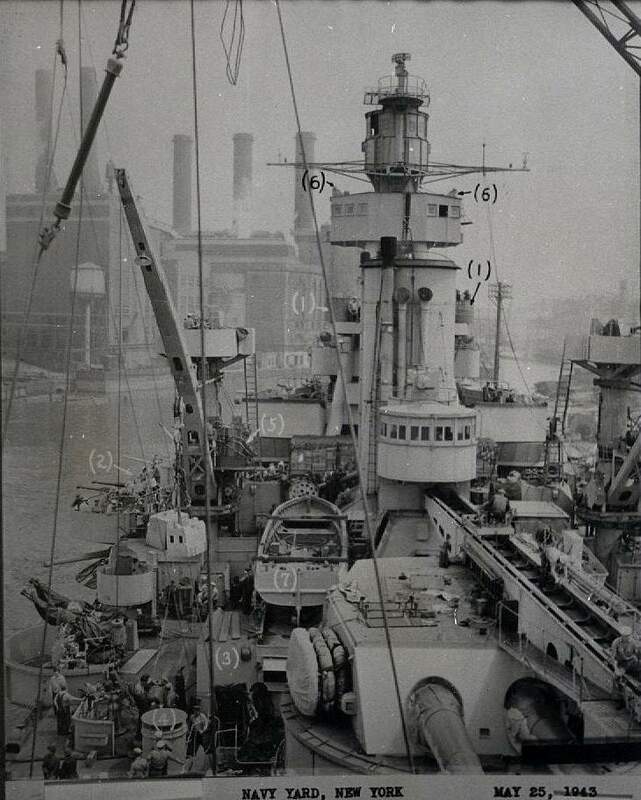 New York (BB-34) fitting out with Arkansas (BB-33) behind. One of the Delaware's (BB-28/29) is beyond them. Photo i.d. & text courtesy of Richard Jensen. 83k December 1913 – Rear Admiral Cameron McRae Winslow, commanding the first division, made the Arkansas (BB-33) his flagship. 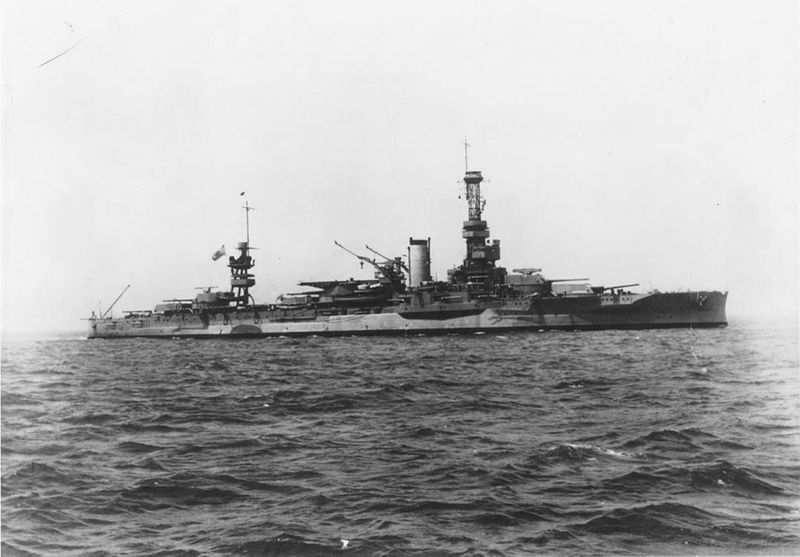 The first division also included the battleships Florida (BB-30), Utah (BB-31), Delaware (BB-28), and New York (BB-34). 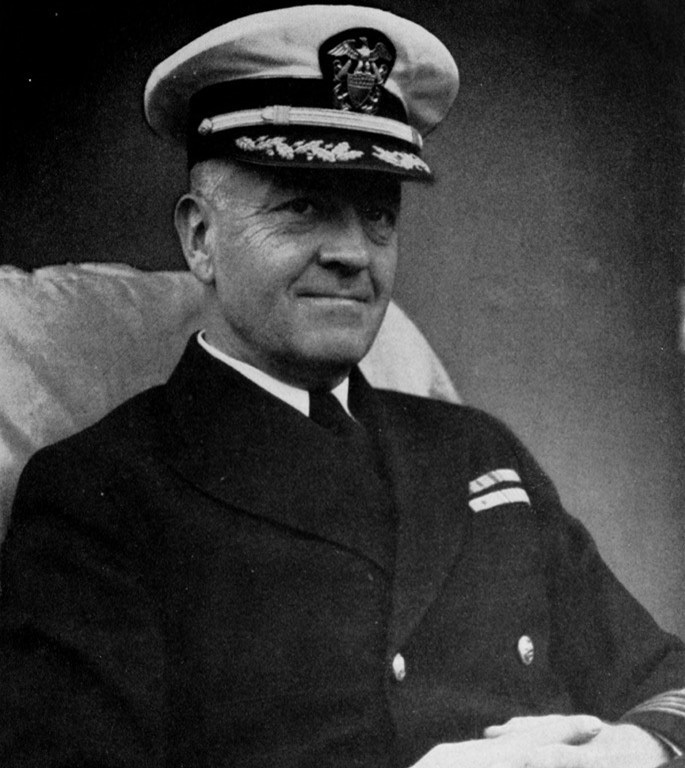 After Rear Admiral Charles J. Badger retires Winslow will become Commander in Chief of the Atlantic Fleet. Rear Admiral Frank E. Beatty will replace Winslow as Commander of First Division. Digital ID: # ggbain 12540. Source: Library of Congress Prints and Photographs Division, courtesy of Bill Gonyo. 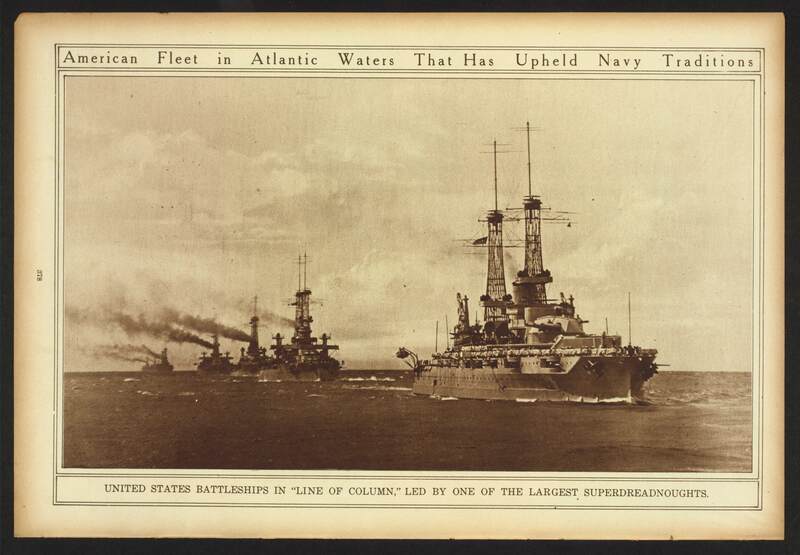 1.72k BATTLESHIP ARKANSAS (BB-33) FIGHTS WINDS AND TIDE Image and text provided by The New York Public Library, Astor, Lenox and Tilden Foundation. Photo from the The Sun. (New York [N.Y.]) 1833-1916, 03 April 1914, Image 7, courtesy of chroniclingamerica.loc.gov. 671k Arkansas (BB-33) shows her stern armament with the fleet in cold weather during 1914. Photographer: Enrique Muller, Jr.
BATTLESHIP ARKANSAS (BB-33), FLAGSHIP OF THE ATLANTIC FLEET ORDERED TO TAMPICO. Image and text provided by Library of Congress, Washington, DC. Photo by New-York Tribune. (New York [N.Y.]) 1866-1924, 15 April 1914, Image 1, courtesy of chroniclingamerica.loc.gov. 1.41k DREADNOUGHT Arkansas (BB-33), Flagship of the Fleet. Image and text provided by Library of Virginia; Richmond, VA.
Photo from the The Times Dispatch. (Richmond, Va.) 1903-1914, 16 April 1914, Image 1, courtesy of chroniclingamerica.loc.gov. 2.15k OUR MUTUAL GIRL INSPECTS THE BATTLESHIP ARKANSAS (BB-33). Image and text provided by Montana Historical Society; Helena, MT. Photo from the The Daily Missoulian. (Missoula, Mont.) 1904-1961, 19 April 1914, Morning, Image 14, courtesy of chroniclingamerica.loc.gov. 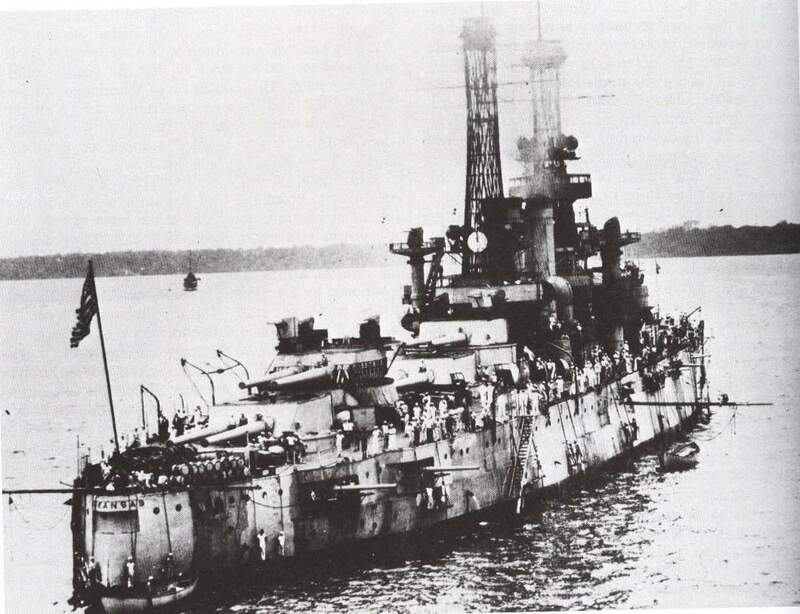 1.62k PROWS OF AMERICAN BATTLESHIPS ARE TURNED TOWARD TAMPICO, MEXICO. Image and text provided by Washington State Library; Olympia, WA & Library of Congress, Washington, DC. Photo from the The Tacoma Times. Tacoma, Wash.) 1903-1949, 21 April 1914, Image 8, & by Evening Star. (Washington, D.C.) 1854-1972, 15 April 1914, Image 2, courtesy of chroniclingamerica.loc.gov. 1.19k ALERT LIFE ON THE BRIDGE OF AN AMERICAN BATTLESHIP. 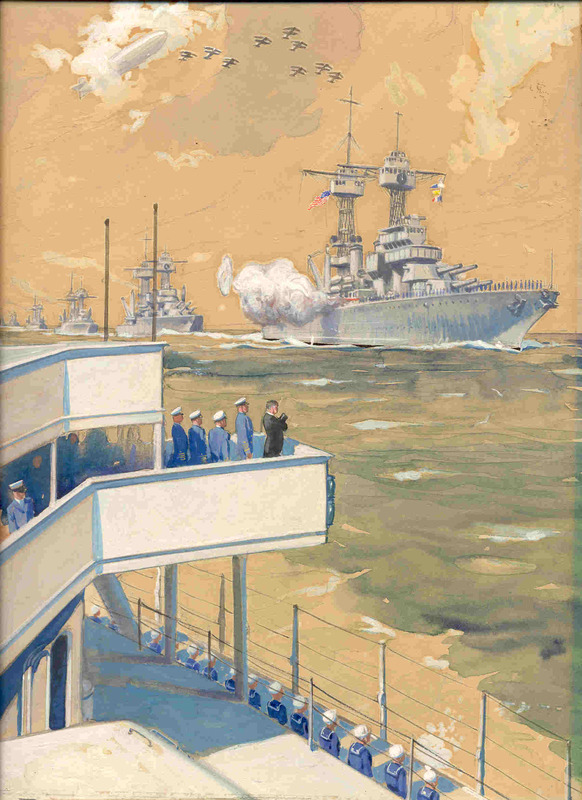 The drawing shows Admiral Winslow on the deck of the Arkansas (BB-33) in November 1913. From a Painting by Henry Reuterdahl Image and text provided by The New York Public Library, Astor, Lenox and Tilden Foundation. Photo from the The Sun. (New York [N.Y.]) 1833-1916, 26 April 1914, FOURTH SECTION PICTORIAL MAGAZINE, Image 35, courtesy of chroniclingamerica.loc.gov. 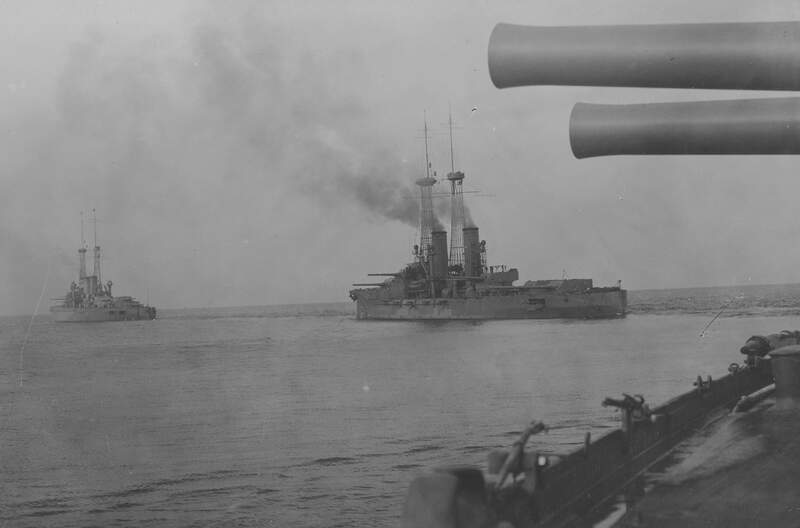 88k Battleships of the U.S. Atlantic Fleet steaming in column formation, circa 1914. 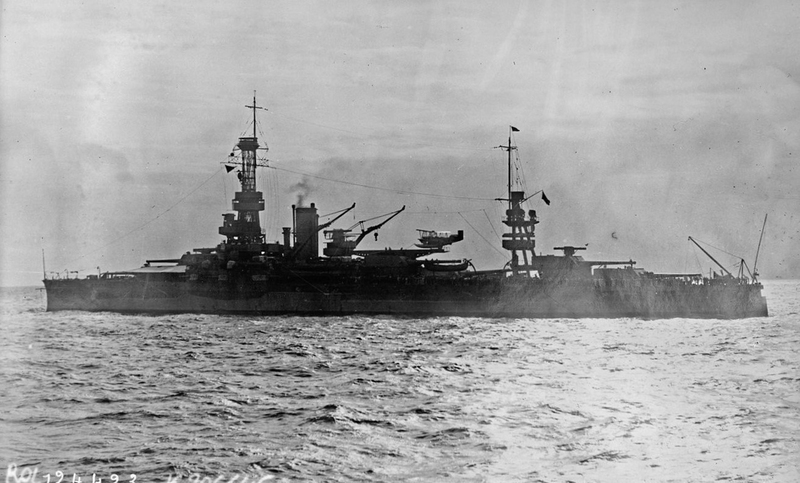 The leading ship is either Wyoming (BB-32) or Arkansas (BB-33). Note the dense smoke produced by these coal-burning ships. USNHC # NH 105079 Photographed by Enrique Muller, New York. 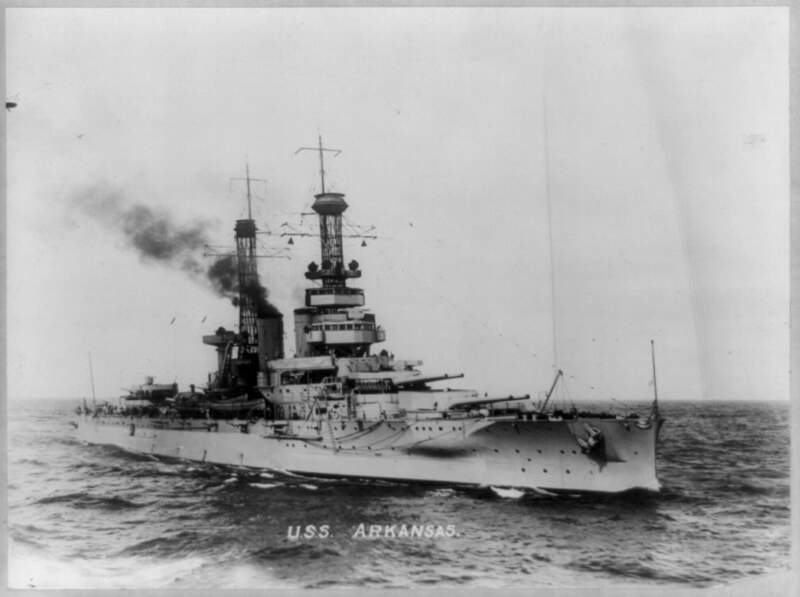 3.73k OUR FLAGSHIP, ARKANSAS (BB-33). Admiral Badger going aboard his flagship, the Arkansas, at Old Point, just before she sailed for Tampico. Image and text provided by Washington State Library; Olympia, WA & Library of Congress, Washington, DC. Photo from the The Tacoma Times. Tacoma, Wash.) 1903-1949, 21 April 1914, Image 8, & by The Washington Times. (Washington [D.C.]) 1902-1939, 30 April 1914, HOME EDITION, Image 3, courtesy of chroniclingamerica.loc.gov. 435k CAPTAIN SMITH OF BATTLESHIP ARKANSAS (BB-33). Image and text provided by Oklahoma Historical Society. Photo by The Chickasha Daily Express. (Chickasha, Indian Territory [Okla.]) 1899-current, 27 April 1914, Image 1, courtesy of chroniclingamerica.loc.gov. 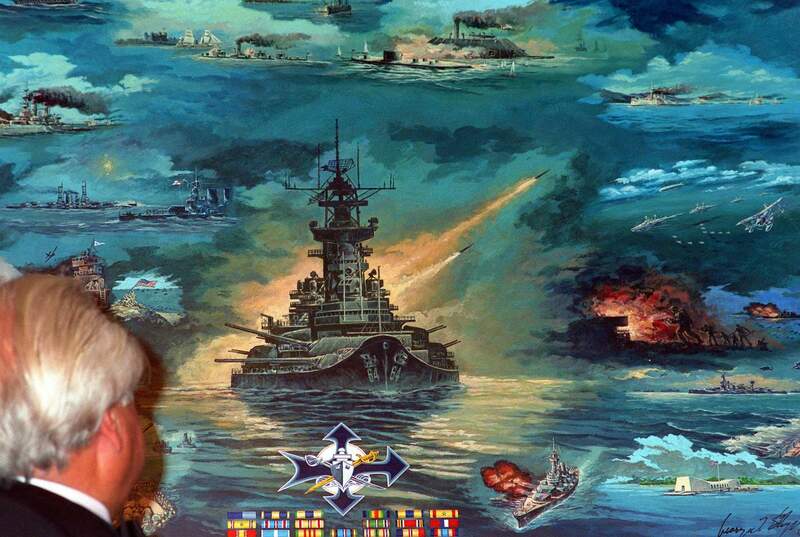 676k Sailor of Battleship Arkansas (BB-33) Describes How Snipers Picked Off Uncle Sam's Fighters and Then Got Their Deserts. Image and text provided by The New York Public Library, Astor, Lenox and Tilden Foundation. Photo from the The Evening World. (New York, N.Y.) 1887-1931, 08 May 1914, Baseball Final, Image 4, courtesy of chroniclingamerica.loc.gov. 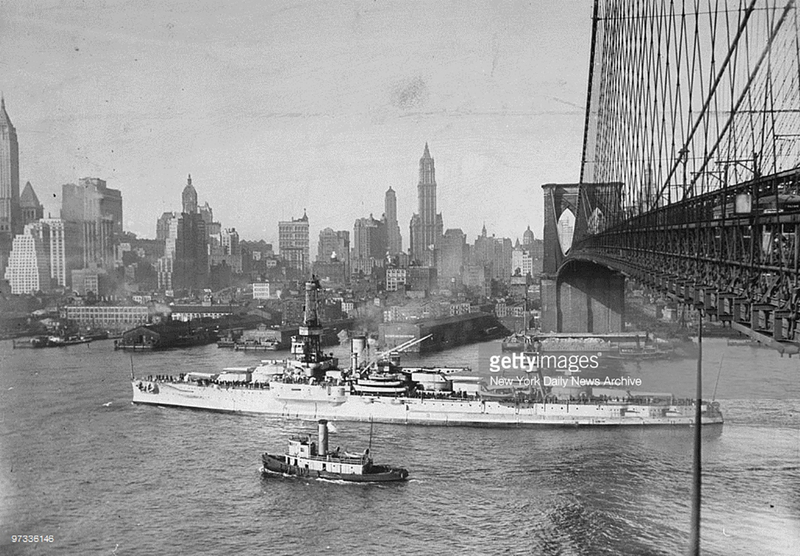 Super-dreadnought Arkansas (BB-33) passing under the Brooklyn Bridge on her way to join the fleet. Image and text provided by The New York Public Library, Astor, Lenox and Tilden Foundation. Photo from the The Sun. ((New York [N.Y.]) 1833-1916, 17 January 1915, Image 8, courtesy of chroniclingamerica.loc.gov. 2.40k Prize winning gun crews of the United States battleship Arkansas (BB-33) receiving trophies from Captain Roy C Smith while on the high seas. In addition to a cash prize, each man may wear the coveted letter "E" (for excellence) until his gun crew is defeated in a future competition. Image and text provided by Minnesota Historical Society; Saint Paul, MN. Photo from Warren Sheaf. (Warren, Marshall County, Minn.) 1880-current, 17 March 1915, Image 9, via chroniclingamerica.loc.gov. 4.46k Salvo fired at a target by the battleship Arkansas (BB-33) in the recent maneuvers as observed at close range from a sister ship. Photo by Underwood & Underwood. Text courtesy of N.Y. Times, 20 June 1915, Page 9, courtesy of memory.loc.gov. 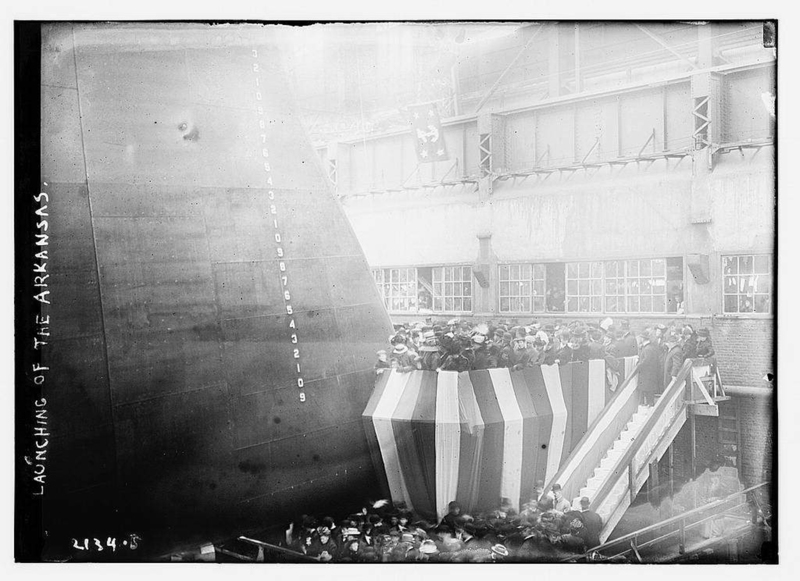 182k Panoramic view of the crowd visiting the Arizona (BB-39) and the Superdreadnought Arkansas (BB-33) after the launching. Photo by Gorodess from Underwood & Underwood & text from the N.Y. Times, 27 June 1915, page 1, courtesy of memory.loc.gov. 397k N.Y.N.Y. ; 1 November 1915, waterfront looking east. 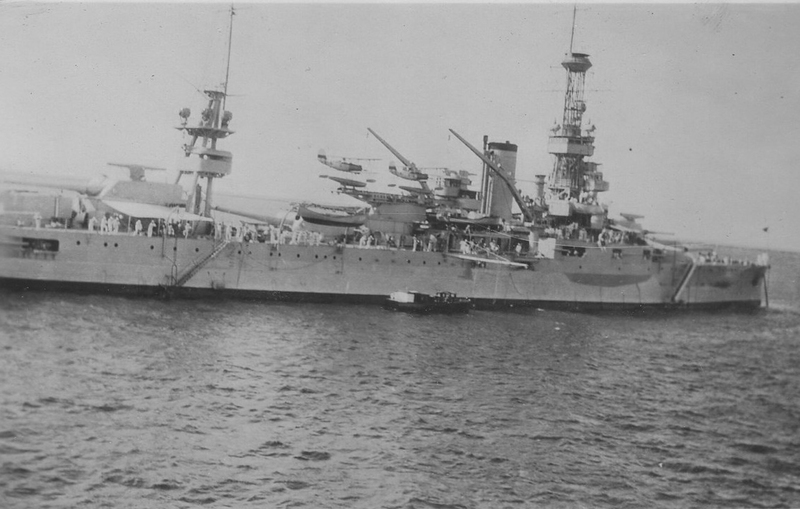 Florida (BB-30) is the ship between Arizona (BB-39) and the camera. 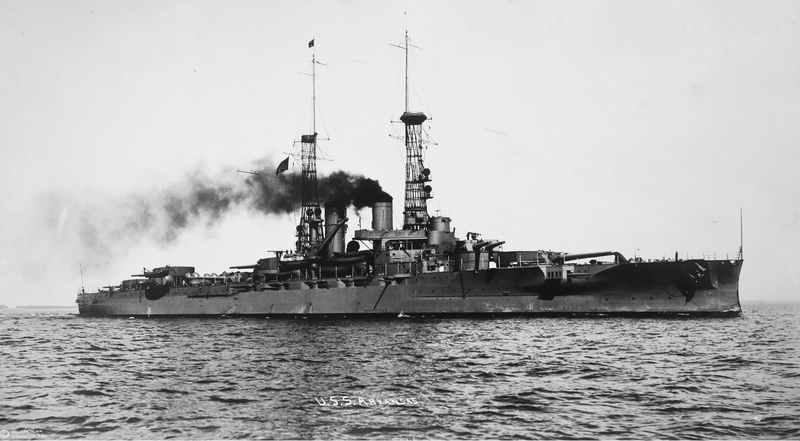 Utah (BB-31) is beyond their sterns. 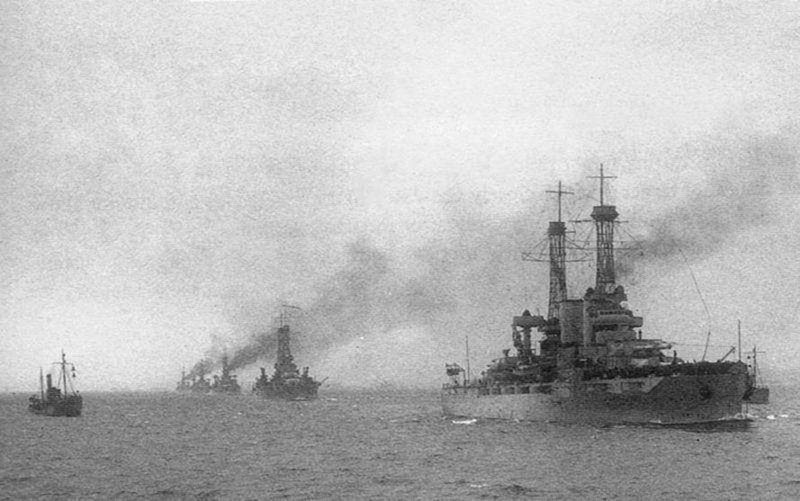 Arkansas (BB-33) is the ship on the left. Partial text courtesy of DANFS. 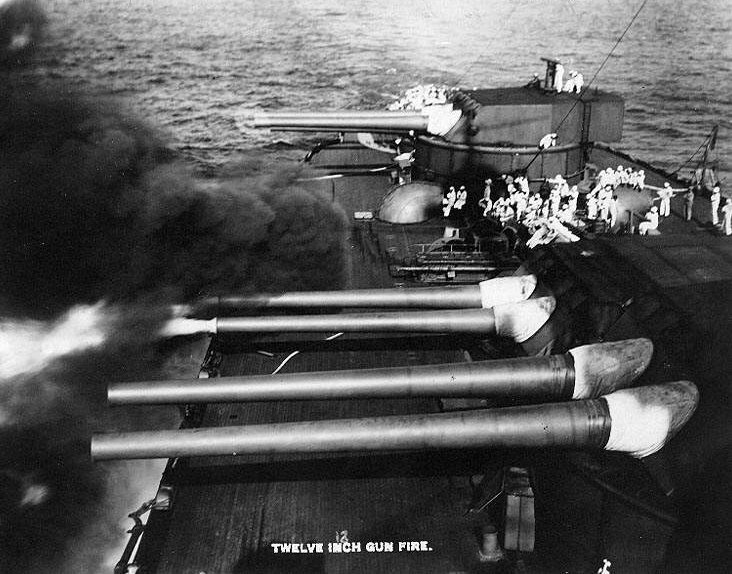 71k Firing the 12"/50 guns of Turret # 4, prior to World War I. 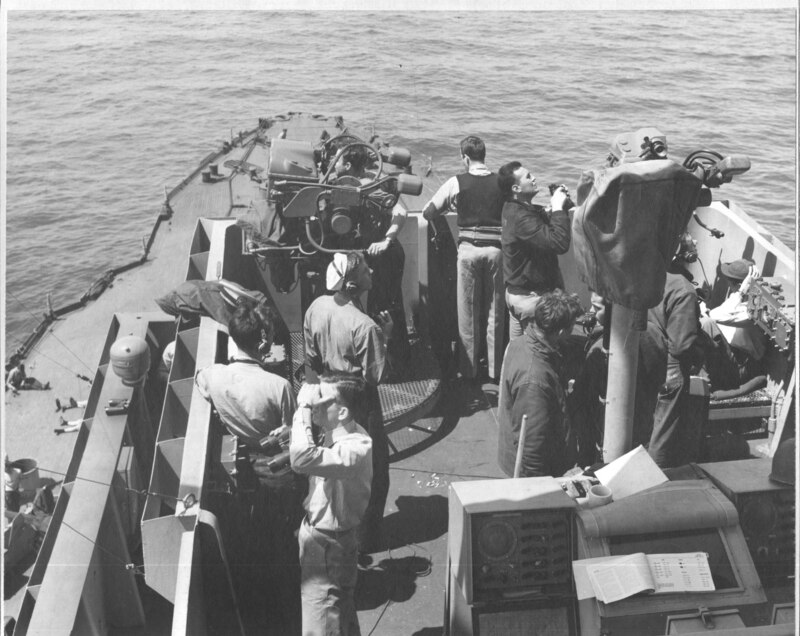 Note rangefinder in use atop Turret # 5 and large number of sailors on deck observing the shoot. National Archives photo # 19-N-63636. 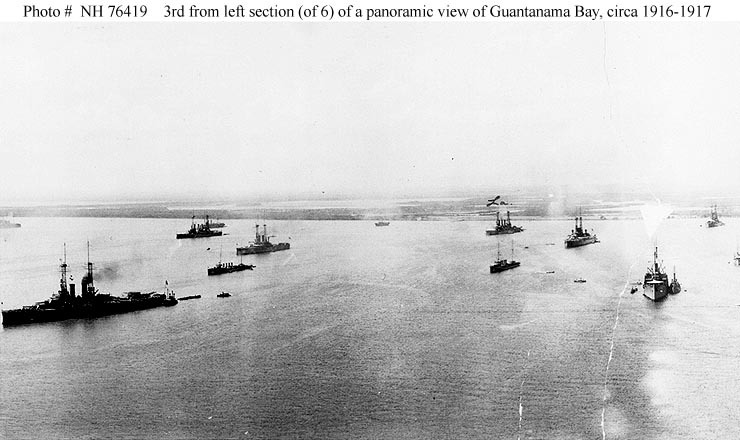 65k U.S. Atlantic Fleet at Guantanamo Bay, Cuba, circa 1916-1917. 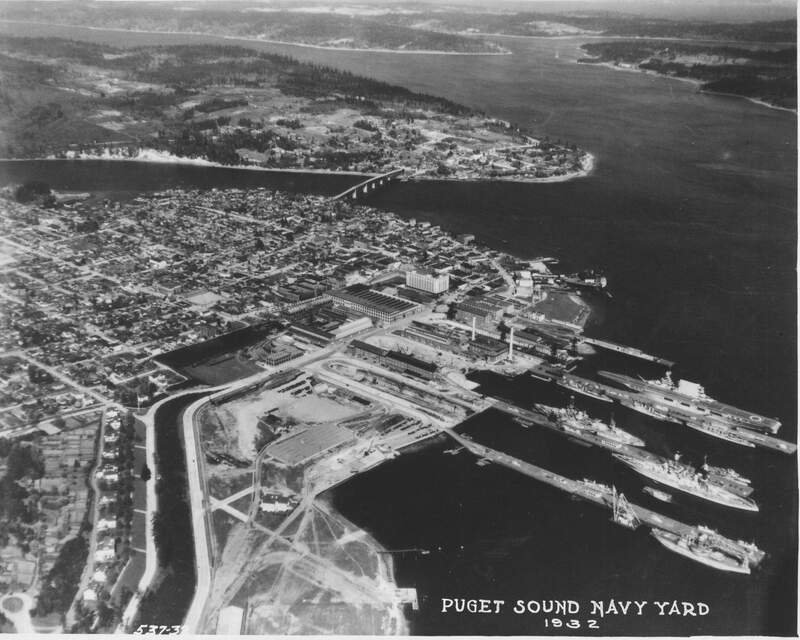 Third section from left (of six) of a panoramic photograph taken from the Naval Station radio tower. 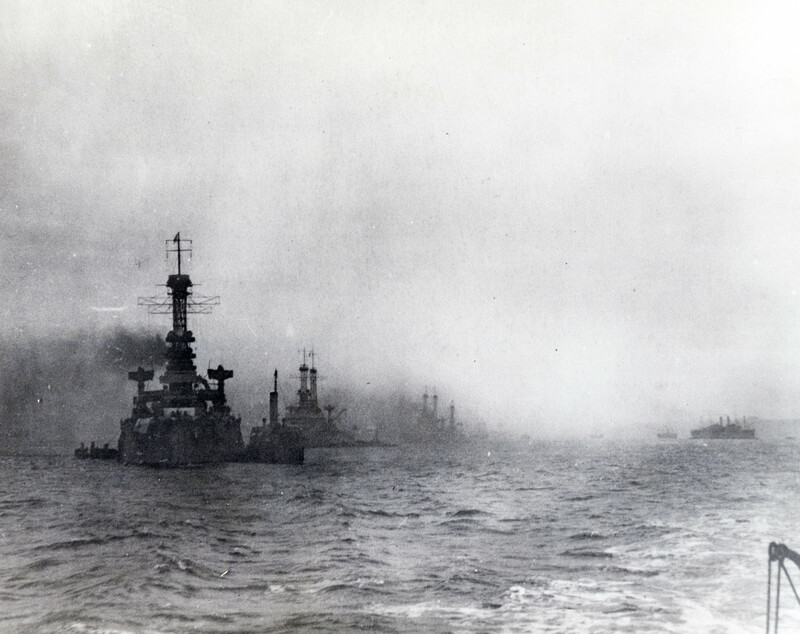 Among the ships present are: a battleship that is either Wyoming (BB-32) or Arkansas (BB-33) (left foreground), minelayers Baltimore (CM-1) and San Francisco (CM-2) (toward the left, far distance), destroyers Nicholson (DD-52) (left center, middle distance) and Cushing (DD-55) (right center, middle distance), and battleship Louisiana (BB-19) (right center, far distance, with "La." written above it). USNHC photo # NH 76419, courtesy of the Naval Historical Foundation, Washington, D.C. Donation of MMC Jesse Forton, USN (Retired), 1972. The photo was taken in very late 1916 or early 1917. 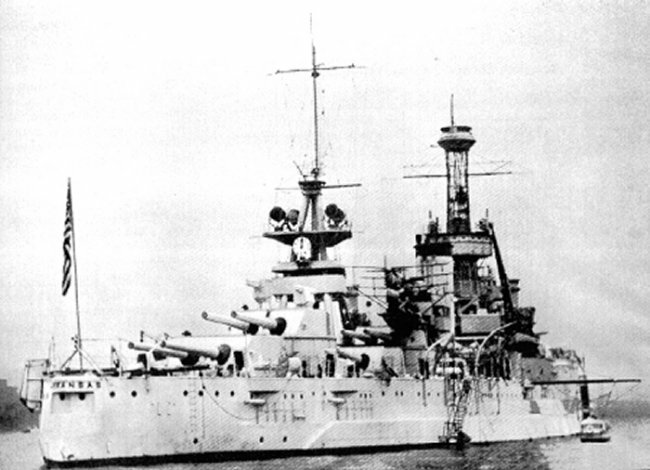 Arizona (BB-39) is in the lead; next in line is Arkansas (BB-33), followed by North Dakota (BB-29) and Wyoming (BB-32). Beyond that, the bow-on silhouettes are too indistinct for an ID. Photo & text i.d. courtesy of Richard M. Jensen. Photo from Page 378 from "The War of the Nations: Portfolio in Rotogravure Etchings: Compiled from the Mid-Week Pictorial"(New York: New York Times, Co., 1919) via flickr.com/library of congress. 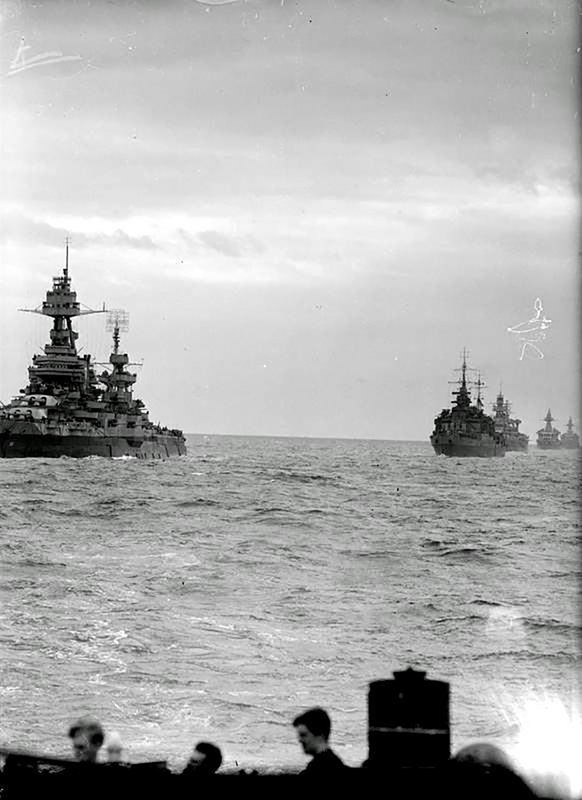 788k Steaming in formation with other Atlantic Fleet battleships, next in line is Arkansas (BB-33), followed by North Dakota (BB-29) during gunnery practice. The same ships are in the same configuration and the same order. The smoke is drifting off to the same side. This would suggest that the two photos are covering the same event. (Contrary to the original caption on this photo, the ship following Arizona can't be either Florida (BB-30) or Utah (BB-31) since neither was flush decked and neither had a raised turret that far separated from the after mast.) Photo & text i.d. courtesy of Richard M. Jensen. USNHC # NH 95244 now in the collections of the National Archives, Courtesy of H.E. Coffer. 350k New York (BB-34) with seven other Battleships of the Atlantic Fleet at Hampton Roads, 1917. 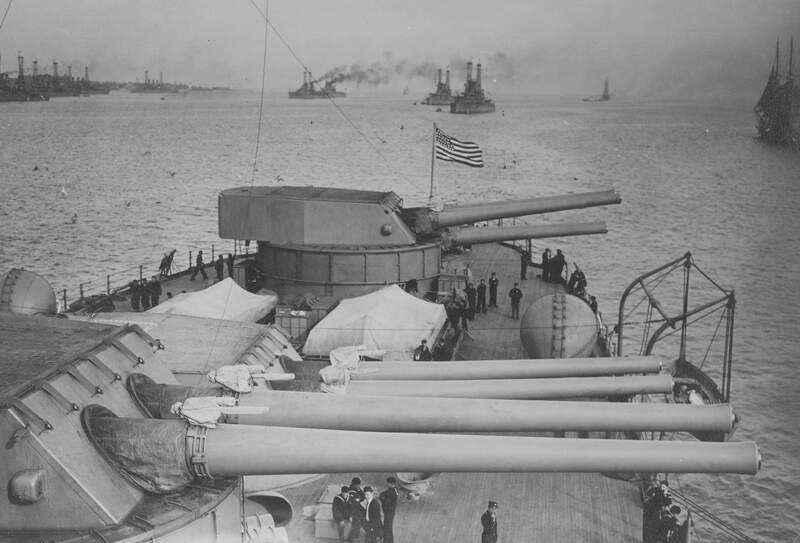 The ship in the foreground (first from the right) is the Arkansas (BB-33). 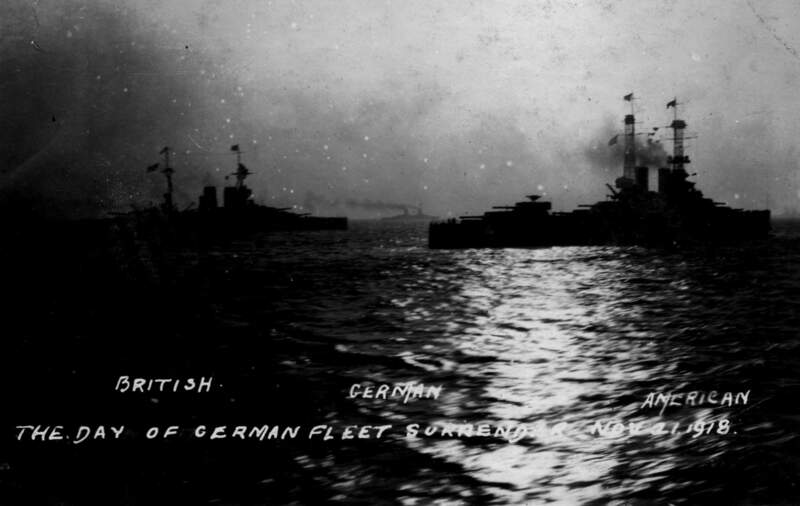 The photo shows a total of 8 battleships sailing in 2 columns. 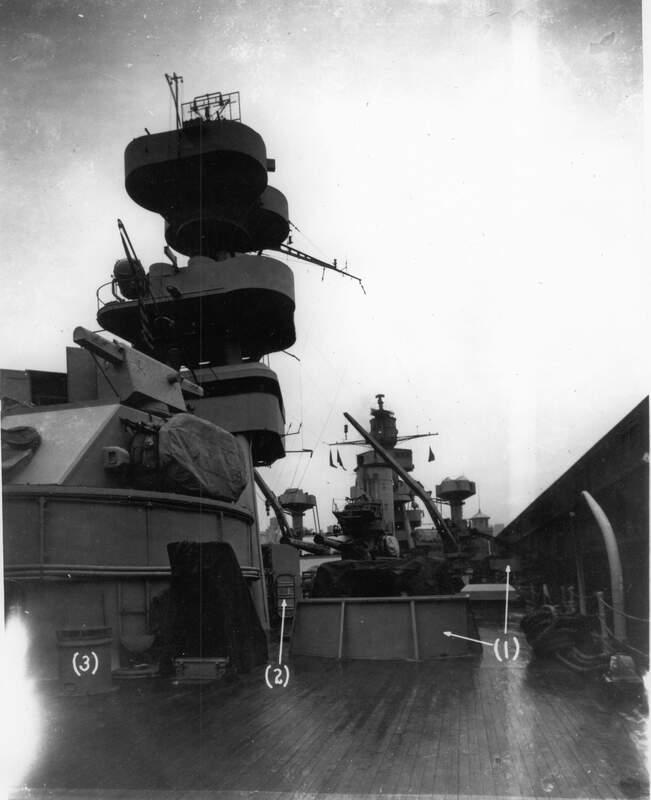 The cage masts of a battleship is showing above the Arkansas' forward turrets and the ship on the far left is actually 2 ships (3 masts) [the right hand of these 2 appears to be bow on to the camera sailing on a different bearing thus only one mast is showing]. 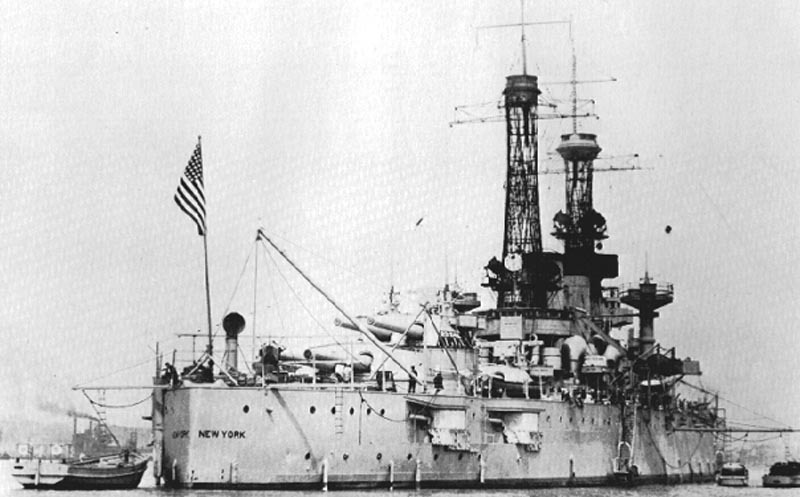 Given the probable date of the photo, the flag on the foremast of Arkansas is probably that of R. Adm. Winslow, which would suggest that the right hand column is probably Battleship Division 1. 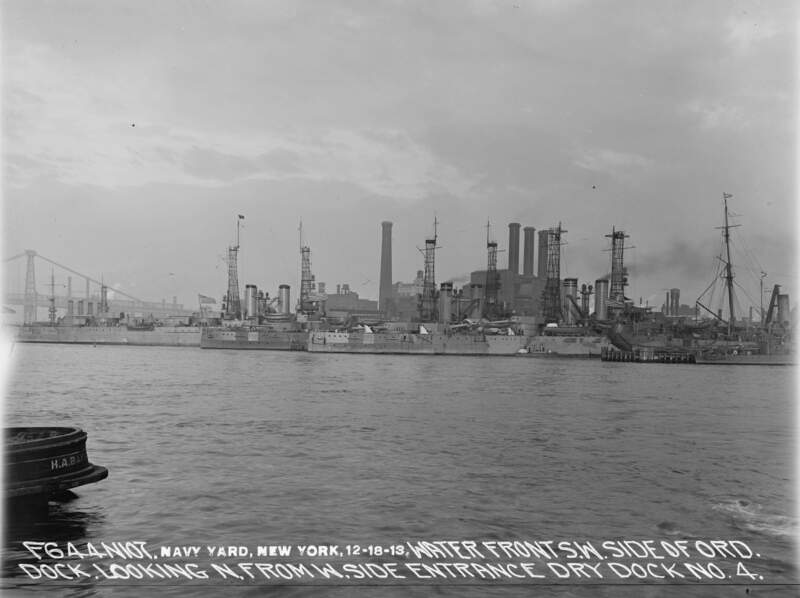 The New York does appear in the photo as the second ship in the right hand column (second closest in the photo) note the 2 forward casemate guns (verses 1 on 12" gunned BB's) and the 2 gun main turrets. 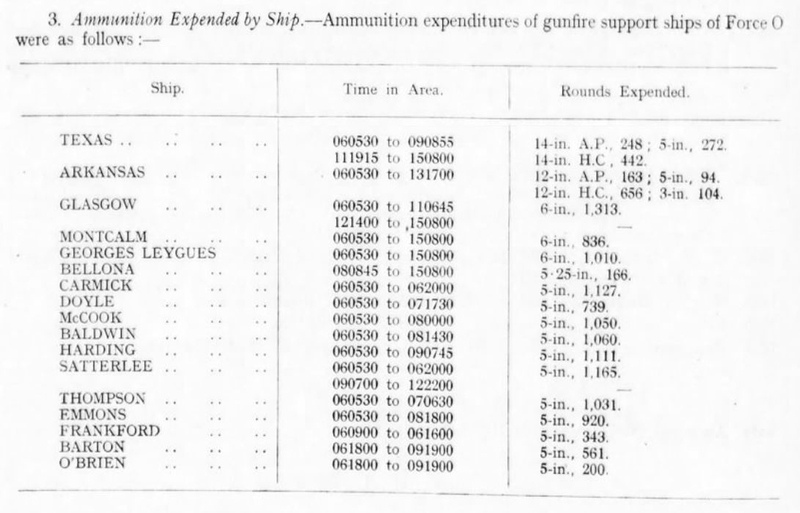 Assuming the the right hand column is division 1, the next 2 ships in that column would be Utah (BB-31) and the Florida (BB-30) (both funnels are between the masts) and the last ship in line (the bow on ship) may be Delaware (BB-28). Library of Congress photo # LC-DIG-hec-08103 courtesy of the Harris & Ewing Collection. 405k From the deck of the Delaware (BB-28): Showing Florida (BB-30) & Arkansas (BB-33) leaving the fleet, 30 November 1917. Photo by Enrique Muller Jr. for the Committee of Public Information. 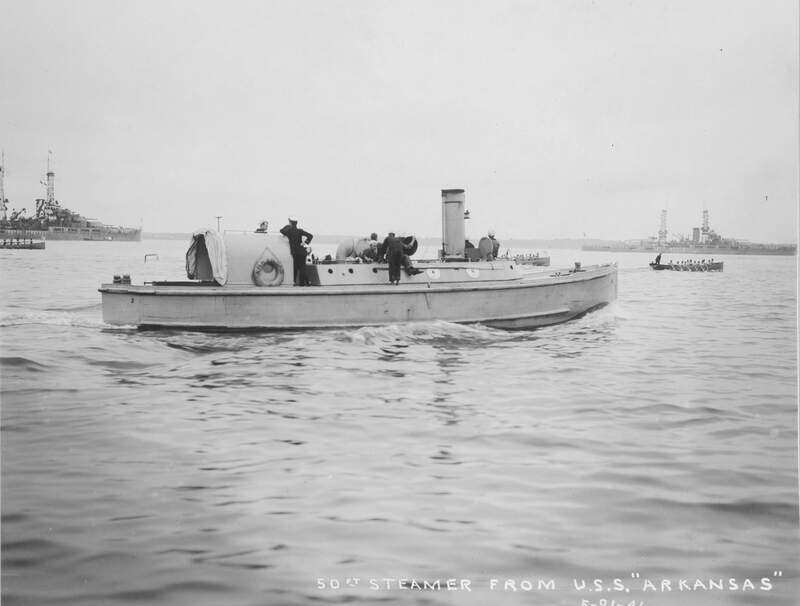 781k 59 foot steamer of the Arkansas (BB-33). 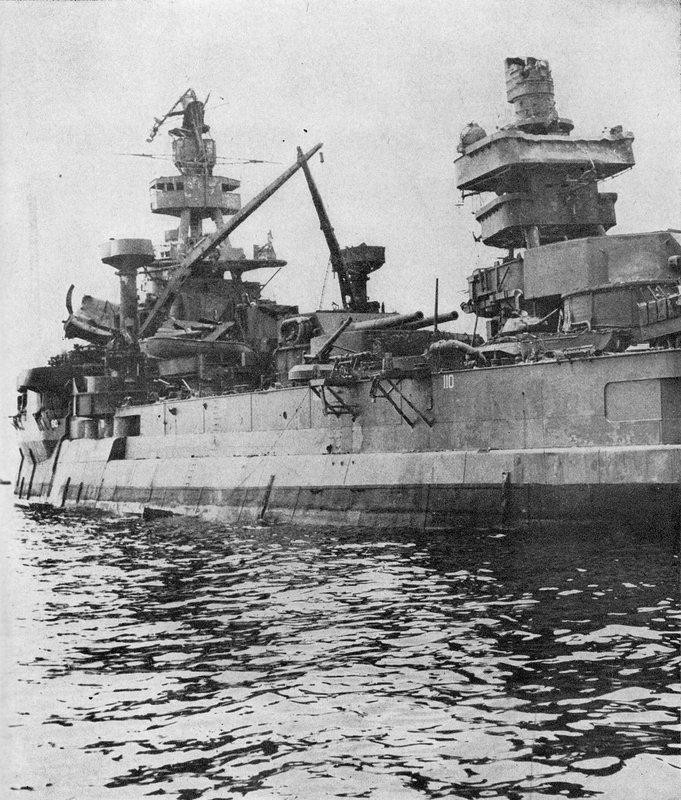 The camouflaged Oklahoma (BB-37) & Nevada (BB-36) are to the left & right. Photo i.d. courtesy of Richard M. Jensen. 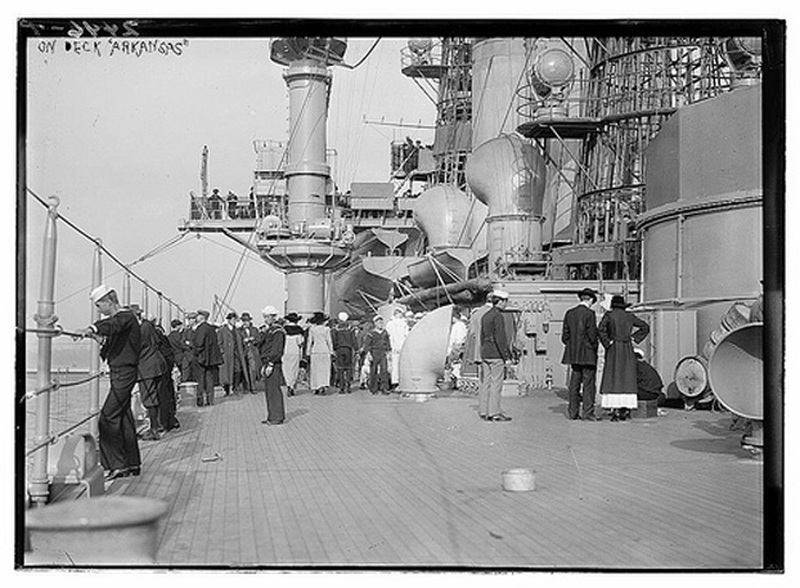 382k A Enrique Muller photo on 1 January 1918 showing among other things; sailors on the stern aboard one of the small boats of the Arkansas (BB-33), possibly readying it in preparation for a trip ashore once the ship anchors. NARA FILE #: 165-WW-334A-7. Photo # HD-SN-99-02138 courtesy of dodmedia.osd.mil, Defense Visual Information Center. Photo i.d. courtesy of Pieter Bakels. 210k Bunnell Photo Shop did some creative work showing the Arkansas (BB-33) as the center of a 1919 version of the Blue Angels. Image # LC-USZ62-19492 and text provided by Library of Congress, Washington, DC. 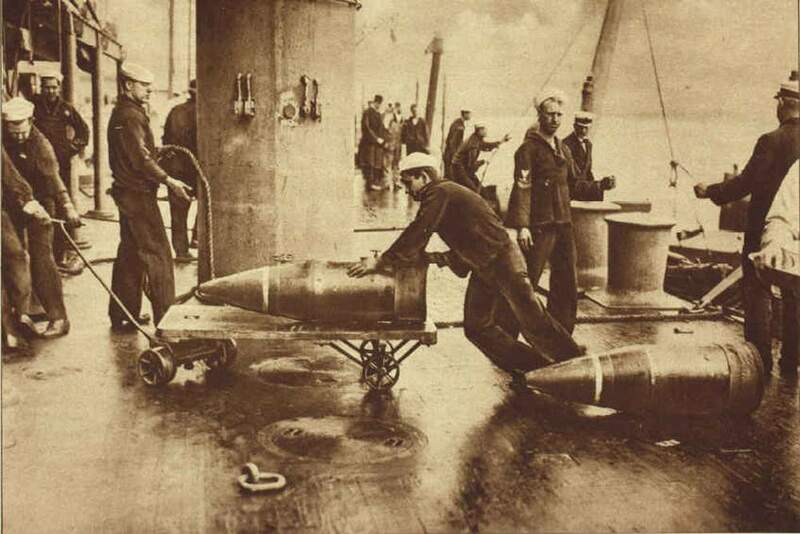 58k "Armor piercing shells weighing half a ton or more apiece being loaded on an American Dreadnought that is preparing to sail for European waters." Photo by Central News Photo Service. Text courtesy of N.Y. Times, Page 363 from The War of the Nations (New York), 31 December 1919, courtesy of memory.loc.gov. 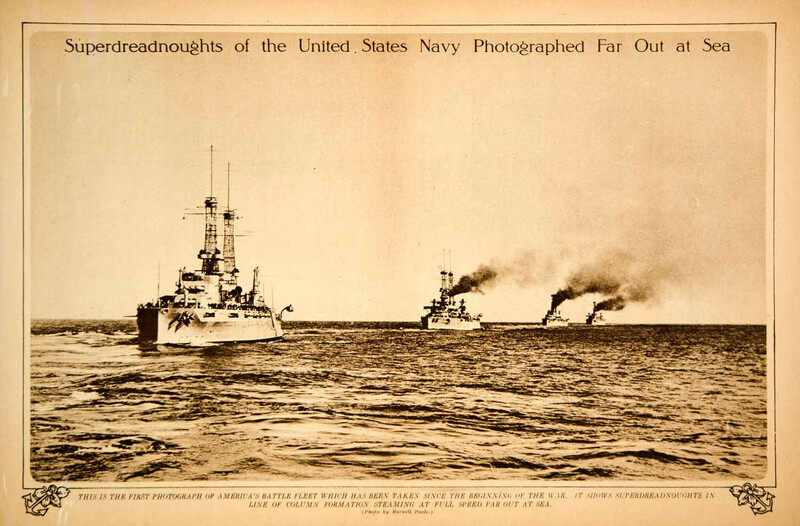 229k "Superdreadnoughts of the United States Navy"
This is an original 1917 sepia rotogravure by Bernard Poole showing America's super dreadnoughts during World War I. 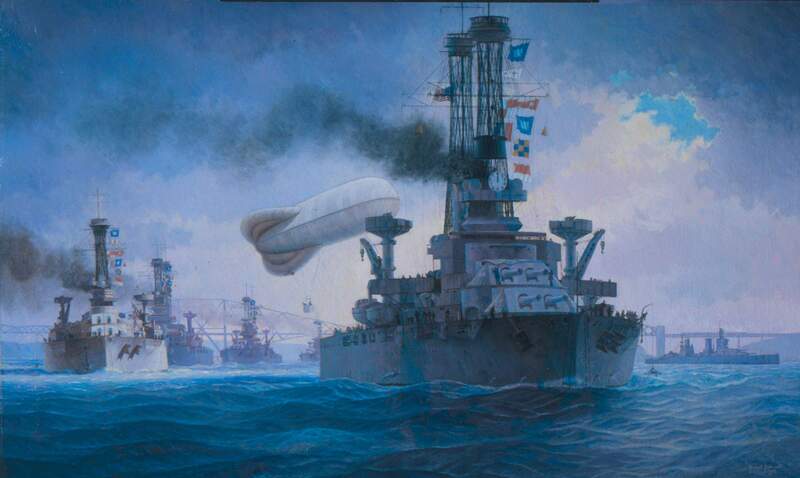 199k This rare oil painting by American artist Burnell Poole, "The 6th Battle Squadron of the Grand Fleet Leaving the Firth of Forth", is one of less than two dozen paintings owned by the Navy that depicts U.S. naval operations in World War One (WWI). After years of being considered a total loss by Navy Art Gallery curators it has been restored to near perfect condition. The entire process took several months, but the result is the total recovery of a painting that is sure to establish Burnell Poole's name among the best marine painters of the early 20th century. 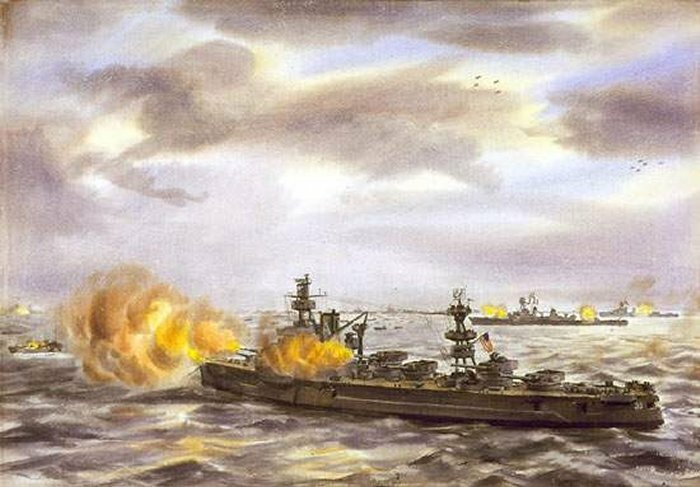 The composition of the ships of the 6th Battle Squadron during their operational history, appearing in the painting in no particular order were: Delaware (BB-28), Florida (BB-30),Wyoming (BB-32), Arkansas (BB-33), New York (BB-34), & Texas (BB-35). 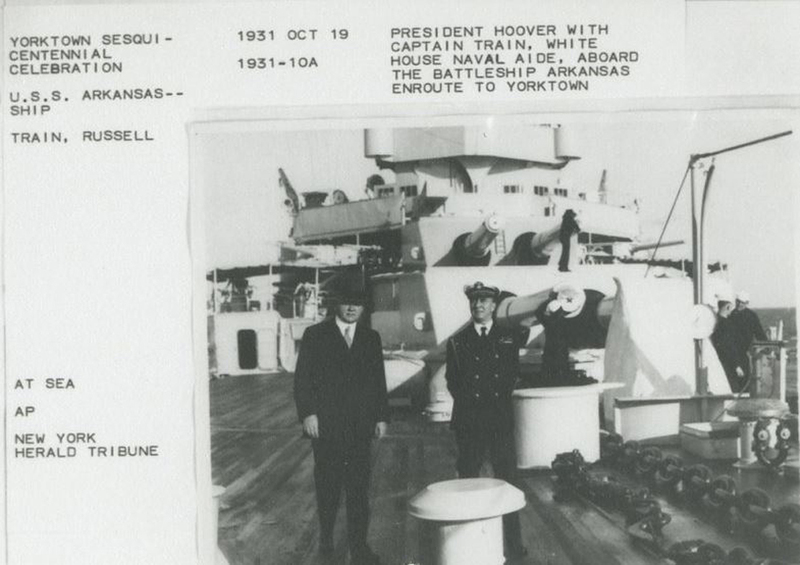 Photo and partial text courtesy of Naval Historical Center, Washington, D.C., File photo # N-0000X-001. Photo from New-York Tribune. (New York [N.Y.]) 1866-1924, 09 June 1918, Image 36, via chroniclingamerica.loc.gov. 382k 21 November 1918 - U.S. battleships witness surrender of German High Seas fleet at Rosyth, Firth of Forth, Scotland, to U.S. and British fleets. New York (BB-34), Arkansas (BB-33), Delaware (BB-28), Texas (BB-35), Florida (BB-30), and Wyoming (BB-32). Text & USN photo courtesy of Pacific Battleship Center - Battleship USS Iowa via Ron Reeves (of blessed memory). Photo i.d. courtesy of Andy McIntosh. 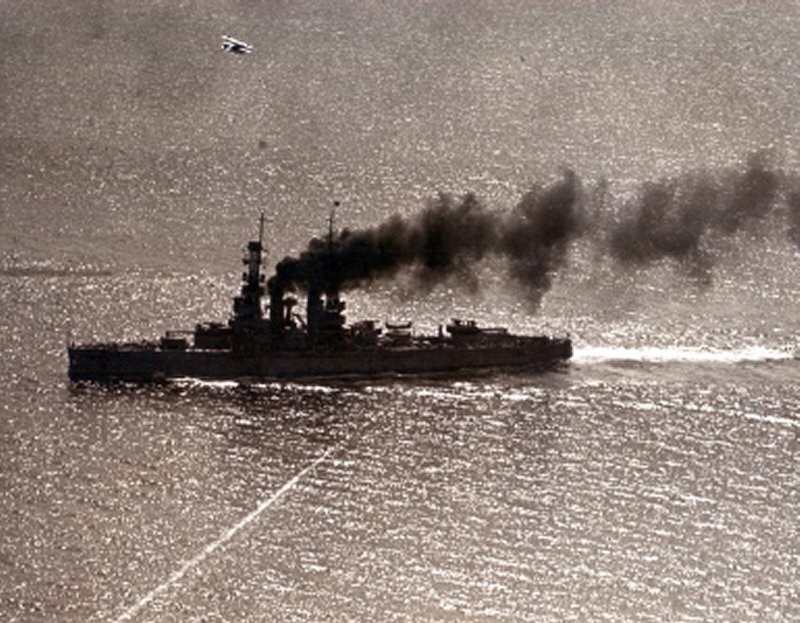 817k Original Caption: "Smoke Screen" makes battleship indistinguishable. 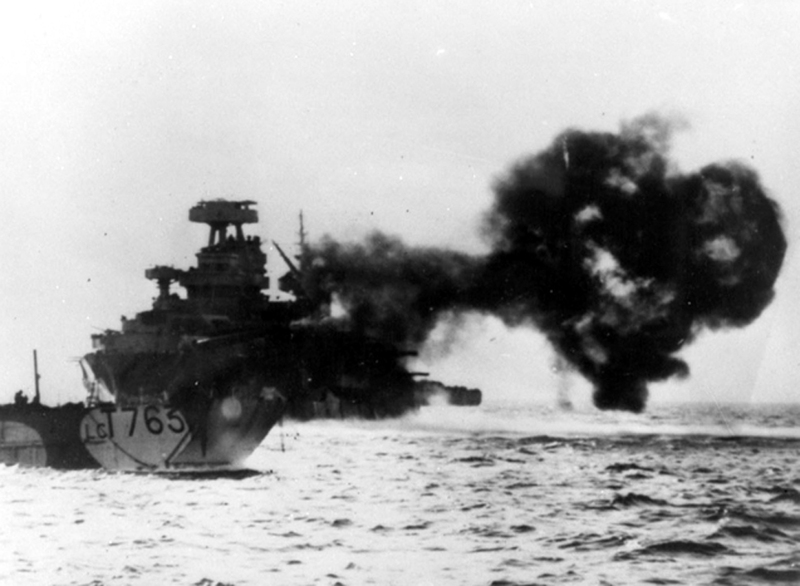 "Smoke Screen" developed by the Arkansas (BB-33), that entirely envelops the ship in a few minutes, making it indistinguishable to the enemy. Men can be seen at muster in the foreground. Photographer: Photo by N.H. Moser - Underwood & Underwood. 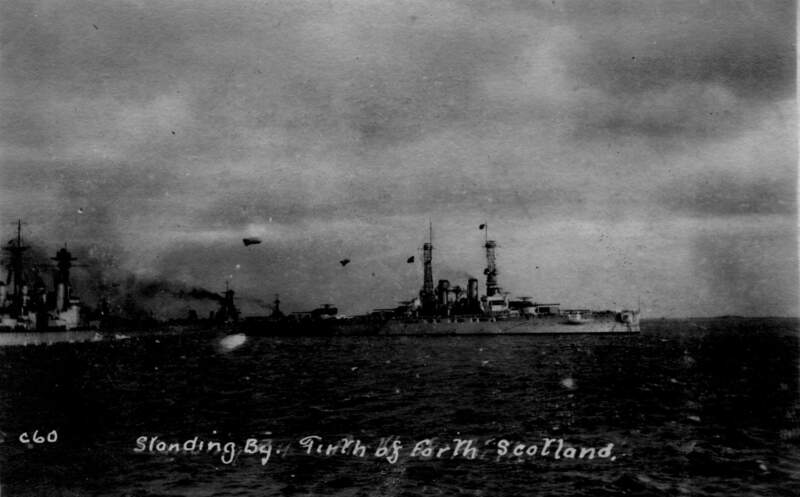 163k A British, German & American battleship, the Wyoming (BB-32) or Arkansas (BB-33), as seen from the Florida (BB-30) the day the German High Seas Fleet surrendered in the Firth of Forth, 21 November 1918. Courtesy of Larry Yungk. 200k Arkansas (BB-33), standing by with the rest of the U.S. Navy's Battleship Division Nine & as seen from the rear deck of the Florida (BB-30) at the Firth of Forth, Scotland, 1917-19. Note the blimps flying overhead. Courtesy of Larry Yungk. 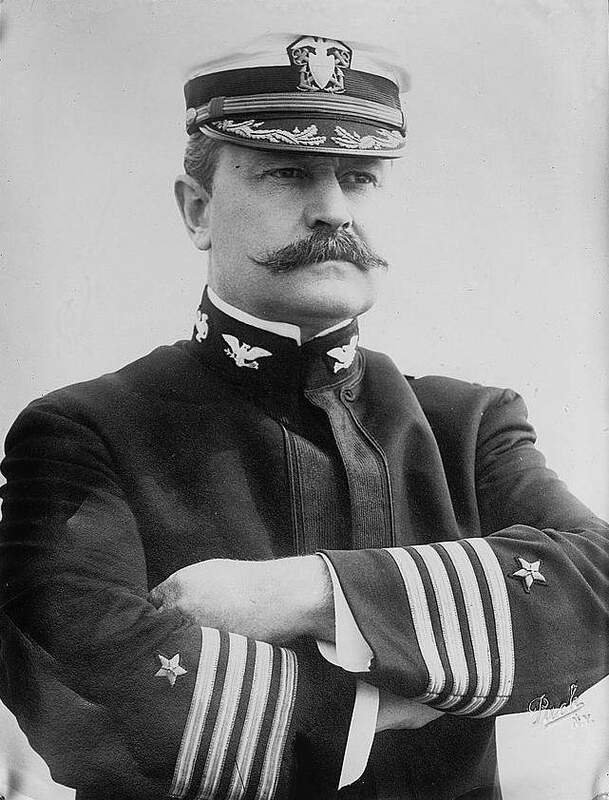 298k Prior to World War I Admiral Louis Rodolph de Steiguer commanded the battleship Kearsarge (BB-5) in 1916. 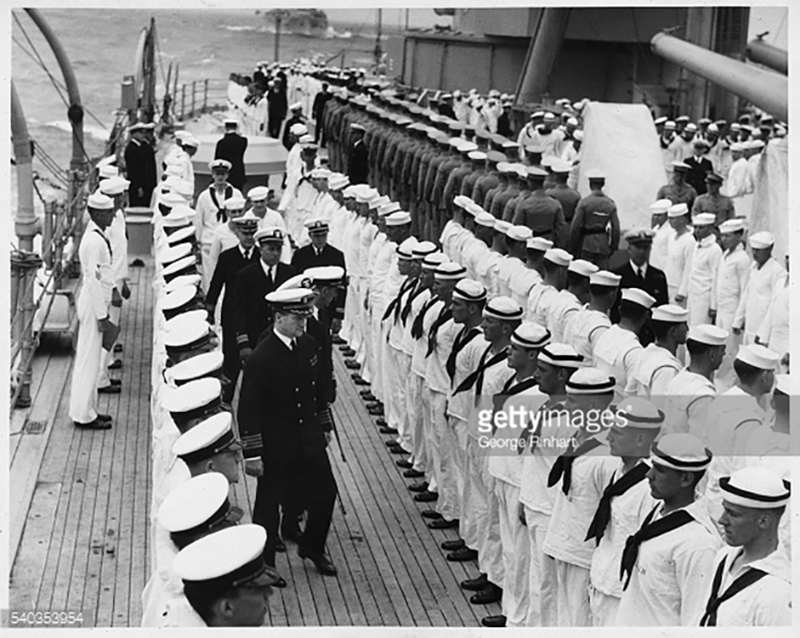 During World War I he served as chief of staff of the Third Naval District before reporting as captain of the battleship Arkansas (BB-33), which was stationed with the American dreadnought squadron operating with the British Grand Fleet. 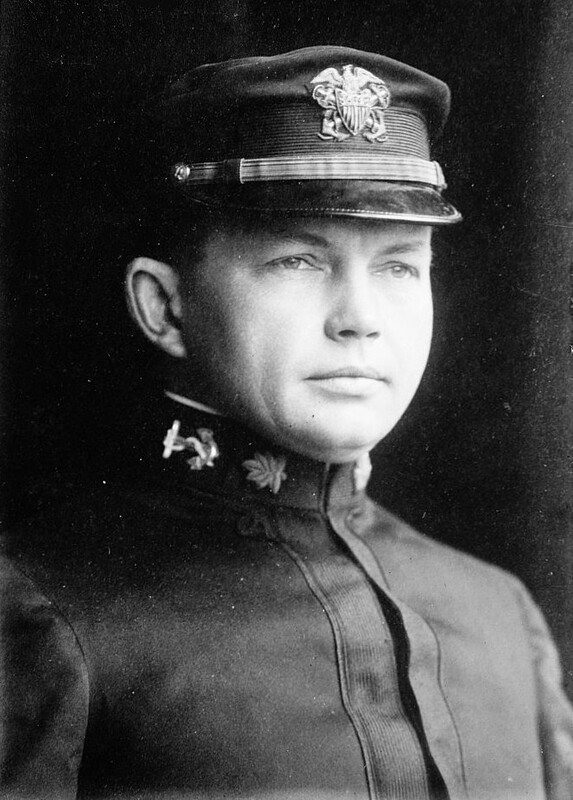 After the war, de Steiguer was Hydrographer of the Navy from July 1921 to December 1921. Promoted to rear admiral, he was commander of the First Naval District, including the Portsmouth Navy Yard, from June 1923 to 1925. 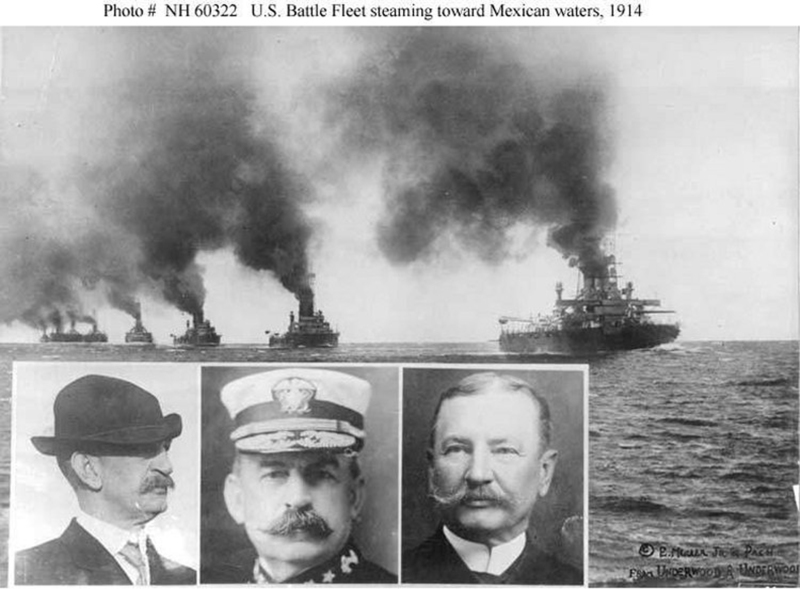 ADM Louis R. de Steiguer, Commander in Chief, Battle Fleet (far left); William Wallace Campbell, President, U.C. 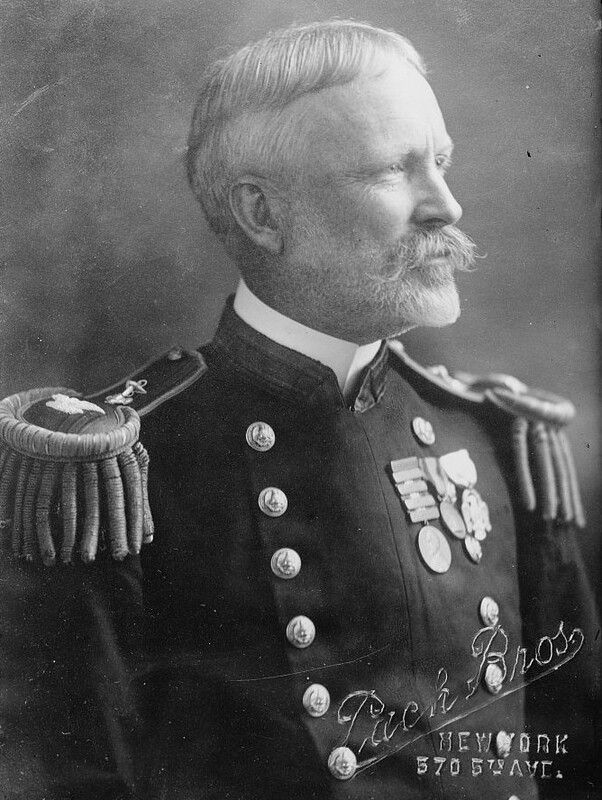 Berkeley; RADM Harris Laning, Chief of Staff, Battle Fleet; COL R.O. Van Horn, Army ROTC Unit; CAPT William D. Puleston, Asst Chief of Staff, Battle Fleet; CAPT Chester Nimitz, Naval ROTC Unit captured here during an Inspection visit to Naval ROTC Unit at U.C. Berkeley (1927). Official USN photo from Naval Historical Collection via Bill Gonyo. & at one time or another. There are only three of the battleships present in this photo at Brest, France, on 13 December 1918. George Washington (ID-3018), which had just carried President Woodrow Wilson from the United States to France, is in the right background. Photographed by Zimmer USNHC # NH 63454. 133k Capt. Louis Rodolph de Steiguer was the commanding officer of the battleship Arkansas (BB-33) in 1919. Official USN photo from Naval Historical Collection (Cropped) via Bill Gonyo. THE NEW YORK (BB-34), REAR ADMIRAL HUGH RODMAN'S FLAGSHIP of the Overseas Fleet,...on Entering New York Harbor, Firing a Salute in Honor of the Secretary of War. Text & photo courtesy of Times Photo Service, N.Y. Times, 5 January 1919, Page 6, courtesy of memory.loc.gov. 74k Underway, 1919. Photo i.d. courtesy of Ron Balko. USN photo courtesy of Larry Bonn. The platforms were a British concept designed to provide the fleet with an aircraft capable of reaching the high flying Zeppelins which the German Navy occasionally used as scouts. 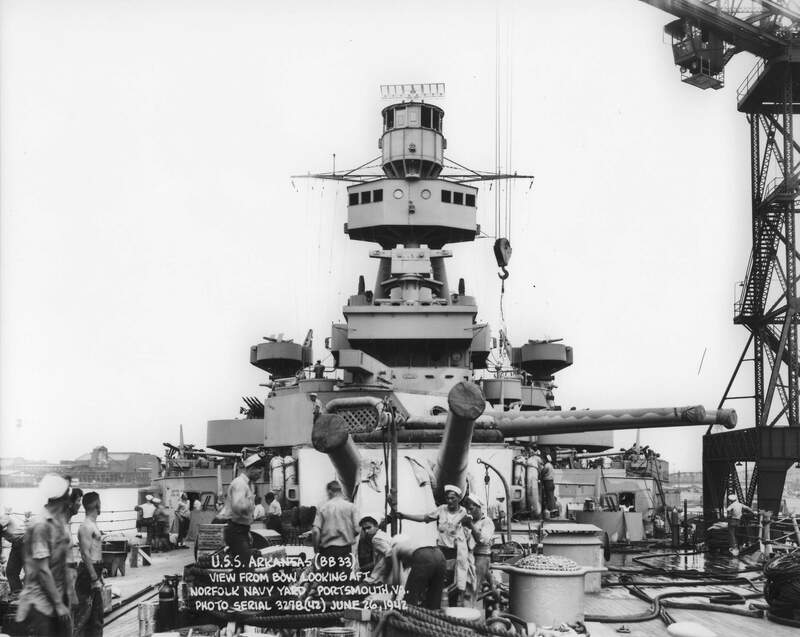 The Texas was the only US Battleship to be fitted with turret fly-off platforms while in Europe and was the test bed for this program in the US Navy. 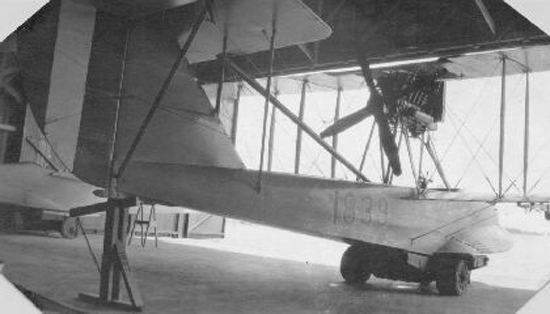 Not visible in this view is a stripped down (No fabric and no wings) Sopwith 1-1/2 Strutter lashed atop the No. 3 Turret. The platforms were eventually mounted on all 14" gun BB's through the New Mexico (BB-40 / 42) class (with mixed reviews from their commanders) and carried either a Hanriot HD-1 or a Nieuport' 28. Though equipped inflatable floats for water landings, this tended to do a lot of damage not the least of which was dowsing a hot engine in cold salt water. 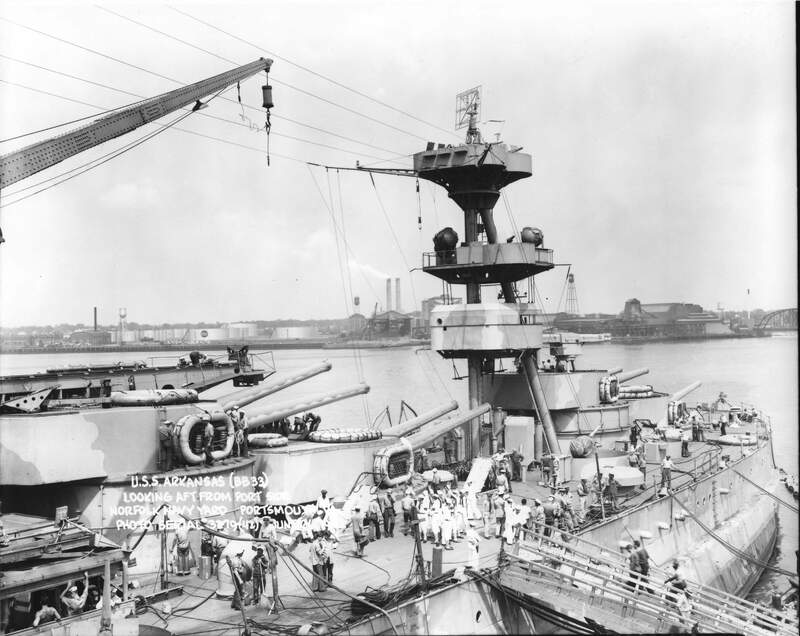 By 1920 a successful compressed air catapult was developed and were being mounted on the aft deck of all 4 turreted battleships and fly-off platforms were removed. 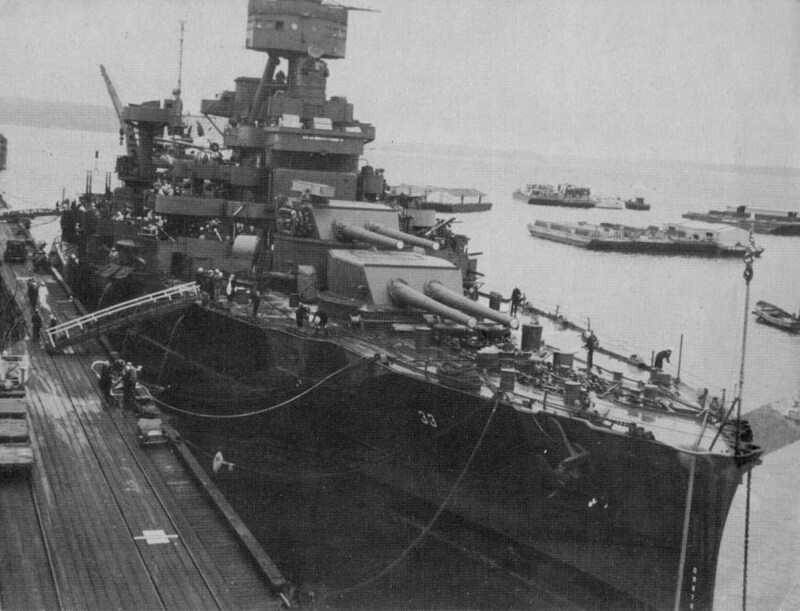 The Texas and New York (BB-34), because of their 5 Turrets, lacked the deck space for the catapult and had to make do with a float plane (Vought VE-7) sitting on the aft deck which would be launched by lowering it over the side for a surface take-off. If you look carefully at the photo you see the VE-7 on the deck and the A-frame hoist used for handling it. Photo by Paul Thompson. Text courtesy of N.Y. Times, page 481, from The War of the Nations (New York), 31 December 1919, courtesy of memory.loc.gov. The Atlantic battleship fleet is home again. Here are the twelve great first line fighting ships that are paying Father Knickerbocker a two weeks' visit. Over a hundred of Uncle Sam's grim sea warriors gray the North River, while their 30,000 sailor-men are given the freedom of the city in a royal welcome home. 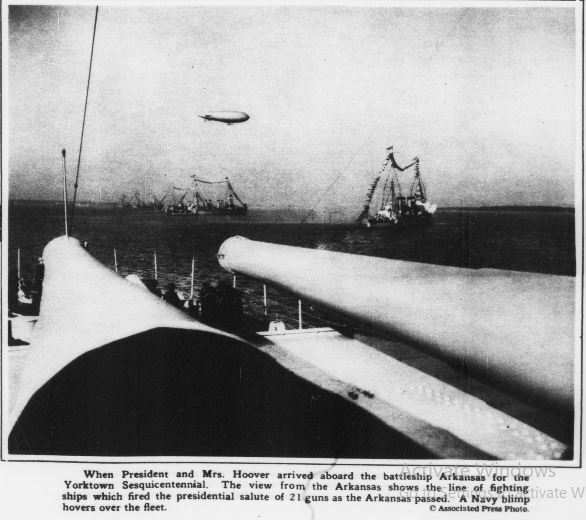 Above is a general view of the deck of the battleship Arkansas (BB-33) during the presentation of a silver service, a gift of the people of Arkansas to the State's namesake. Image and text provided by Louisiana State University; Baton Rouge, LA. Photo & text by The Patriot. (Glenmora, La.) 1918-1955, 02 May 1919, Morning, Image 4, courtesy of chroniclingamerica.loc.gov. 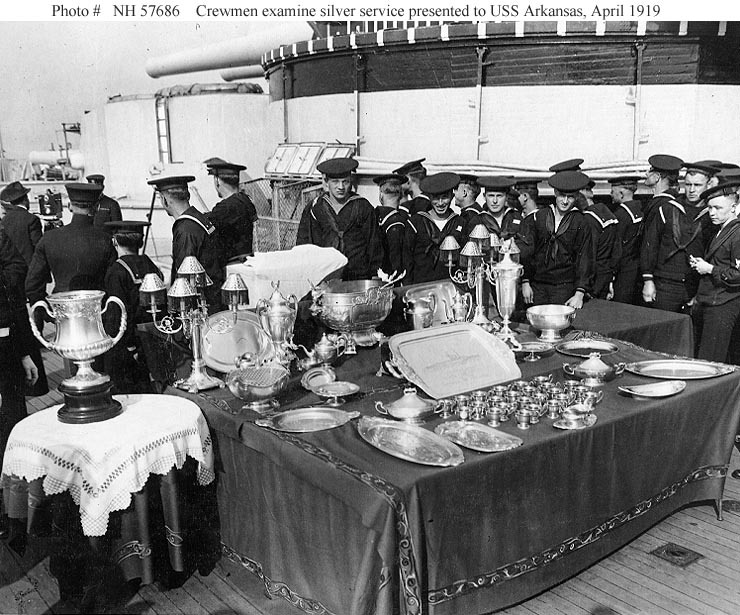 513k Crewmen examining the silver service valued at $10,000 presented to the battleship by the State of Arkansas. Miss Daisy Dalony made the presentation on behalf of Arkansas Governor Brough, 23 April 1919. This photograph shows, left to right, Neeley Burn and Eula Spivey with the D. A. R. and the Arkansas Traveler's trophy cups. USNHC photo # NH 57686. Photo & text by The North Platte semi-weekly Tribune. (North Platte, Neb.) 1895-1922, 09 May 1919, Image 6, courtesy of chroniclingamerica.loc.gov. 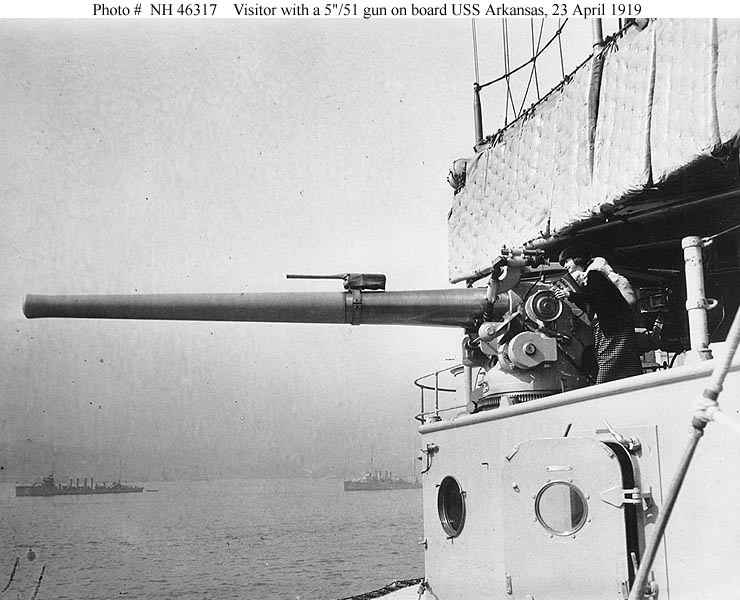 87k A young woman visitor sighting one of the Arkansas's (BB-33) 5"/51 guns, in New York Harbor, 23 April 1919. 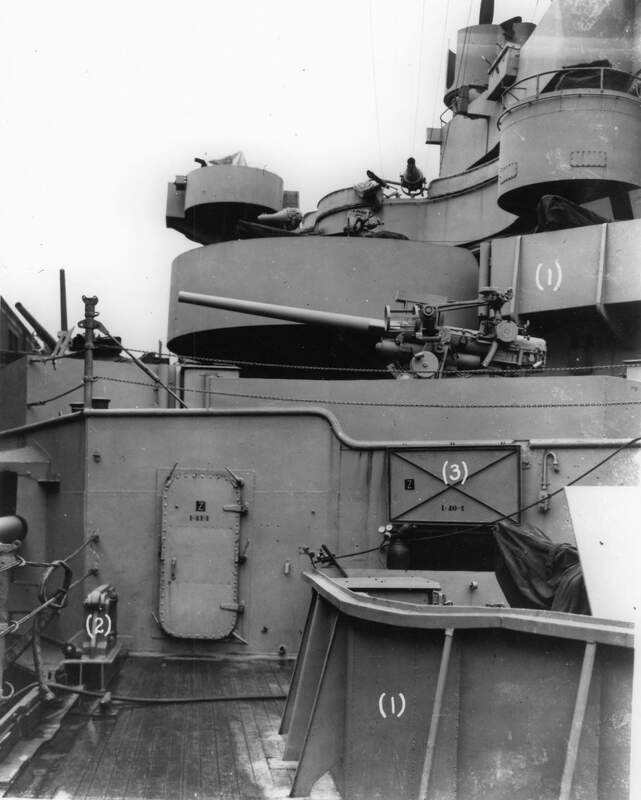 Note the small sub-caliber spotting rifle atop the gun barrel; splinter mattresses hung over the gun; and door with porthole in the lower right. In the background are Jouett (DD-41), at left, and Meredith (DD-165). USNHC photo # NH 46317. 146k Mascots of the Arkansas (BB-33) now at anchor in the Hudson River. A tame monkey, parrot & goat, pets of the great ship's crew. Photo by Underwood & Underwood. Photo from Evening Public Ledger. (Philadelphia [Pa.]) 1914-1942, 28 June 1919, via chroniclingamerica.loc.gov. Mascot PDF Image and text provided by Oklahoma Historical Society. Photo from The Beaver Herald. (Beaver, O.T. [Okla.]) 1895-1923, 25 May 1911, Image 6. Mrs. Benson First Woman to Make Transatlantic Trip on U. S. Warship. Image and text provided by The New York Public Library, Astor, Lenox and Tilden Foundation. Photo from The Evening World. (New York, N.Y.) 1887-1931, 20 June 1919, Final Edition, Image 12, via chroniclingamerica.loc.gov. 900k In the middle chambers of the Gatun Locks, Panama Canal, on 25 July 1919 while en route to the Pacific. 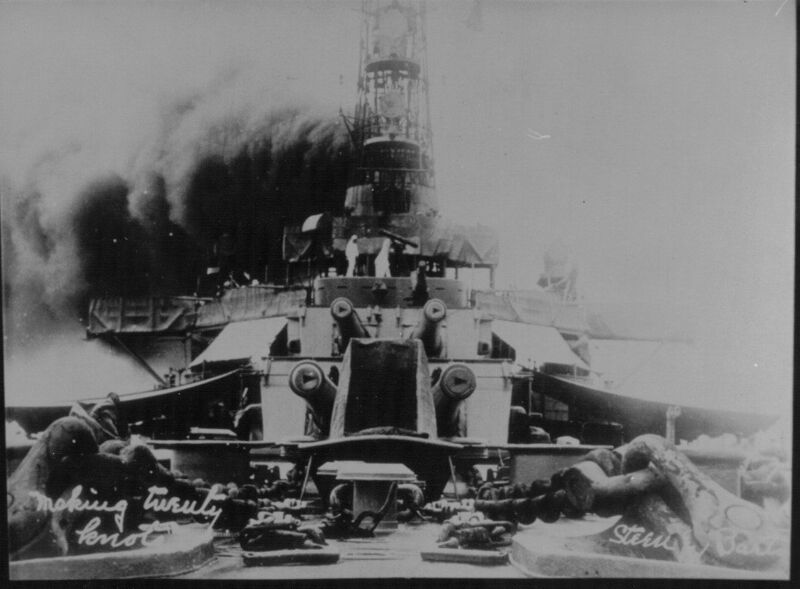 Texas (BB-35) is at right. USNHC photo # 19-NH 57682, via Robert Hurst & Scanned from Conway's Battleships. Revised and expanded edition. 53k "The Arkansas (BB-33) being raised in the Upper West chamber of the Gatun Locks to the level of the Canal water beyond." Times World Wide Photo, text courtesy of N.Y. Times 17 August 1919, Page 2, courtesy of memory.loc.gov. 105k "The U.S. Dreadnought Arkansas (BB-33) of Admiral Rodman's newly formed Pacific Fleet, welcomed by a Curtiss HS-2 seaplane, Bureau Number -- 1839 at Colon, Atlantic entrance to the Panama Canal." U.S. Naval Air Service Photo, text courtesy of N.Y. Times 10 August 1919, Page 1, courtesy of memory.loc.gov. & roynagl. Photo i.d. courtesy of Chris Hoehn & Alan Sherman. 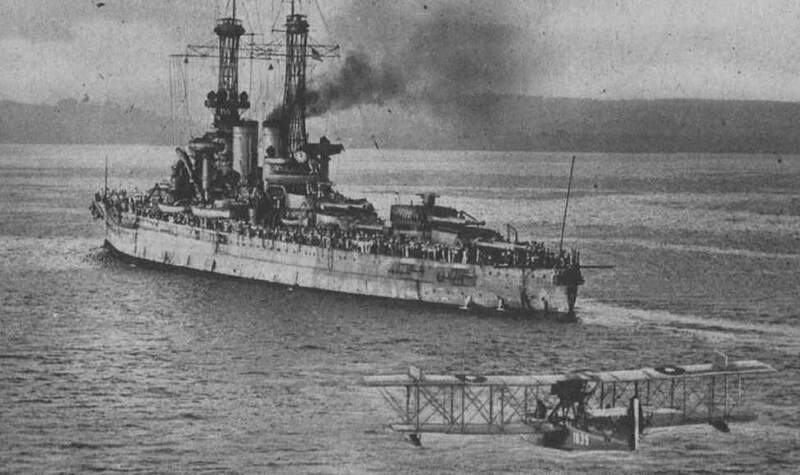 310k Arkansas (BB-33) underway in 1920. Digital ID: # cph 3b38472. LC-USZ62-92151. Source: Library of Congress Prints and Photographs Division, from the George Grantham Bain Collection. 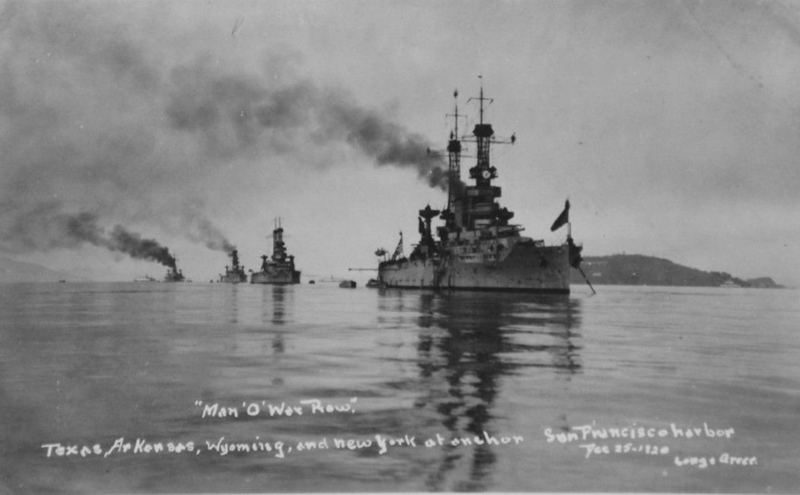 578k Man O War Row, Texas (BB-35), Arkansas (BB-33), Wyoming (BB-32) & New York (BB-34) at anchor, San Francisco harbor, Xmas 1920. USN photo courtesy of Pieter Bakels. If battleships are scrapped under the Hughes proposal, this is how it will be done. 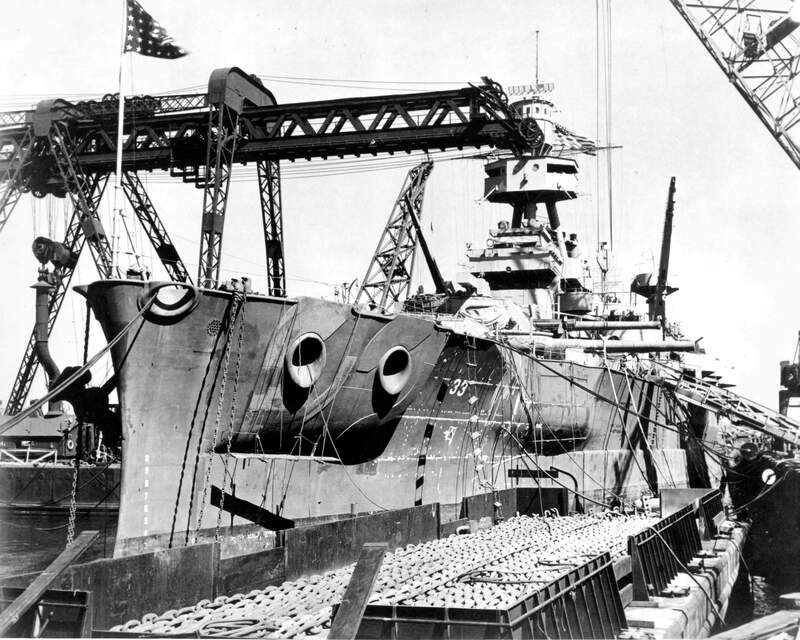 The Arkansas (BB-33) is partially dismantled while being overhauled at Philadelphia. To scrap the ship the dismantling process would be continued. (Note the photo is upside down!) Image and text provided by Arizona State Library, Archives and Public Records; Phoenix, AZ. Photo from Arizona Republican. (Phoenix, Ariz.) 1890-1930, 16 December 1921, Image 2, courtesy of chroniclingamerica.loc.gov. 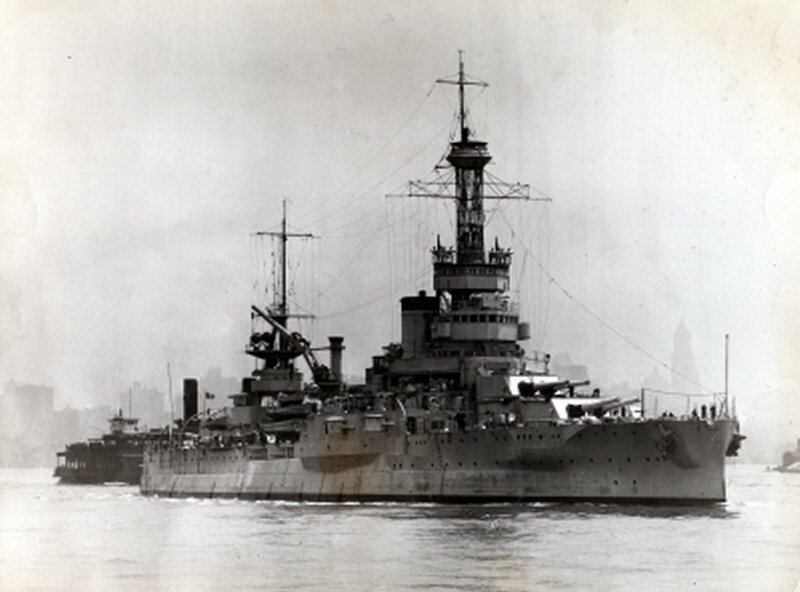 Two battleships of the North Atlantic Fleet are at anchor off 96th Street in the Hudson River. 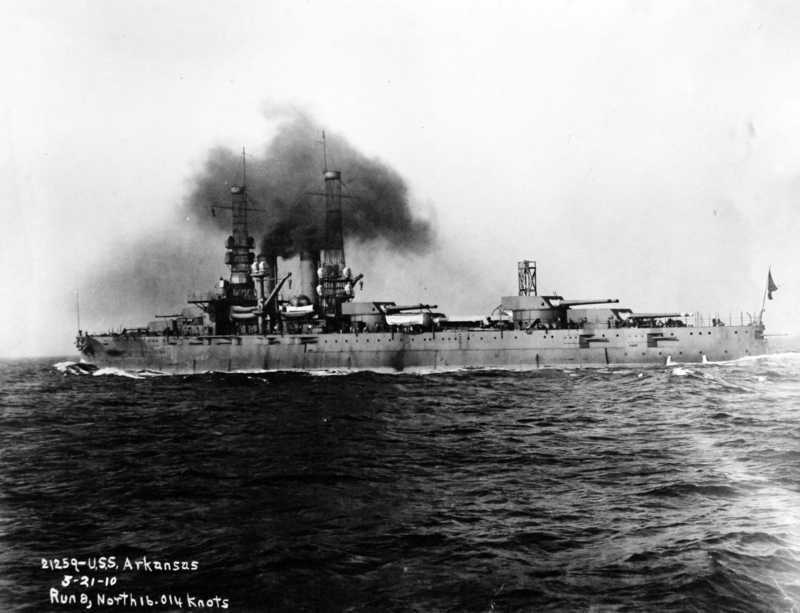 They are the Arkansas (BB-33) and Wyoming (BB-32). Image and text provided by The New York Public Library, Astor, Lenox and Tilden Foundation. Photo from The Evening World. (New York, N.Y.) 1887-1931, 01 August 1922, Wall Street Final Edition, Image 18, courtesy of chroniclingamerica.loc.gov. 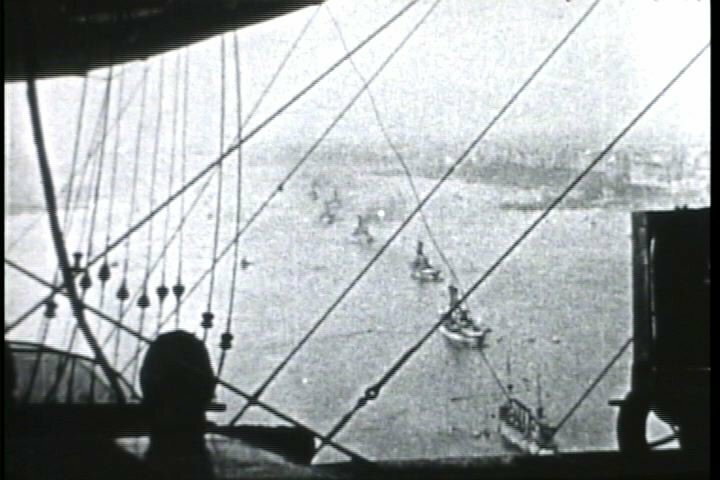 91k Fifty miles east of Cape Henry off the Virginia coast, an aerial armada of twenty planes in all released torpedoes (minus the warhead) at part of the Atlantic Fleet on October 1922. Many hits scored! The wake can be seen leading to the port side as aircraft flies overhead. The aircraft appearing above the Arkansas might be a PN-9. 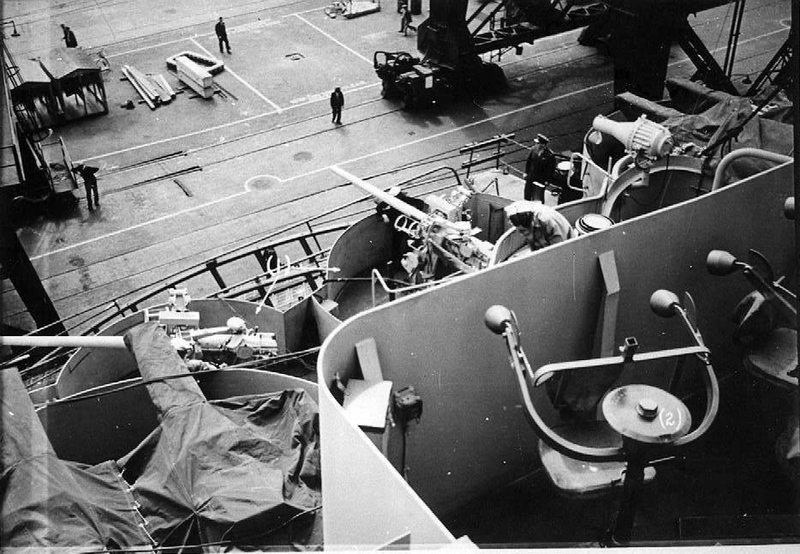 An air operated catapult can be seen on the fantail. USNI / USN photo. Photo i.d. & text courtesy of Evening Public Ledger of Philadelphia Pa. 2 October 1922. 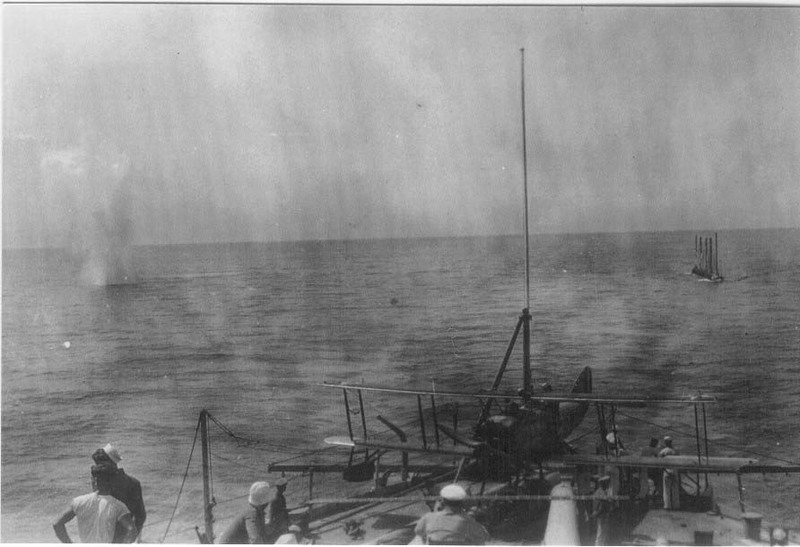 121k Early 1920's photo of the Arkansas (BB-33) conducting torpedo practice. Inscription on back of photo, "A hit by Lieut. Gray, first torpedo dropped in attack." It is possible that the aircraft is a Douglas DT bomber. USNI / USN photo. 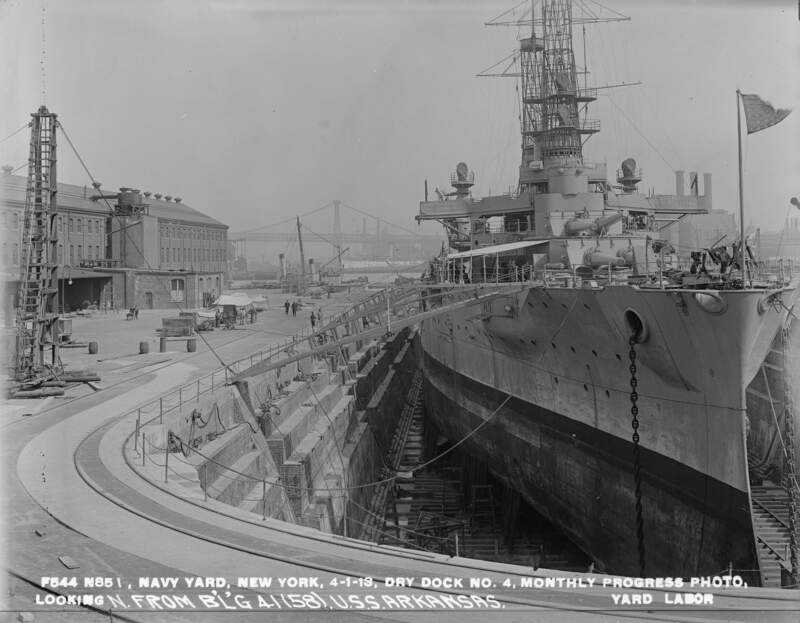 430k Arkansas (BB-33) in dry dock # 4 New York Navy Yard, portside view looking aft 6 May 1923. Photo No. f1050c7, New York Navy Yard Archive - courtesy National Archive and Records Administration, Northeast Region - NYC, Record Group 181 via flickr.com. 1.47k ROYAL PARTY ON U.S. BATTLESHIP. King Christian of Denmark aboard the Arkansas (BB-33). 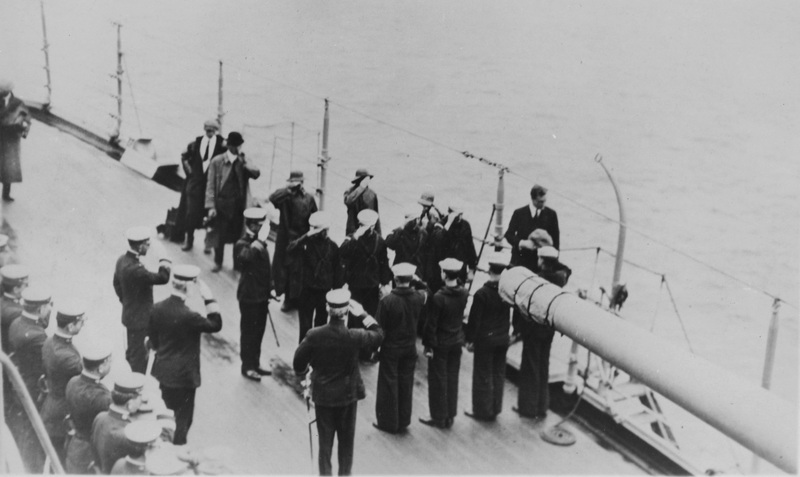 The photo shows him passing the front while a guest of the ship's officers. The visit aboard ship was strictly official. Image and text provided by Library of Congress, Washington, DC. Photo from Evening Star. (Washington, D.C.) 1854-1972, 18 July 1923, Image 17, courtesy of chroniclingamerica.loc.gov. 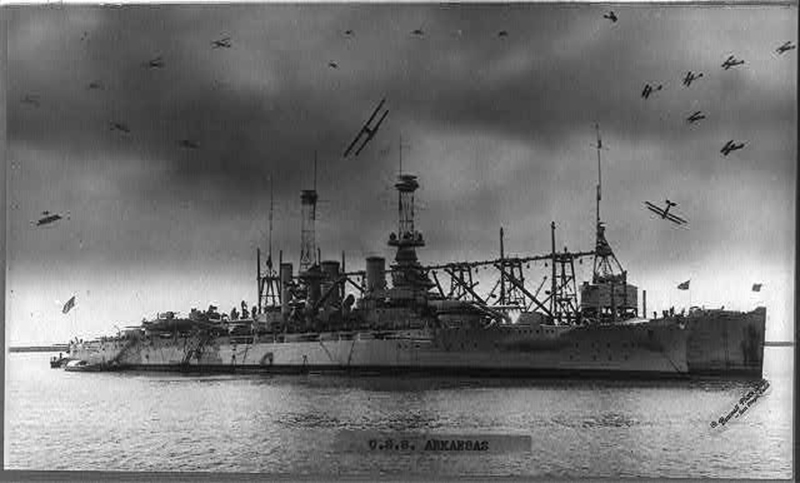 401k The Arkansas (BB-33) at anchor circa early 1920's. 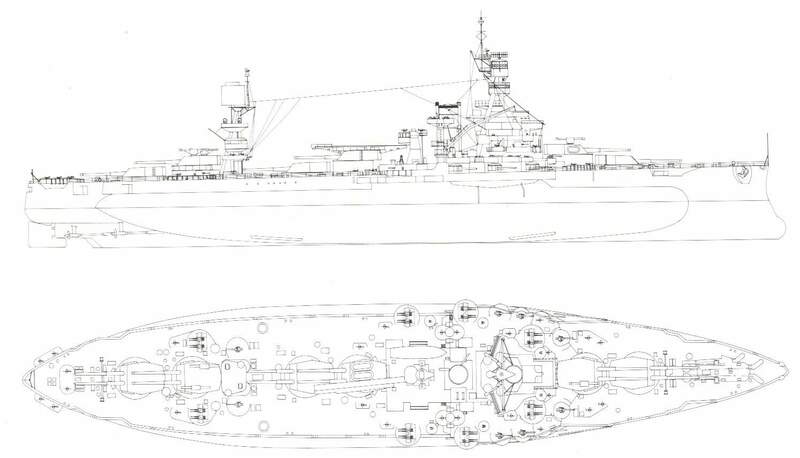 The difference between the Wyoming (BB-32) & Arkansas is shown by the hull area around the anchors. This difference distinguished the two for their entire careers. USN photo courtesy of Jim Millholland via Alan Cole. Photo i.d. & text courtesy of Richard Jensen. 352k Arkansas (BB-33) underway, port side view. Before modernization. USN photo courtesy of David Buell. 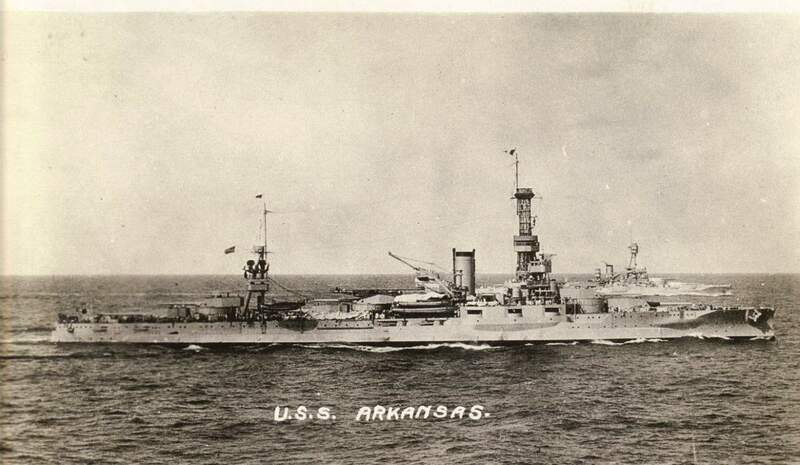 97k Arkansas (BB-33) after WWI modifications, early 1920's. 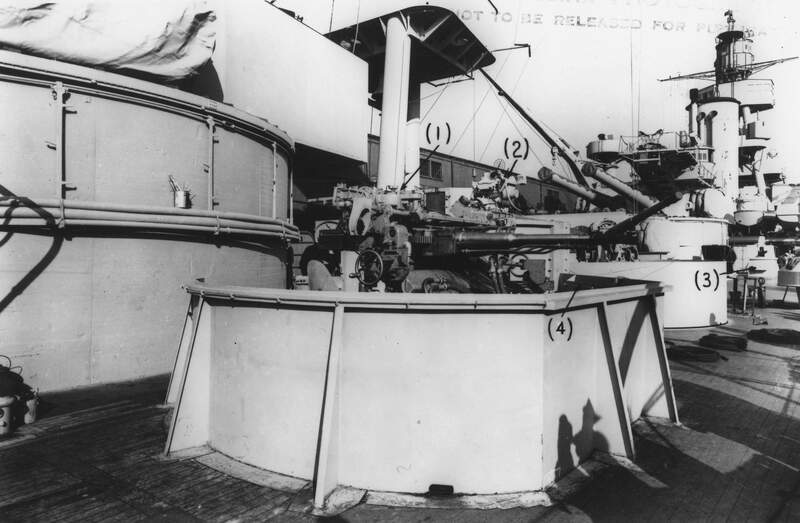 Forward casemates are plated over and mast tops were modified to the standard octagonal form. They controlled the searchlights and were for torpedo defense (spotting). The main mast top is a bit lower than the foremast to help keep it out of funnel smoke at battle speeds. USNHC photo # NH 64508. 140k Stern view taken at the same time as #6 photo. 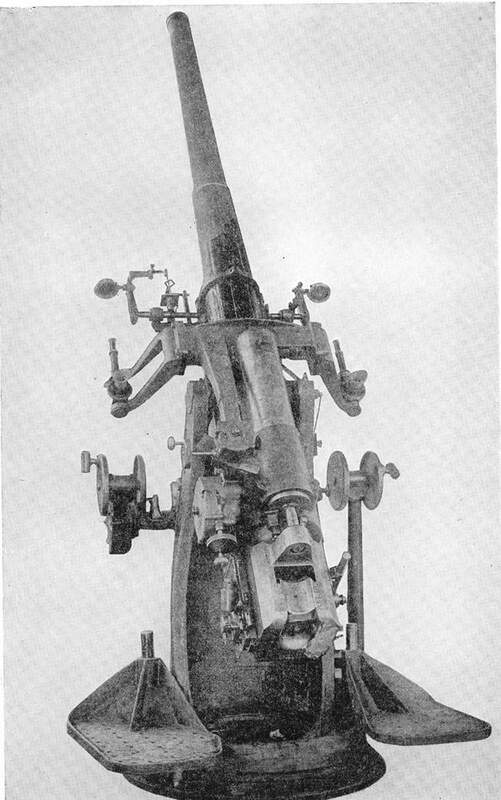 Shows plated over 5" gun position at the sterns end. 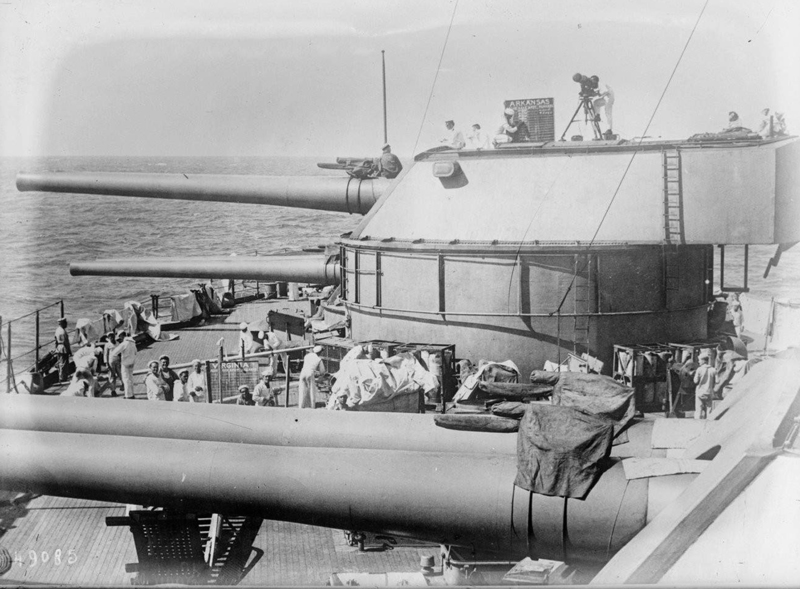 Turrets #3 and #5 have a pair of 3" A.A. guns mounted on their tops as well as range finders, giving a cluttered appearance. 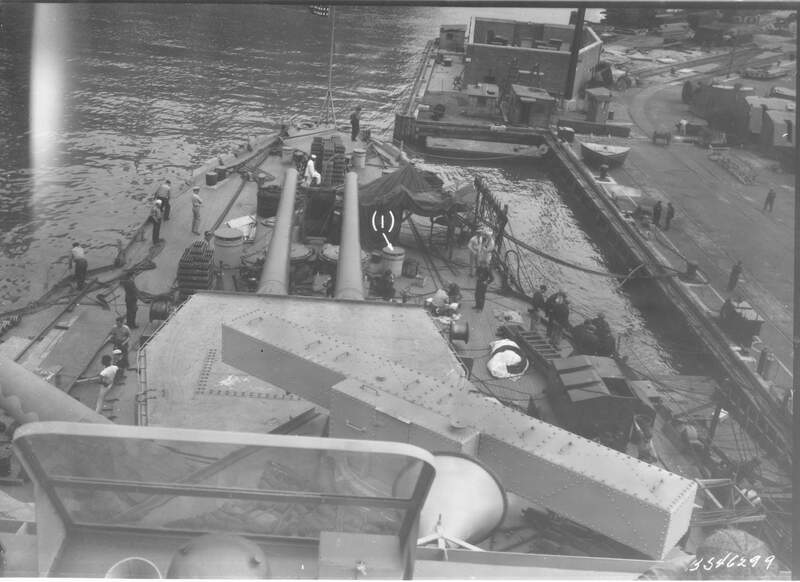 Two more pairs of 3"ers are mounted on her crane derrick tops and a fourth (not easily seen here) is located abreast #5 turret barbette. USN photo. 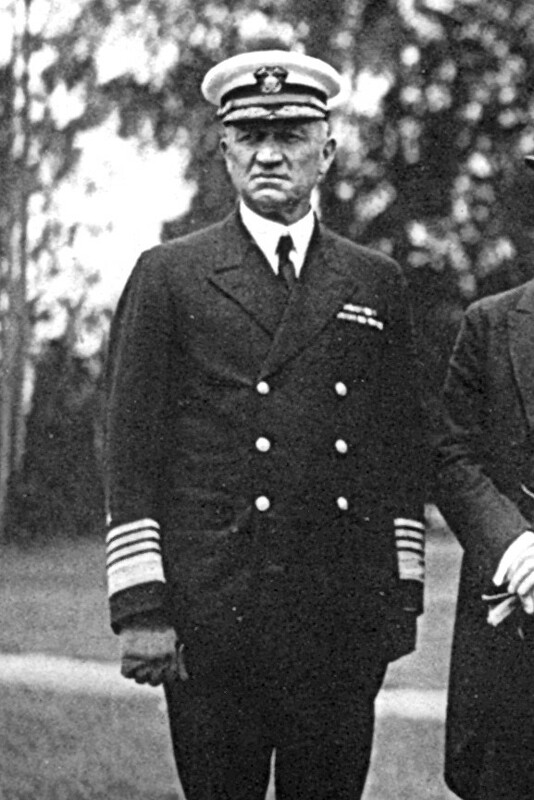 169k Captain Ridley McLean was the Commanding Officer of the battleship Arkansas (BB-33) from June 1922 to April 1924. Photo from the Library of Congress via Bill Gonyo. 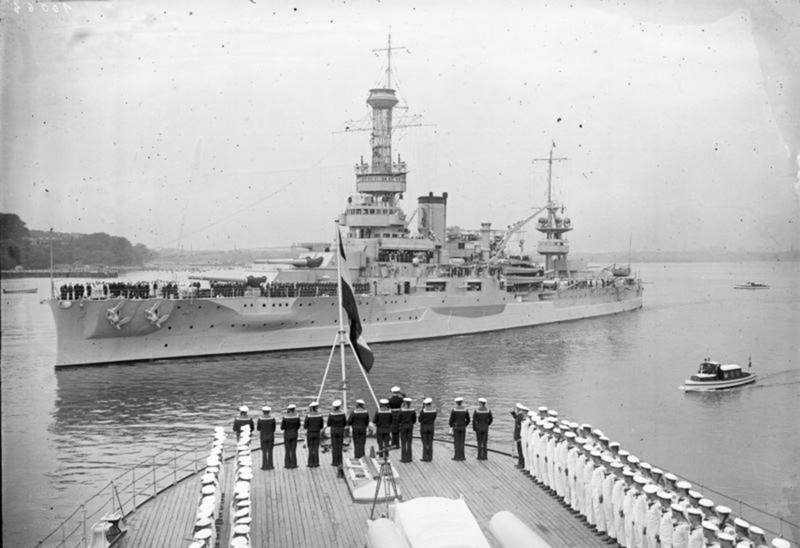 110k Upon completion of the 1925 midshipman cruise, Arkansas (BB-33) entered the Philadelphia Navy Yard for modernization. She is shown here with all her guns trained to starboard, taken in February 1926, before any modification had taken place. USN photo. 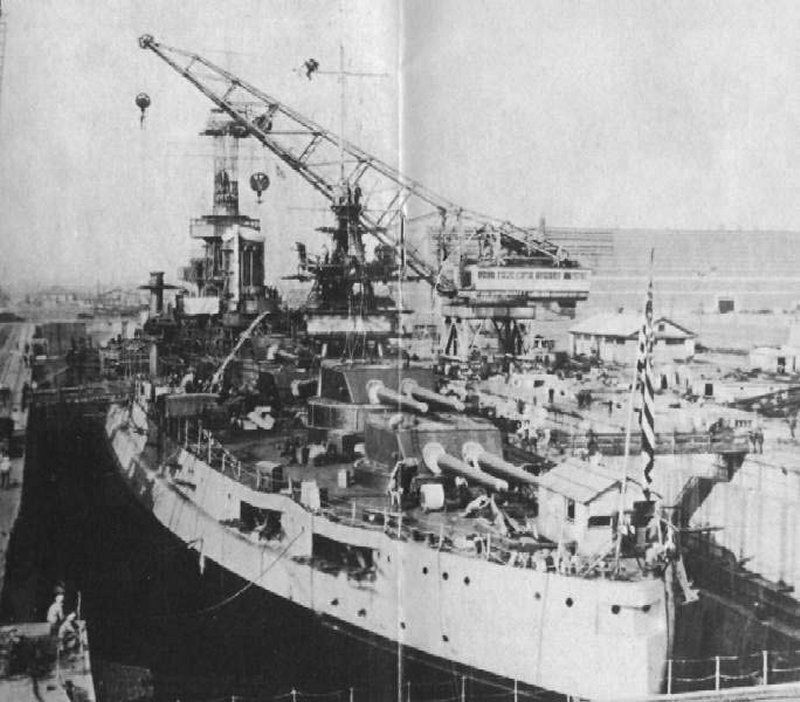 102k The Arkansas (BB-33) in the Philadelphia Navy Yard for modernization, still largely unaltered except for the after mast, in dry dock in October 1926. USN photo courtesy of Robert Hurst. 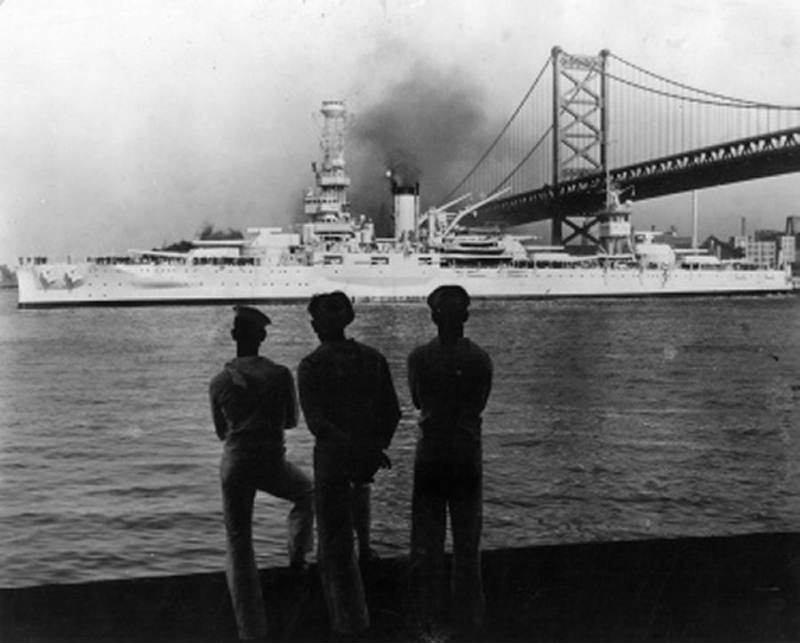 82k Arkansas (BB-33) passing under the Benjamin Franklin Bridge in Philadelphia, Pa. Arkansas left the Philadelphia Navy Yard in November 1926 and, after a shake-down cruise along the eastern seaboard and to Cuban waters, returned to Philadelphia to run acceptance trials. She had entered the Philadelphia Navy Yard for modernization. Her coal-burning boilers were replaced with oil-fired ones. 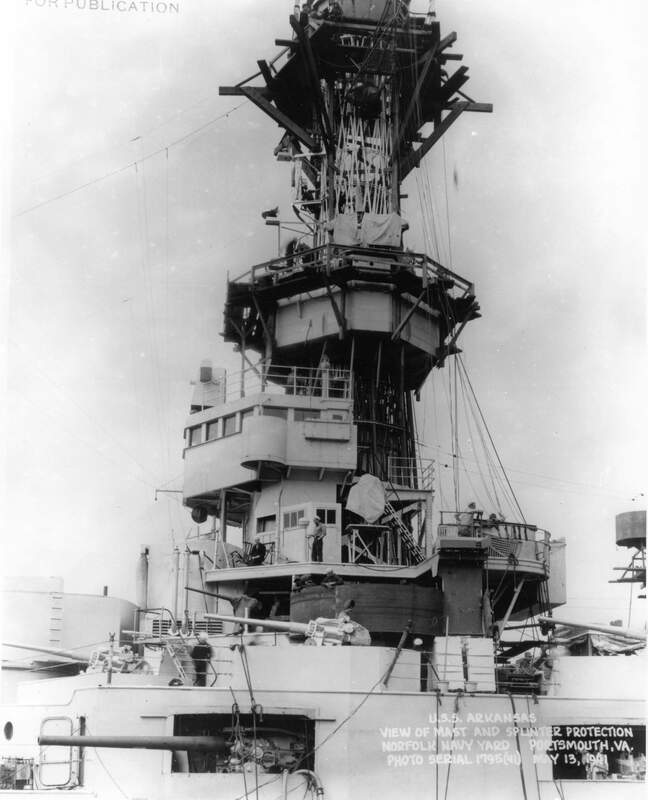 Additional deck armor was installed, a single stack was substituted for the original pair, and the after cage mast was replaced by a low tripod. USNI / USN photo. Photo i.d. courtesy of Charlie Gonce. 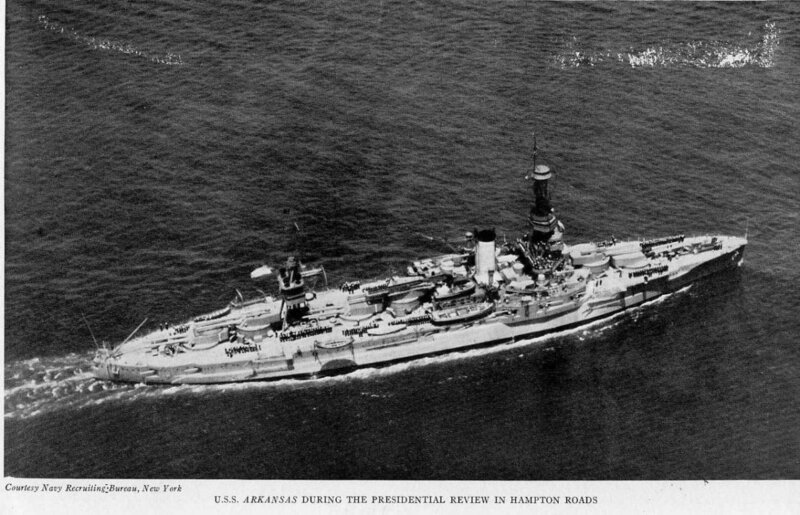 246k Arkansas (BB-33) during the Presidential review in Hamption Roads. The Presidential review was on 4 June 1927. Courtesy Navy Recruiting Bureau, New York. Submitted by Darryl L. Baker. 52k In May 1928, Arkansas (BB-33) again embarked midshipmen for their practice cruise along the eastern seaboard and down into Cuban waters. USN photo courtesy of Joseph Sandling via Fred Willshaw. 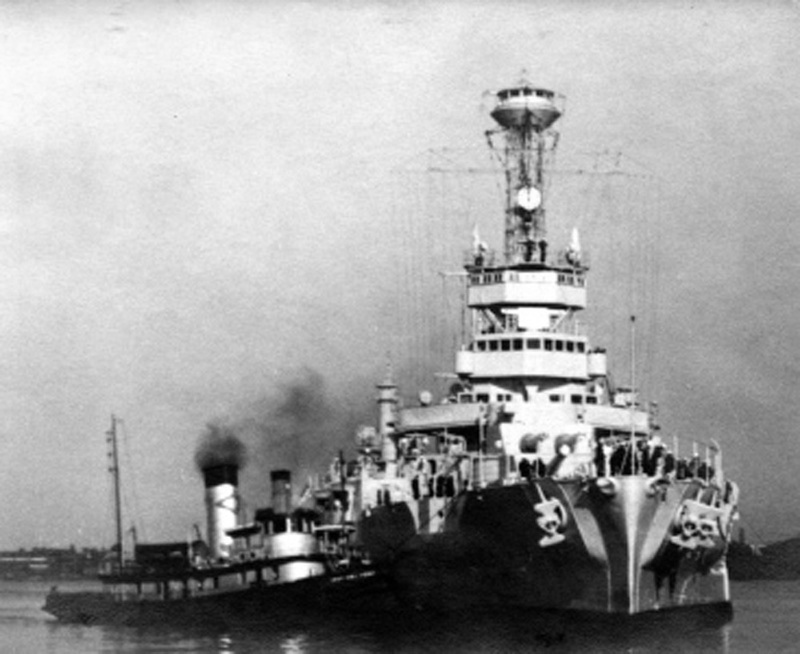 59k Arkansas (BB-33) during the mid - late 1920s or early 1930s, following modernization. USNI photo. 48k Photographed during the late 1920s or early 1930s, following modernization. USNHC photo # NH 61322. 69k Arkansas (BB-33) towing battle raft during target practice circa 1928-29. 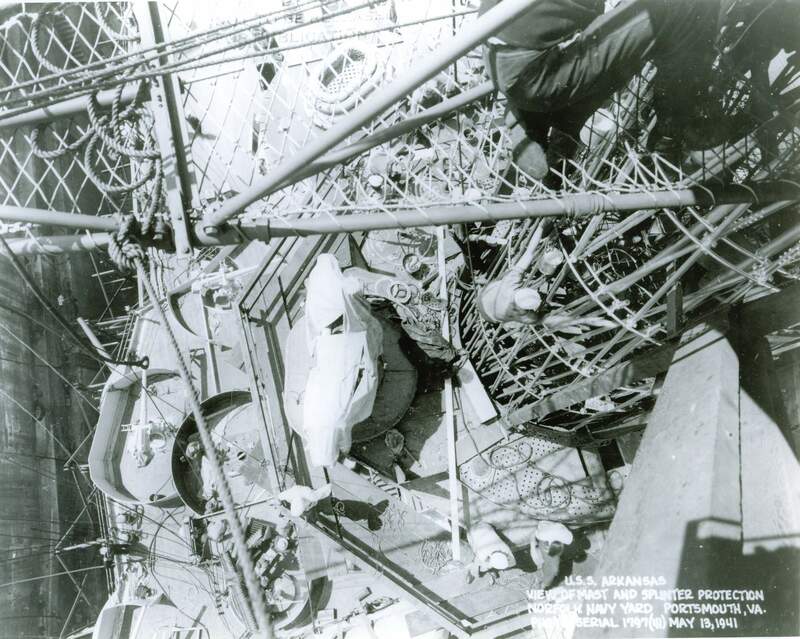 Note range device in front of crewman sitting on top of turret # 5. USN photo courtesy of Joseph Sandling via Fred Willshaw. 140k Looking from the German battleship Schleswig Holstein on Arkansas (BB-33) arriving in Kiel, Germany. Note German sailors standing at attention, 5 July 1930. USN Photo courtesy of Pieter Bakels. 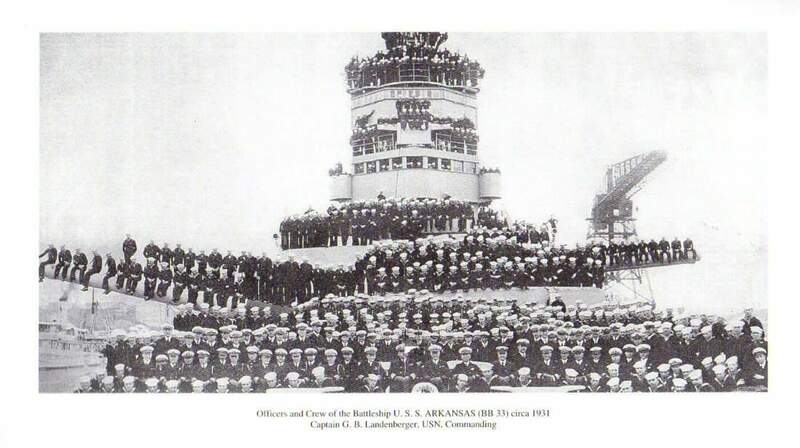 87k Officers and Crew of the Arkansas (BB-33), circa 1931. The CO was CAPT G. B. Lancenberger, USN. The photo might be in Phila. Pa., where she was from 20 October 1931 through early 1932. USN photo courtesy of Robert M. Cieri. 745k The battleship Arkansas (BB-33) passing under the Brooklyn Bridge on way out to sea. Photo by Froeber/NY Daily News Archive via Getty Images, courtesy of gettyimages.com. 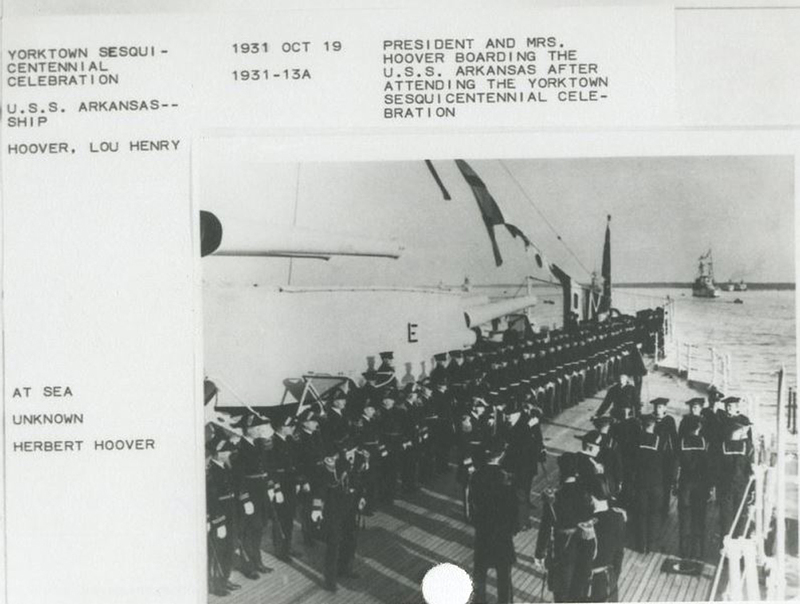 993k In October Arkansas (BB-33) participated in the Yorktown Sesquicentennial celebrations, embarking President Herbert Hoover and his party on 17 October and taking them to the exposition. She later transported the Chief Executive and his party back to Annapolis on 19 and 20 October. Photo courtesy of Herbert Hoover Presidential Library-Museum. Note; High-resolution scans can be ordered from the site. 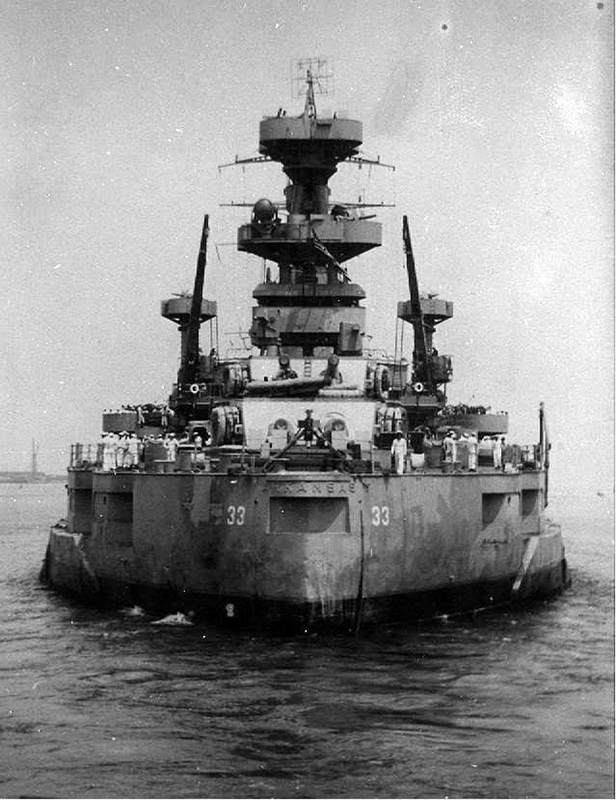 132k The rebuilt Arkansas (BB-33) is shown in October 1931. 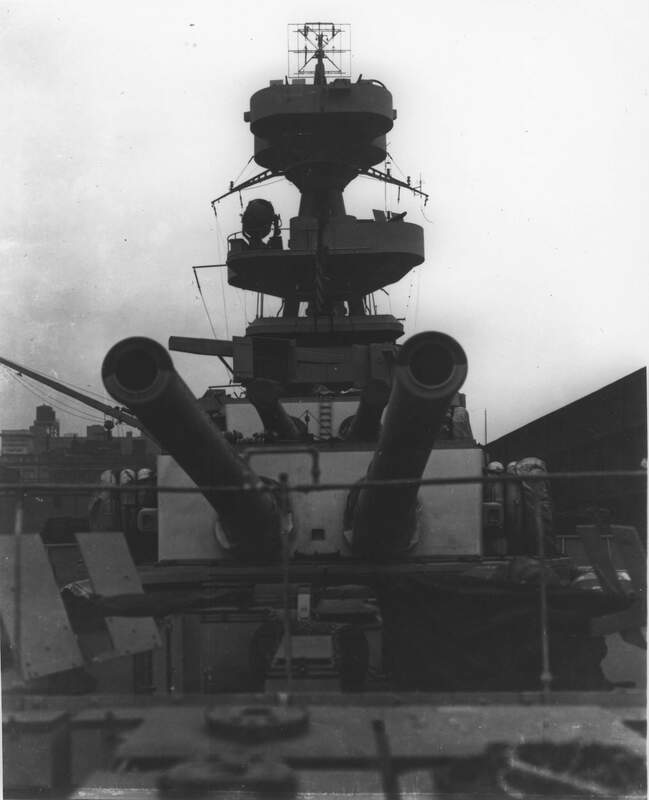 Note her three turret-top range finders, two of which survived to the end of her career. 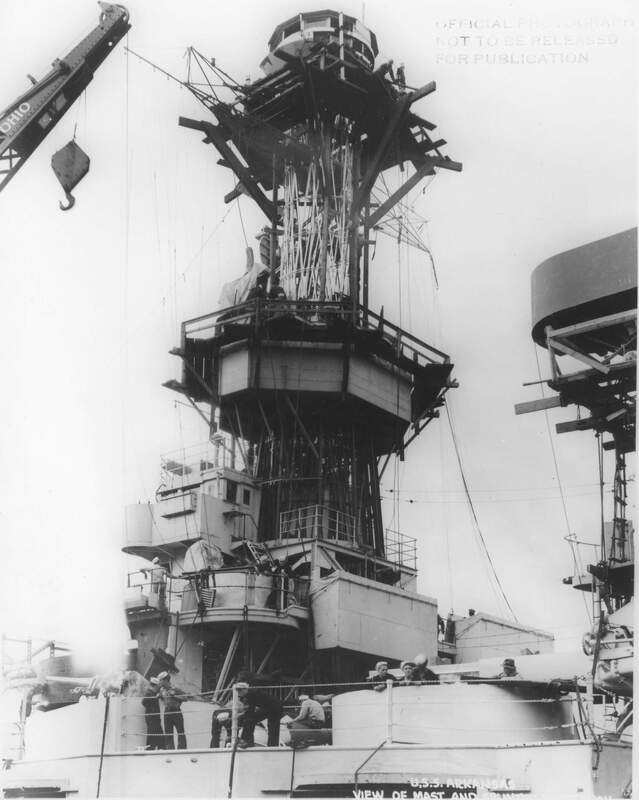 Her one cage mast carried a main battery fire control station at its head, with an antiaircraft control station inside the mast atop the torpedo defense station (5-inch fire control). 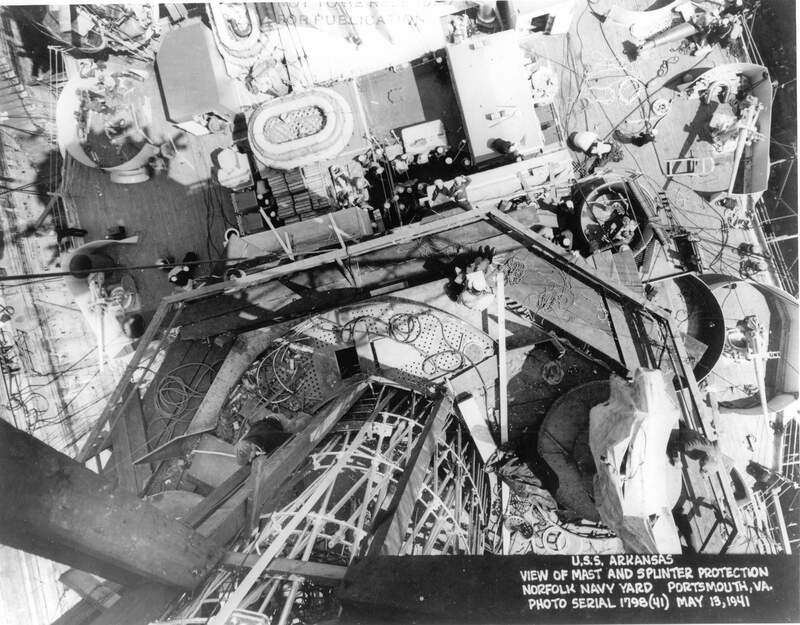 A flag plotting room occupied the base of the cage mast. 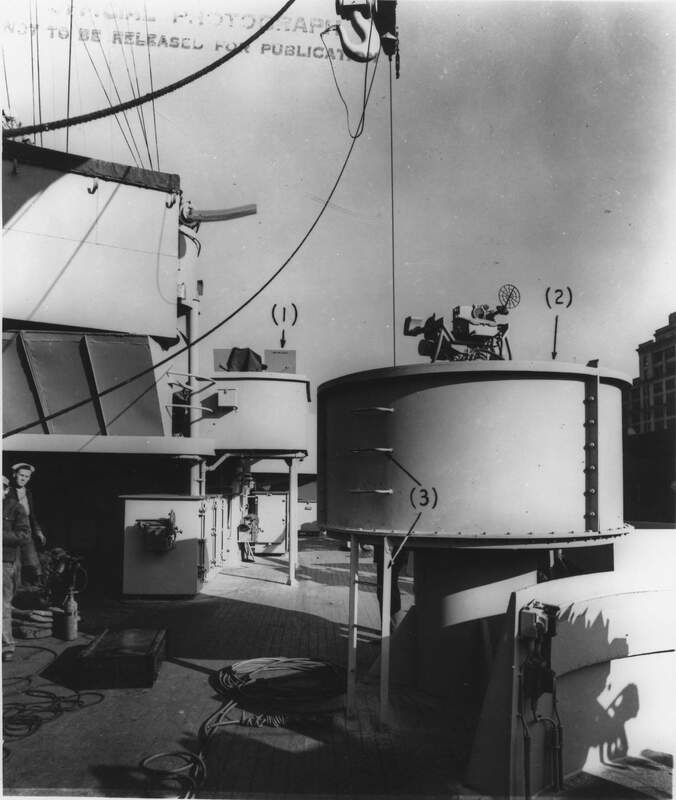 The structure abaft the funnel was the after control station, with a range finder atop it, the structure on the mainmast carrying controls for the searchlight above it. 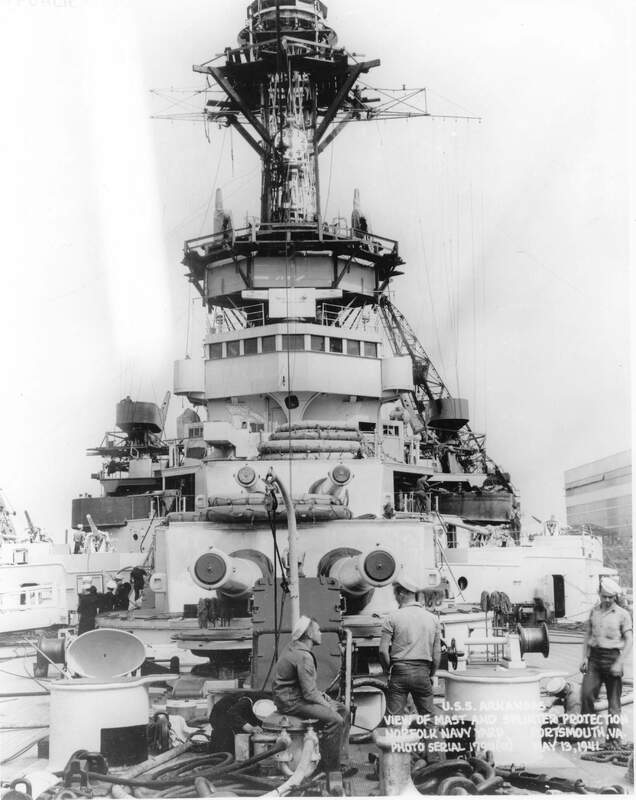 The Arkansas was the last reconstructed battleship to retain her cage mast, and by 1941 replacement by a tripod (for a configuration similar to that of New York (BB-34) was planned.) Photo and text courtesy of U.S. Battleships: An Illustrated Design History by Norman Friedman. 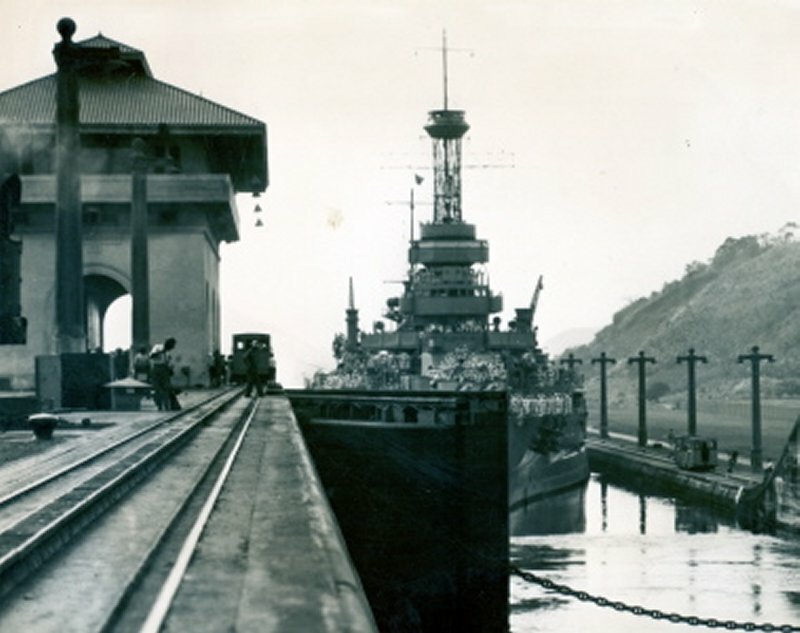 91k Cropped, close up of the Arkansas (BB-33) passing through Miraflores Locks, Panama Canal in the early 1930's. USNI / USN photo. 70k Uncropped photo of the Arkansas (BB-33) passing through Miraflores Locks, Panama Canal in the early 1930's showing the tracks of the accompanying trolleys as the ship passes through the stages of the locks. USNI / USN photo. 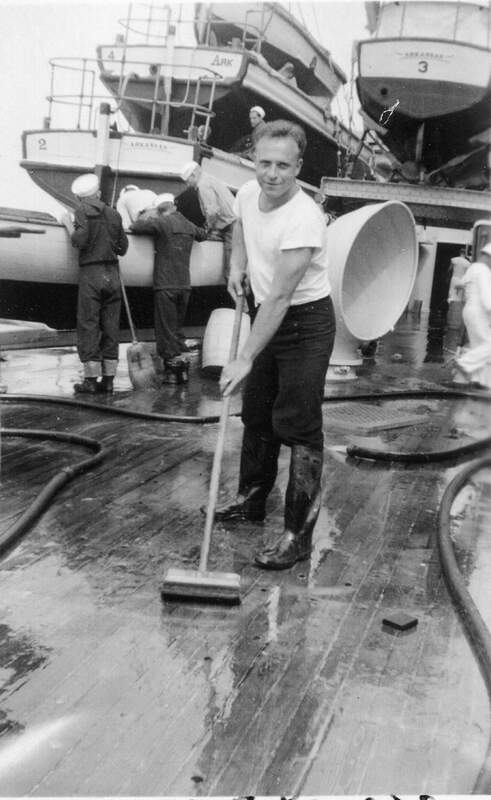 497k Swabbing the Boat deck of the Arkansas (BB-33) July 1933. Photo courtesy of Todd Willmarth via Mike Smolinski. 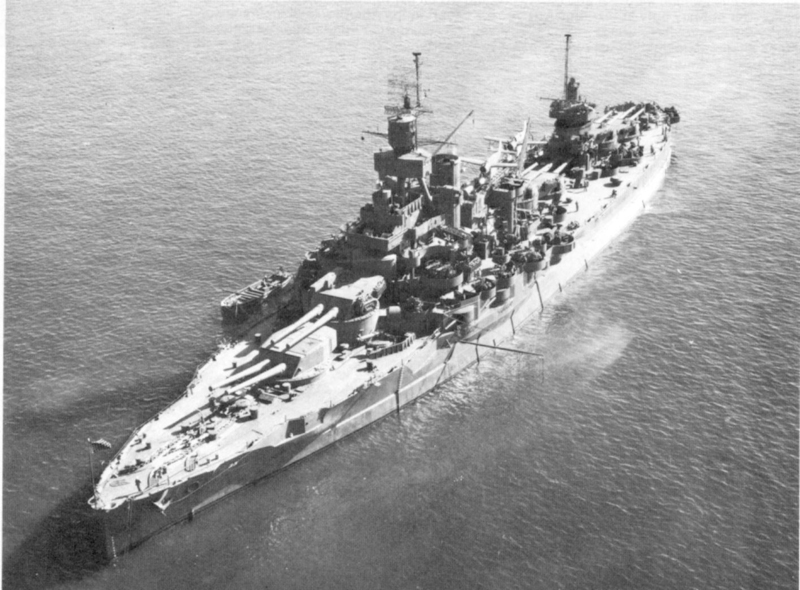 141k Overhead view of the Arkansas (BB-33) in a 1930's photo clearly shows her cage foremast, turret placement, and scout planes. 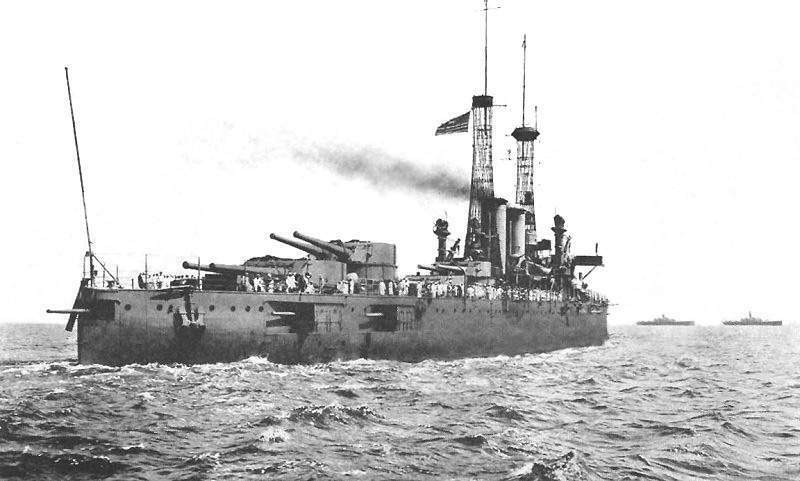 The Arkansas was the last battleship to mount 12" guns. USN photo. 563k At anchor, 1930's. Photo courtesy of Thomas Becher. 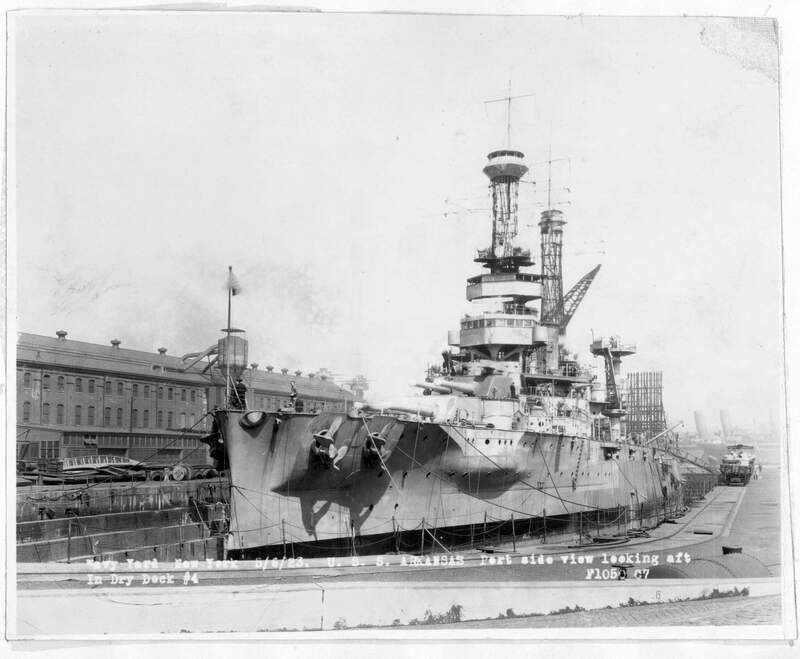 108k A reserve cruise detachment on the Arkansas (BB-33) in 1935 poses for a photo at the Boston Naval Yard (Charlestown, MA) 5th Division Naval Reserves. The photo was taken sometime between 28 September to 11 October 1935. The reserve cruise that year sailed from Charlestown, MA to Charleston, S.C.
Ed Cokely is the fifth from the left in the middle row of sailors. Photo from the collection of Edmund Cokely, WO2 USN, Retired & submitted by John Dupre. 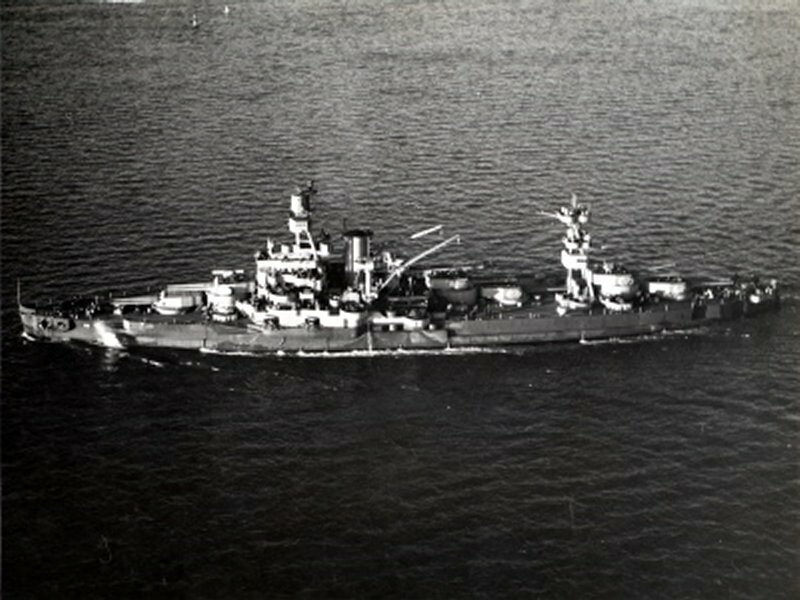 185k In January 1936, Arkansas (BB-33) participated in Fleet Landing Exercise No. 2 at Culebra, and then visited New Orleans for the Mardi Gras festivities before she returned to Norfolk for a navy yard overhaul which lasted through the spring of 1936. USN photo courtesy of Robert M. Cieri. 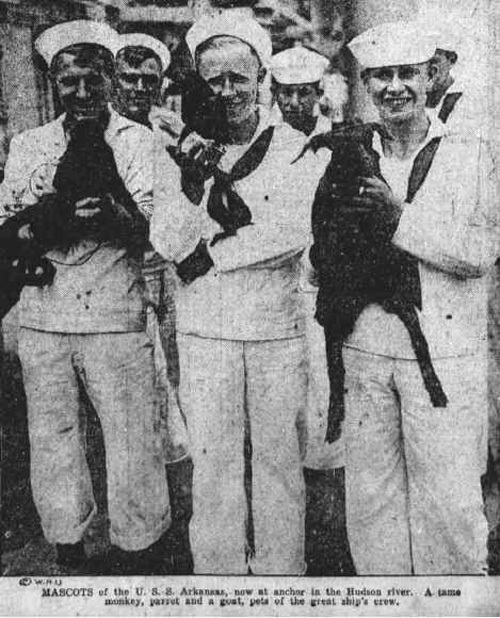 Upper classmen of the Naval Academy, the June week program over, are shown above on the dock at Annapolis, ready to leave on their training cruise. 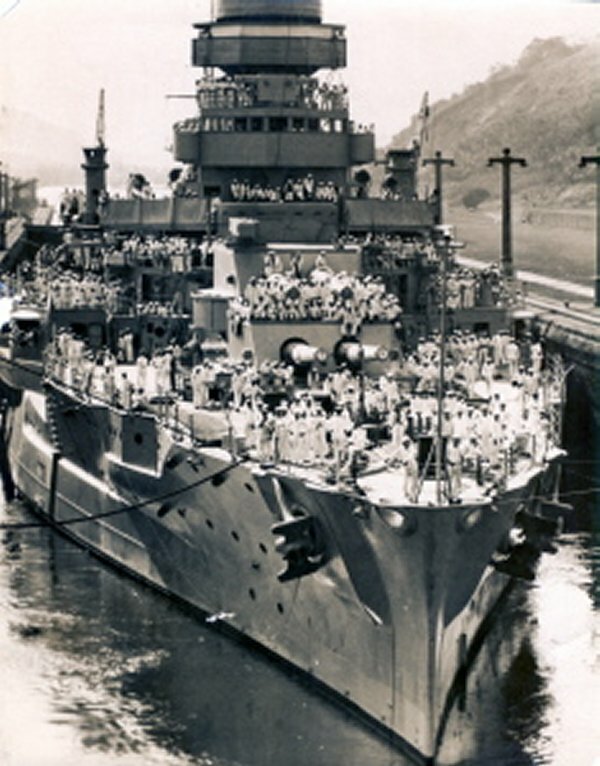 A few of the more than 1.000 "middies" making the cruise being ferried to the three battleships New York (BB-34), Wyoming AG-17) and Arkansas (BB-33), which will take them to Germany, Italy and Greece before their return to the Naval Academy in the Fall. 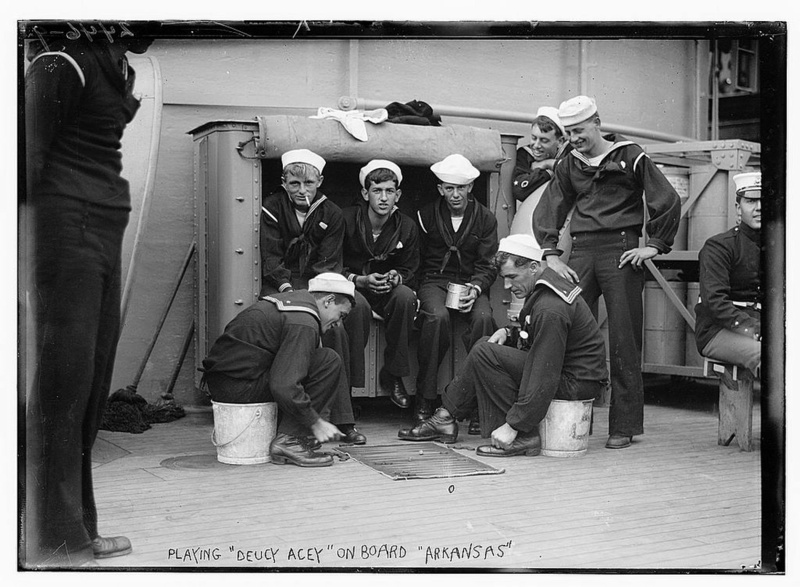 Boarding ship, in this case the New York, for the trip, an unusual feature of the course the midshipmen take in order to prepare themselves for their future roles as officers in Uncle Sam’s Navy. A. P. Photos. Photo & text by Evening Star. ([volume] (Washington, D.C.) 1854-1972, 05 June 1937, Image 11, courtesy of chroniclingamerica.loc.gov. 177k Arkansas (BB-33) as she appeared in 1937, when she made a midshipman practice cruise to European waters, visiting ports in Germany and England, before she returned to the east coast of the United States for local operations out of Norfolk. During the latter part of the year, the ship also ranged from Philadelphia and Boston to St., Thomas, Virgin Islands, and Cuban waters. USN photo. 88k Arkansas (BB-33) as she enters the Kaiser Wilhelm Canal, Kiel, Germany, 6 June 1937, during a midshipman training cruise. Text from U.S Naval Historical Centre Photo # NH 57691. 448k Dawn in the harbor of Kiel, Germany. 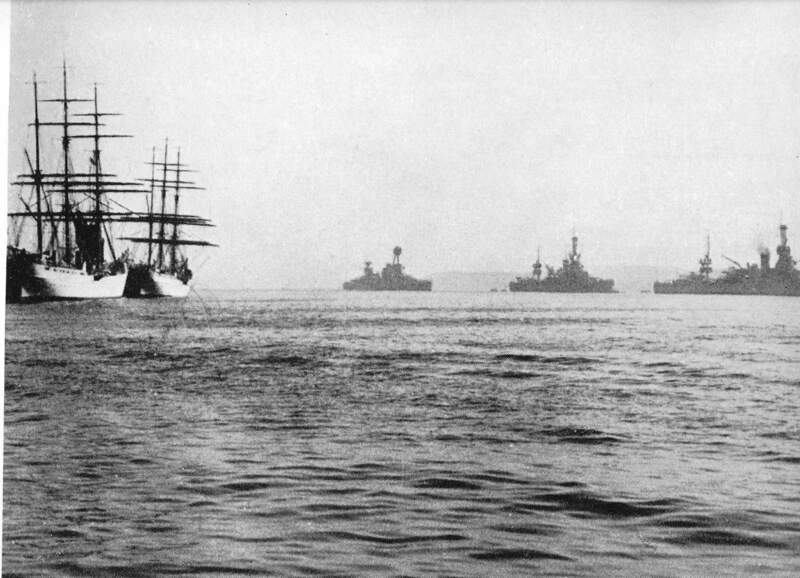 Left to right - training ships Gorch Fock and Horst Wessel, [Now USCGC Eagle], New York (BB-34), Wyoming (BB-32) and Arkansas (BB-33). USNIP., January 1938. USNI Photo Navy Recruiting Bureau, N.Y.
107k Late 1930s photo of the Arkansas (BB-33) moored at Casco, Maine showing her aft 12" turrets and turret mounted planes and catapults amidships. USN photo. 53k Commander John L. Hall, Jr. achieved the rank of Captain in July 1940 and was given command of the old battleship Arkansas (BB-33). This was followed by staff duty with elements of the Atlantic Fleet. 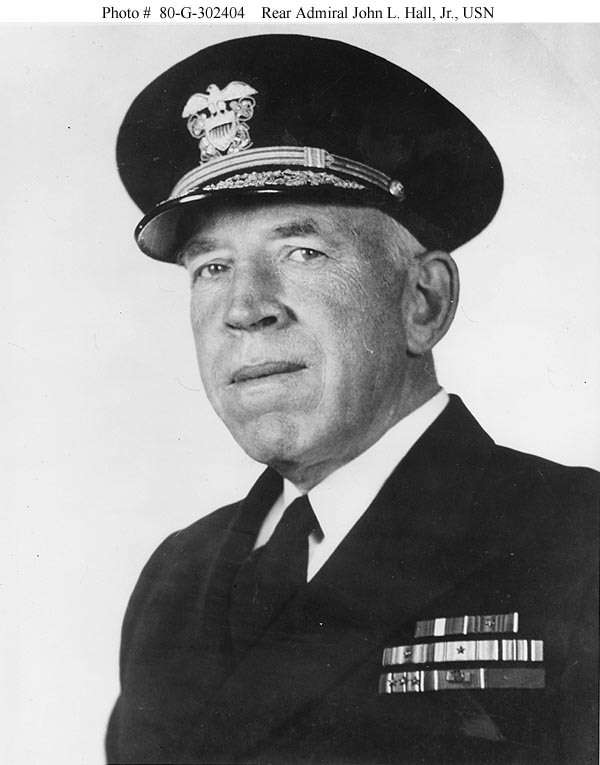 He is pictured here in a portrait photograph, taken circa 1942-1945. as a Rear Admiral. Official USN photo # 80-G-302404, now in the collections of the National Archives. 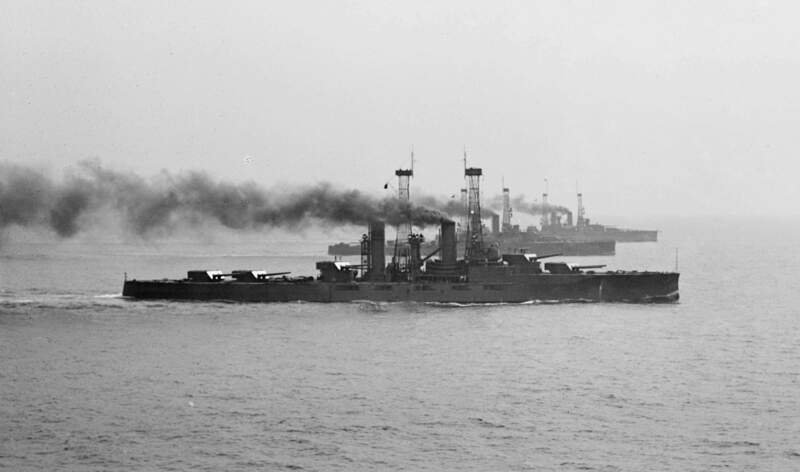 178k Arkansas (BB-33) & Texas (BB-35) sail in tandem. 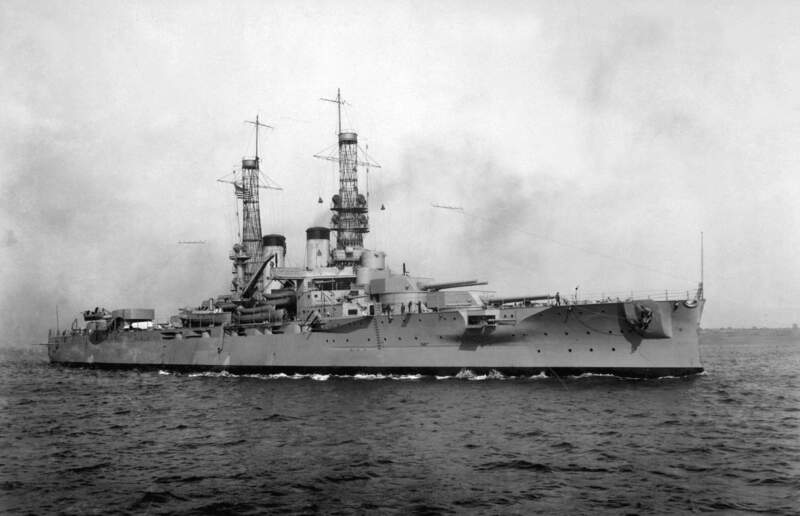 Arkansas departed Norfolk on 11 January 1940, in company with Texas and New York (BB-34), and proceeded thence to Guantanamo Bay for fleet exercises. 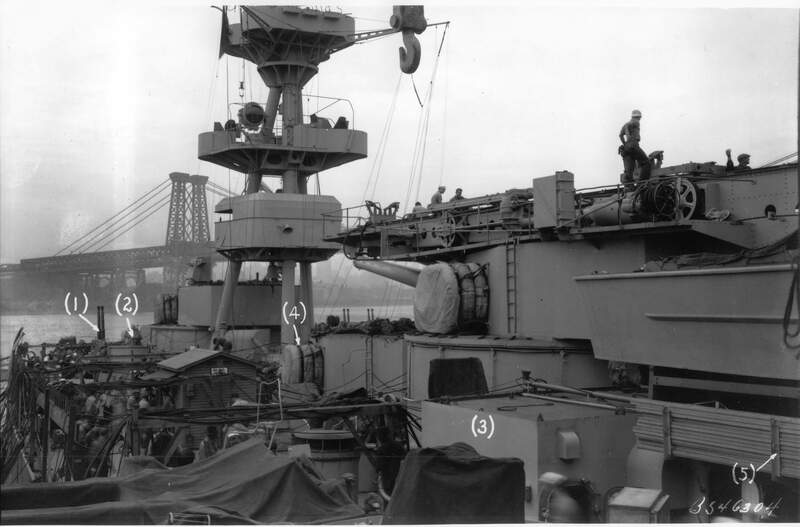 The easiest feature for distinguishing the Texas from the New York is the size of the navigation bridge which is located in the foremast one platform level above the roof of the conning tower. The bridge of the New York is short and extends only to the aft edge of the conning tower. The Texas' bridge extends to the forward edge of the conning tower with a single stanchion supporting its forward edge. These enclosed navigation bridges were added in 1917 at the "suggestion" of the Royal Navy who expressed the opinion that the open deck bridges found on American warships would be ill-suited for sailing in the North Sea or North Atlantic - they were right. USN photo courtesy of Robert M. Cieri. 295k Capt. 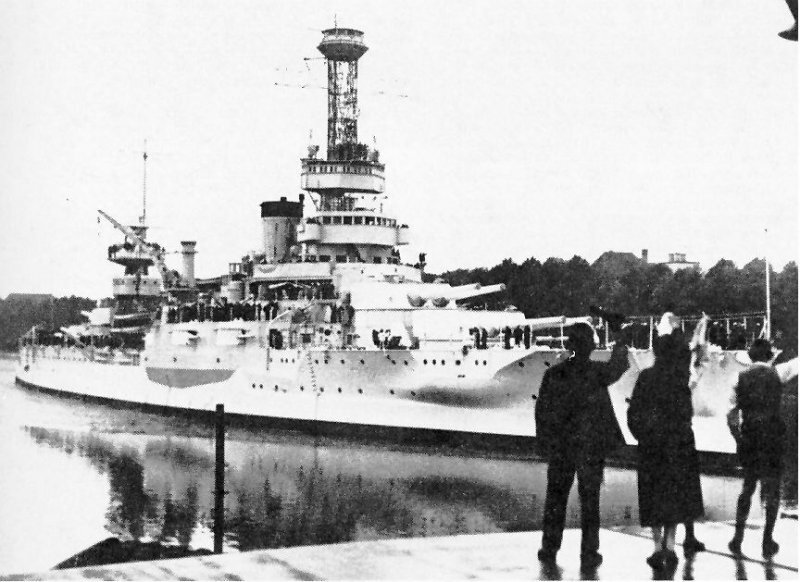 Charles S. Freeman U.S.N., making his weekly inspection of all hands on the Arkansas (BB-33). Each division salutes the Captain as he enters opened ranks of the division and after he has inspected the ranks the division faces about and the other half of the uniform is inspected; hair cuts are also given close scrutiny, hence the regulation hair cuts noticeable on blue jackets." Photo by George Rinhart/Corbis via Getty Image, courtesy of gettyimages.com. 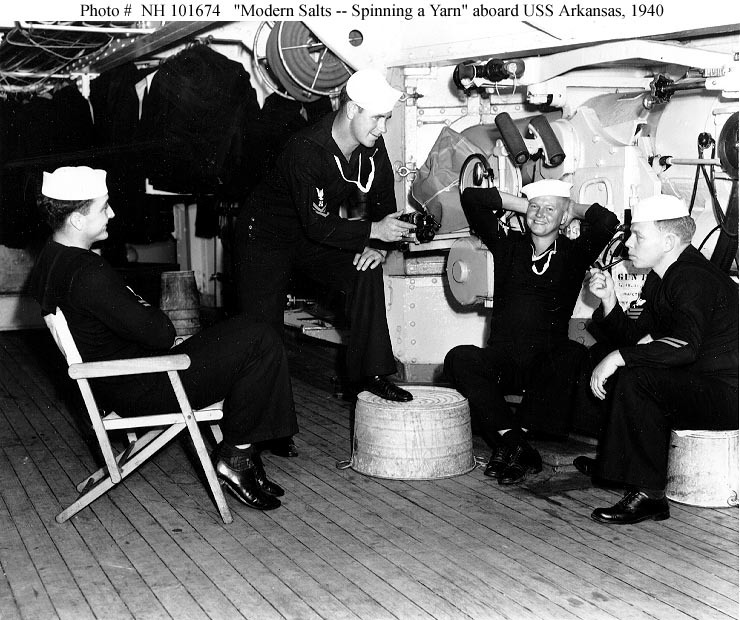 120k "Spinning a Yarn" in the casemate of 5"/51 Gun Number Eleven of Arkansas (BB-33) on 27 October 1940. The men are (from left to right): Gunner's Mate Second Class N.I. Fewell; Boatswain's Mate First Class R.D. Dennies; Coxwain G.E. Lehto and Gunner's Mate First Class W.A. Crook. Official USN photo # NH 101674, now in the collections of the National Archives. 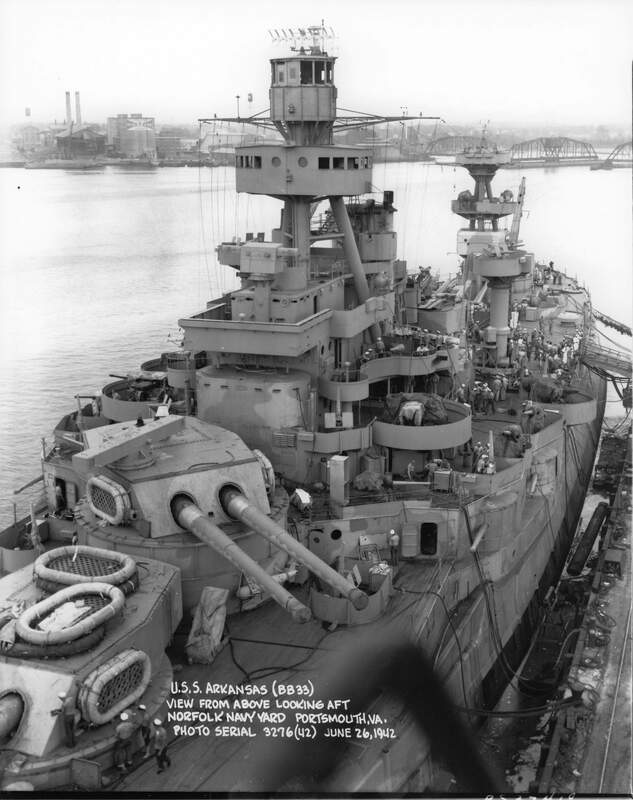 916k Broadside view of the Arkansas (BB-33), possibly in this circa or later. USN photo # N-1152, courtesy of Scott Koen & ussnewyork.com. 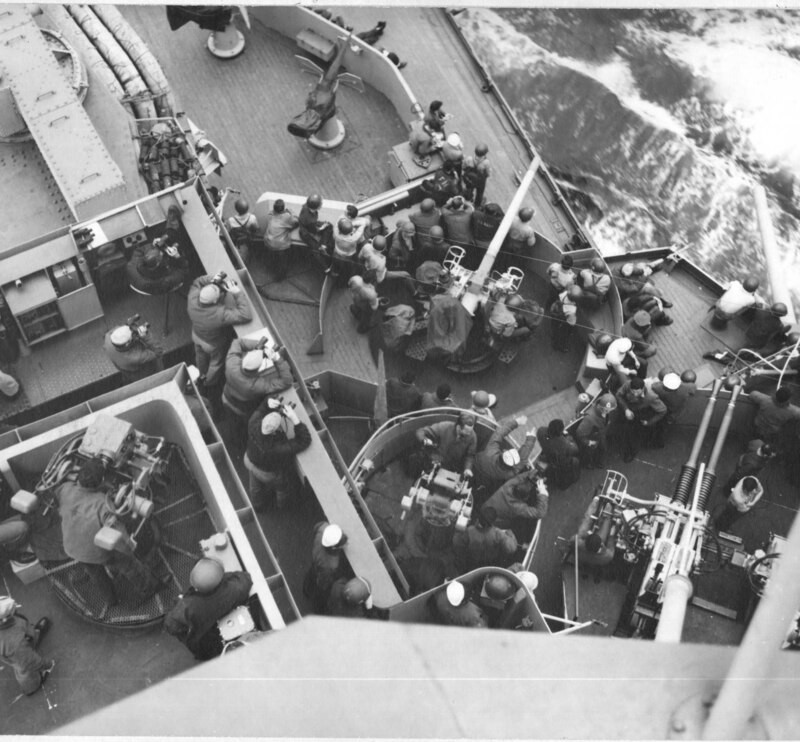 79k Church service on the after deck of HMS Prince of Wales, in Placentia Bay, Newfoundland, during the Atlantic Charter Conference, 10-12 August 1941. Seated in the center are President Franklin D. Roosevelt (left) and Prime Minister Winston Churchill. Standing behind them are Admiral Ernest J. 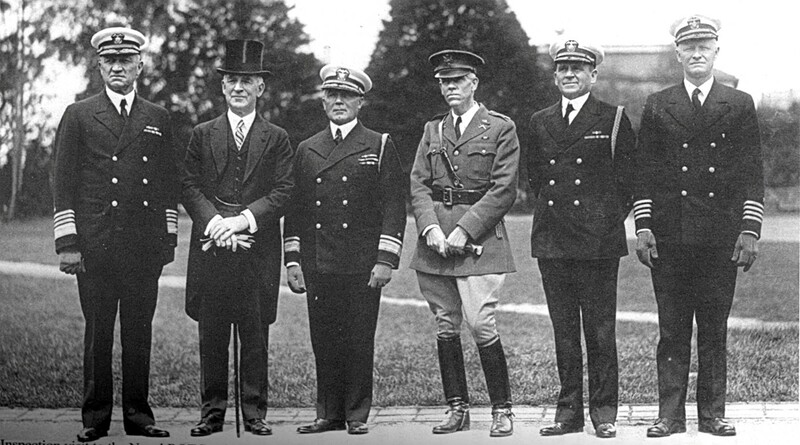 King, USN (between Roosevelt and Churchill); General George C. Marshall, U.S. Army; General Sir John Dill, British Army; Admiral Harold R. Stark, USN; and Admiral Sir Dudley Pound, RN. 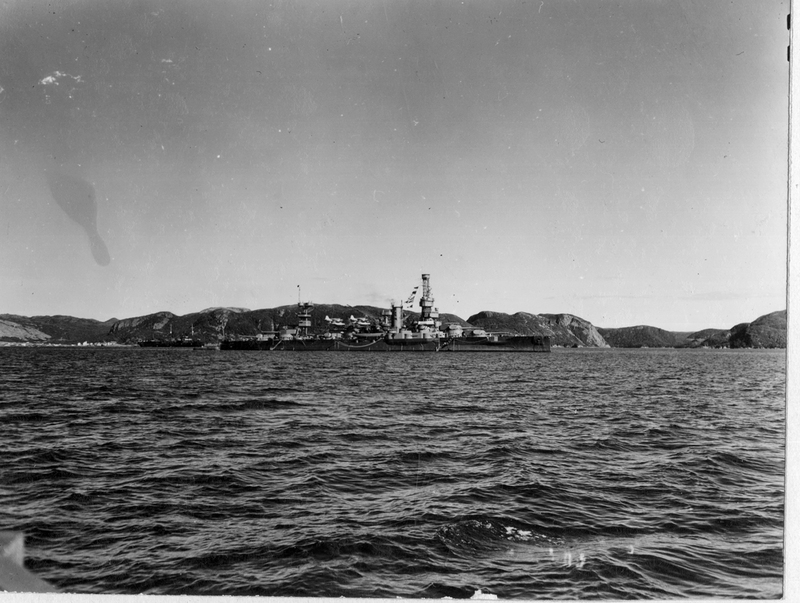 Arkansas (BB-33) is in the center distance. USNHC photo # NH 67208. Donation of Vice Admiral Harry Sanders, USN(Retired), 1969. 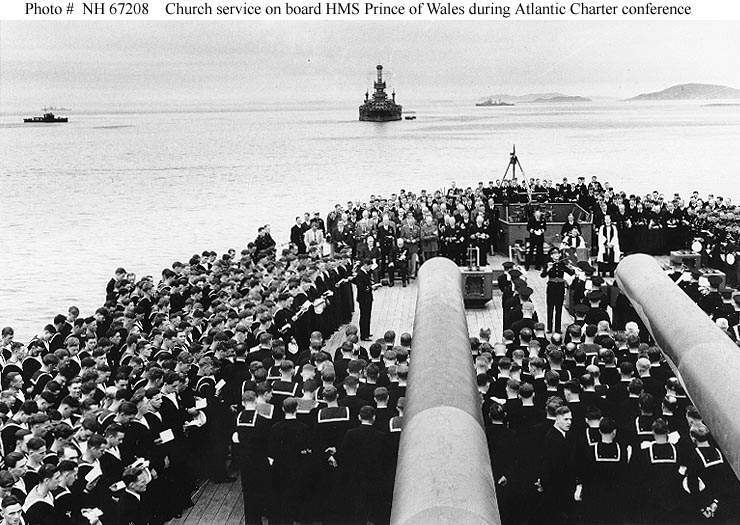 289k Church service on the after deck of HMS Prince of Wales, in Placentia Bay, Newfoundland, during the Atlantic Charter Conference, 10-12 August 1941. Seated in the center are President Franklin D. Roosevelt (left) and Prime Minister Winston Churchill. 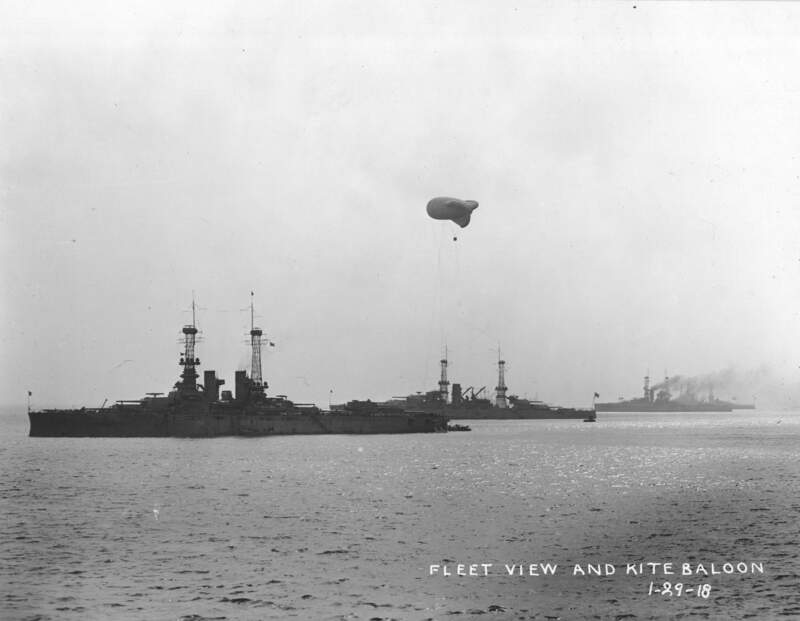 The Arkansas (BB-33) is in the center distance. USN photo courtesy of Pieter Bakels. 413k Signature of President Roosevelt and Mr.Churchill on card signed at Placentia Bay. USN photo courtesy of Pieter Bakels. 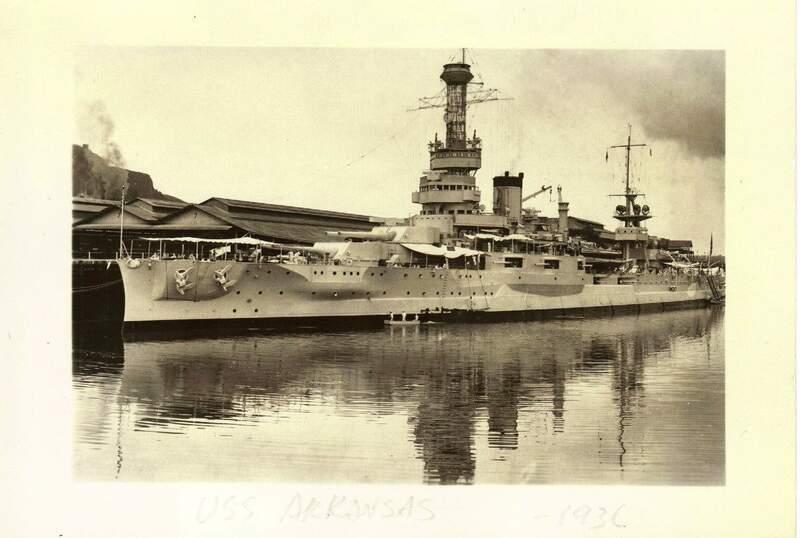 194k Arkansas (BB-33) anchored in a port, possibly circa 1941. USN photo courtesy of Robert M. Cieri. 369k Bow view,looking aft at mast and splinter protection. Norfolk Navy Yard, Portsmouth, VA. 13 May 1941. USN photo courtesy of Pieter Bakels. Photo Serial # 1794(41). 245k View of mast and splinter protection. Norfolk Navy Yard, Portsmouth, VA. 13 May 1941. USN photo courtesy of Pieter Bakels. 244k View of mast and splinter protection. Norfolk Navy Yard, Portsmouth, VA. 13 May 1941. USN photo courtesy of Pieter Bakels. Photo Serial # 1795(41). 872k Good view of the concentration dial from a top down perspective, view of mast and splinter protection. Norfolk Navy Yard, Portsmouth, VA. 13 May 1941. USN photo courtesy of Pieter Bakels. 393k View of mast and splinter protection. Norfolk Navy Yard, Portsmouth, VA. 13 May 1941. USN photo courtesy of Pieter Bakels. Photo Serial # 1797(41). 416k View of mast and splinter protection. Norfolk Navy Yard, Portsmouth, VA. 13 May 1941. USN photo courtesy of Pieter Bakels. 406k View of mast and splinter protection. Norfolk Navy Yard, Portsmouth, VA. 13 May 1941. USN photo courtesy of Pieter Bakels. Photo Serial # 1798(41). 1.32k Arkansas (BB-33) with bleak mountain scenery, September 1941. USN photo # 80G-238521 from NARA, College Park, Maryland, courtesy of Sean Hert. 410k Arkansas (BB-33) anchored off Portland, Maine, in February 1942, shortly before the overhaul that replaced her "basket" foremast with a tripod. 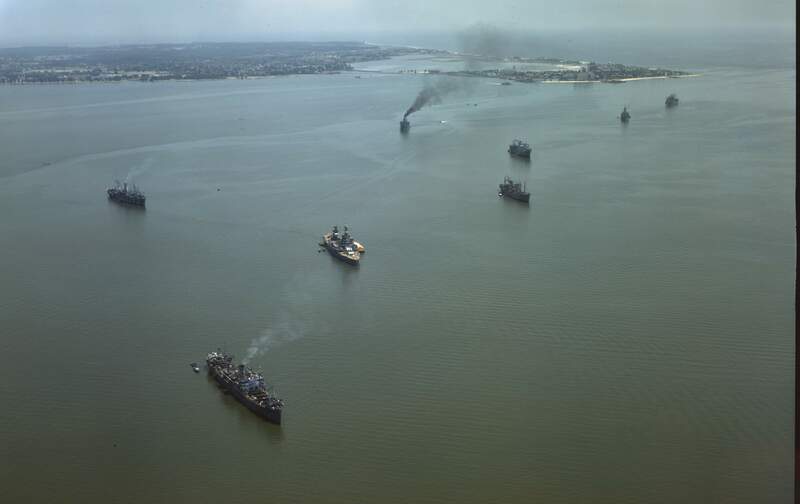 Photographed from Wasp (CV-7). USN photo # 80-G-464618, now in the collection of the US National Archives in College Park, Maryland, courtesy of Sean Hert. 408k On 6 March 1942, Arkansas (BB-33) arrived at Norfolk to begin overhaul. 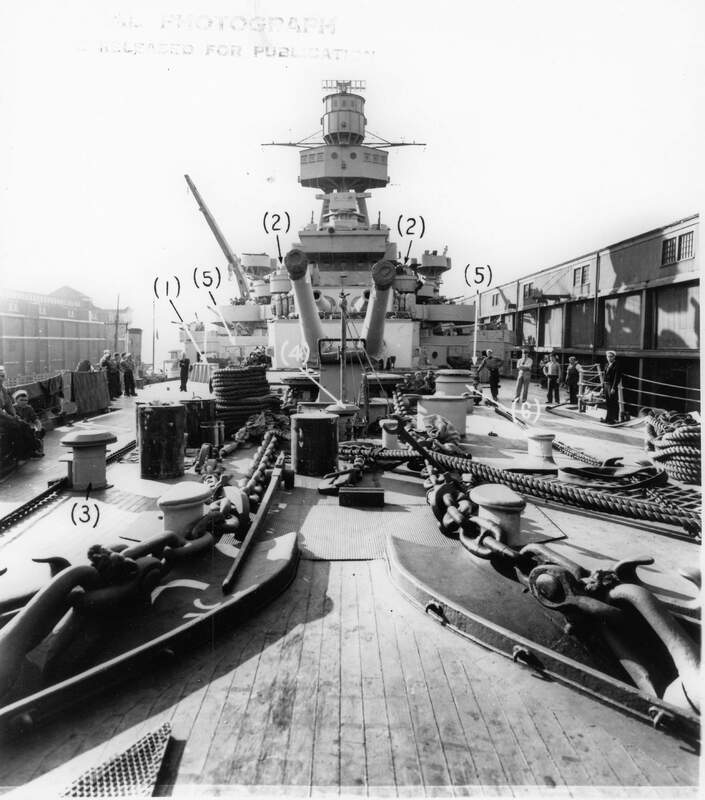 443k A Shore Patrol detail gathers at the foot of the Arkansas's (BB-33) gangway in this photo of a plan view port side, looking aft, showing alterations. Norfolk Navy Yard, Portsmouth, VA. 24 June 1942. Note the Gulf oil tank farm in the background. USN photo courtesy of Pieter Bakels. Photo Serial # 3279(42). 500k Plan view, Fwd., looking aft.with an open bridge and forward tripod mast. This refit was basically limited to the bridge structure alteration. Norfolk Navy Yard, Portsmouth,VA. 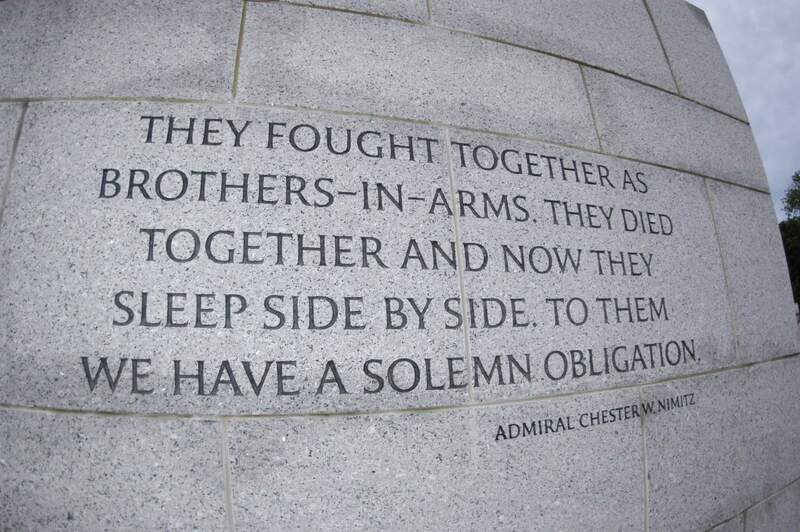 26 June 1942. USN photo courtesy of Pieter Bakels. Photo Serial # 3276(42). 801k Looking out at Building 171 (Machine Shop). View from after mast looking Fwd. Norfolk Navy Yard, Portsmouth,VA. 26 June 1942. USN photo courtesy of Pieter Bakels. Photo Serial # 3277(42). 294k View from bow, looking aft. Norfolk Navy Yard, Portsmouth,VA. 26 June 1942. USN photo courtesy of Pieter Bakels. Photo Serial # 3278(42). 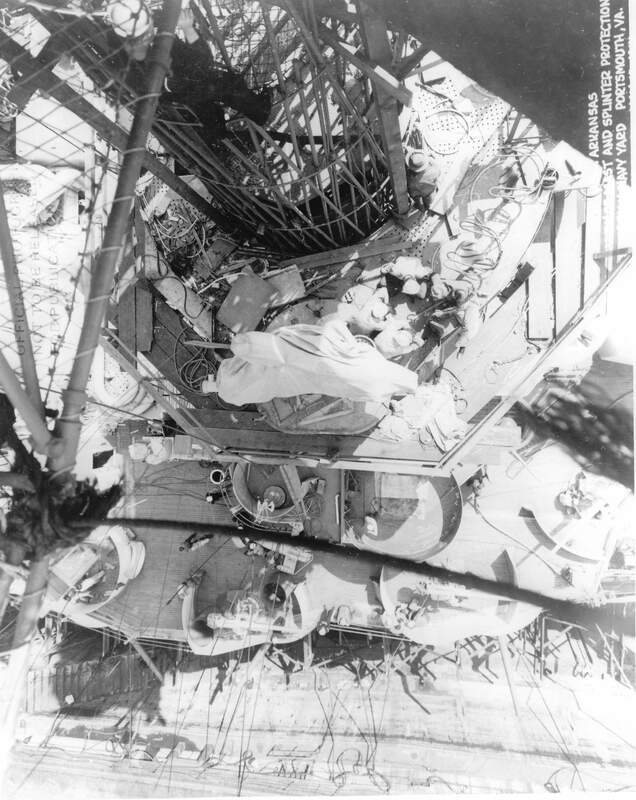 478k A sailor catches a nap on a wooden crate in the hot summer sun in this view looking aft from top of after mast. Norfolk Navy Yard, Portsmouth, VA. 26 June 1942. USN photo courtesy of Pieter Bakels. Photo Serial # 3280(42). 158k Port bow view of the Arkansas (BB-33) at Norfolk Navy Yard, Portsmouth, VA. 27 June 1942. USN photo courtesy of Pieter Bakels. 250k Close-up view, port side of the Arkansas (BB-33) at Norfolk Navy Yard, Portsmouth, VA. 27 June 1942. USN photo courtesy of Pieter Bakels. Photo Serial # 3269(42). 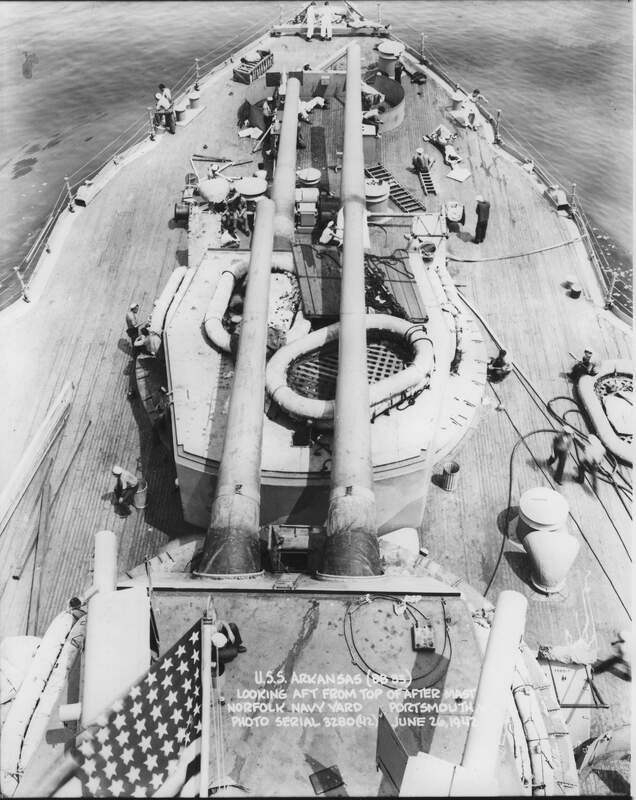 329k Stern view of the Arkansas (BB-33). USN photo courtesy of Ed Zajkowski. 272k Broadside of the Arkansas (BB-33), Navy Yard, N.Y., 23 September 1942. USN photo # 80-G-323392, now in the collection of the US National Archives in College Park, Maryland, courtesy of Sean Hert. 1.32k Arkansas (BB-33) escorting a troopship convoy to Great Britain on 6 October 1942. Source: "The media for this item are free to reuse for non-commercial purposes under the IWM Non Commercial Licence. Video, sound and images can be embedded with the code we offer here, and images can also be downloaded. By downloading any images or embedding any media, you agree to the terms and conditions of the IWM Non Commercial Licence, including your use of the attribution statement specified by IWM. Imperial War Museum Admiralty Official collection by Beadell S.J. (Lt), Photo No. IWM (A 12459) © courtesy of Mike Green. 354k View from bow, looking aft. Alts #1 & 5- 20mm guns and Fnds, added. Splintershields extended. #2- Mk.45 Director added. #3&4- Mushroom Ventilators. Navy Yard, N.Y. 30 October 1942. USN photo courtesy of Pieter Bakels. 269k No Smoking sign appears to the left of the gun mount on the Arkansas's (BB-33) port side, Main Deck, looking Fwd., showing alterations. (20mm Gun, Fdn.& splinter shield, MK.48 & Mk.51 Director at the Navy Yard, N.Y. 30 October 1942. USN photo courtesy of Pieter Bakels. 222k Paint brushes soaking in turpentine in a 5 gallon paint can appear in this Stb.Deck view, looking Fwd. Alterations: 1.1-Inch, Fdn., bulwark stowage inside of shield, mushroom vent. director, 20mm gun, shield & fdn. Navy Yard, N.Y. October 1942. USN photo courtesy of Pieter Bakels. 185k View showing alterations. Navy Yard, N.Y. 30 October 1942. USN photo courtesy of Pieter Bakels. 273k The deck is clear of paint droppings from the 5 gallon oil based paint that lies in this stern view of the Arkansas (BB-33) looking Fwd., showing the relocated 20mm R.S.Lockers at the N.Y. Navy Yard on 30 October, 1942. USN photo courtesy of Pieter Bakels. 203k Stb.side, Main Deck, looking Fwd.showing alterations. 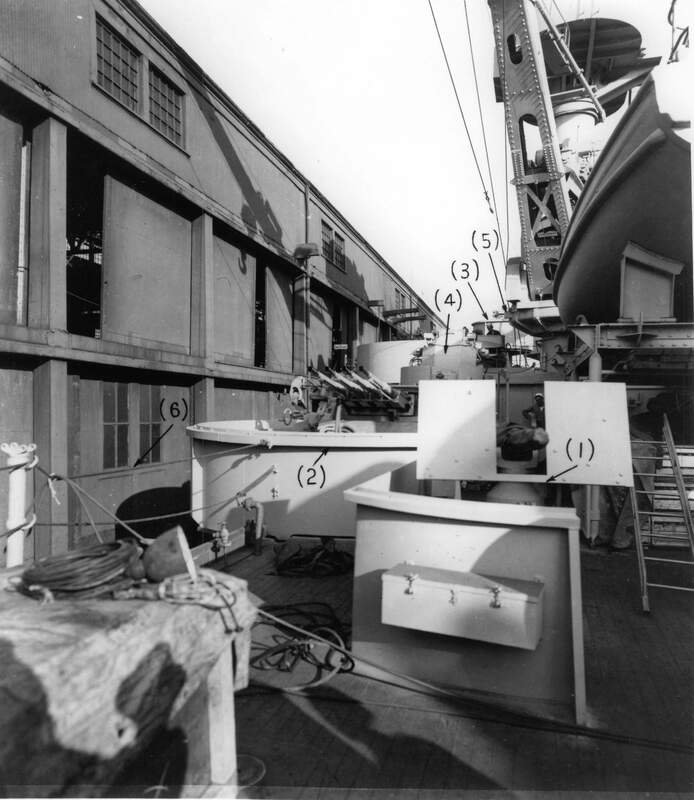 (roller chocks, splinter shields for 20MM and 1.1-Inch Mount and R.S.Lockers) Navy Yard, N.Y. 1 January 1943. USN photo courtesy of Pieter Bakels. 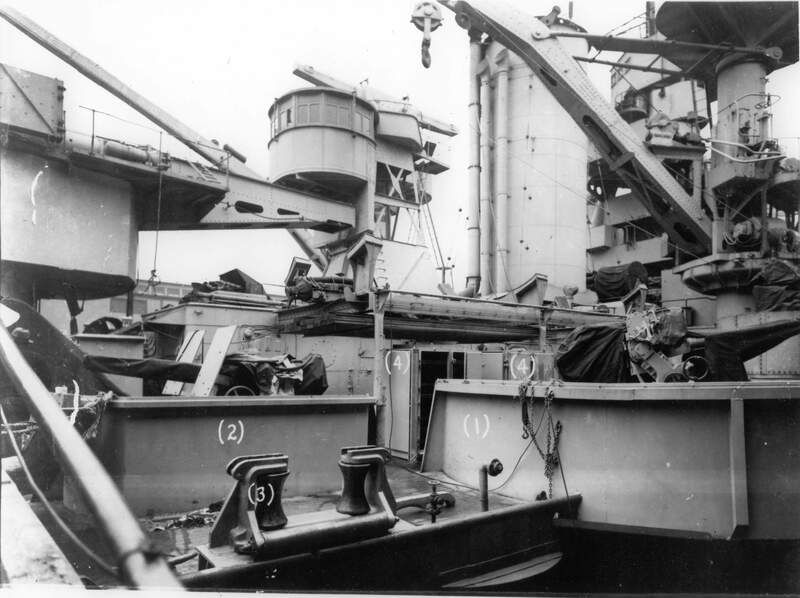 249k Stb.side, Main Deck, looking aft, showing alterations, 1943. USN photo courtesy of Pieter Bakels. 241k Bow view, looking aft, showing alterations. Navy Yard, N.Y. 1 January 1943. USN photo courtesy of Pieter Bakels. Photo Serial # 3278(42). 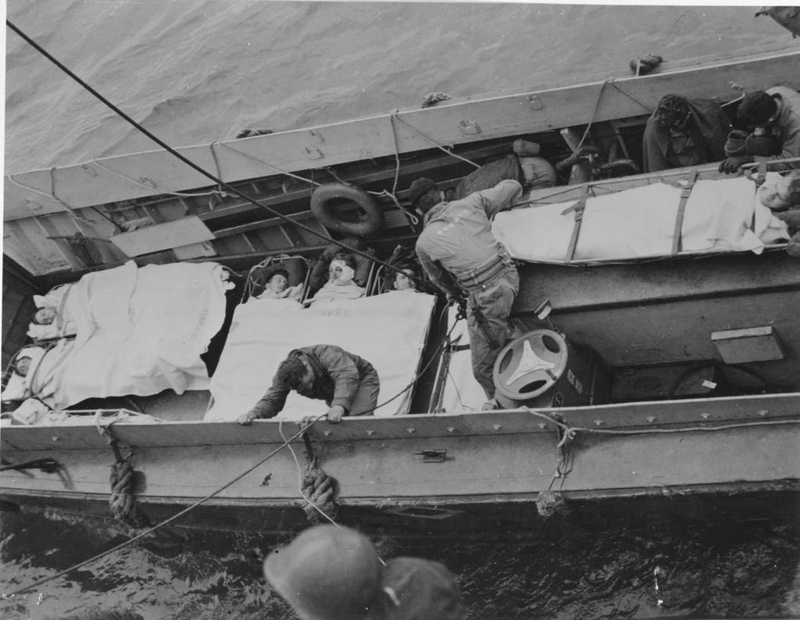 221k Triple life rafts covered by a tarp appear aboard the Arkansas (BB-33) at the N.Y. Navy Yard in January 1943. USN photo courtesy of Pieter Bakels. 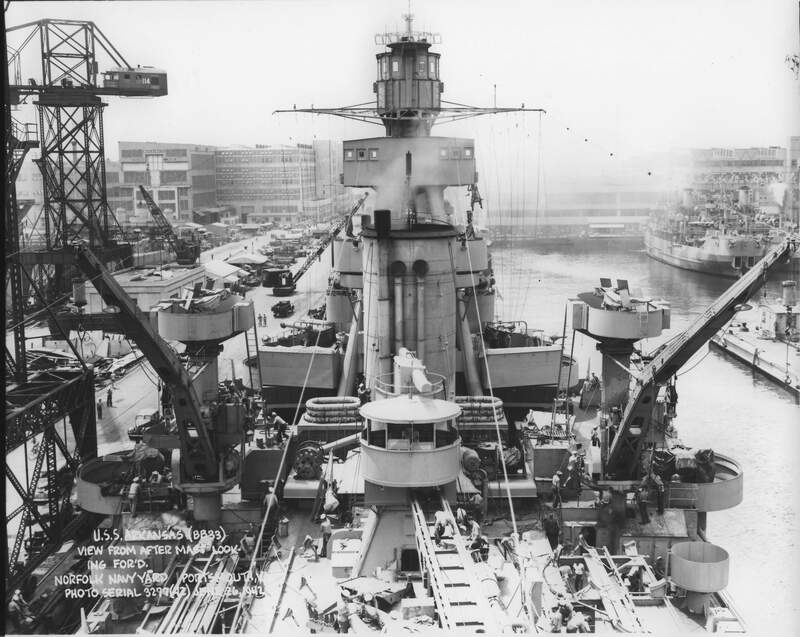 154k Forward view of the Arkansas (BB-33) at the N.Y. Navy Yard on 1 January 1943. USN photo courtesy of Pieter Bakels. 92k Overhead starboard stern view of the Arkansas (BB-33) on 2 January 1943. The ship is bound for on Chesapeake Bay for gunnery drills, returning to New York on January 30th to begin preparation for another transatlantic trip to and from Casablanca. Photo & text from the Division of Naval Intelligence, Identification and Characteristics Section, as published in June, 1943, courtesy of Mike Green. 89k Arkansas (BB-33) is pictured here as she sailed to Chesapeake Bay for gunnery drills on 2 January 1943. USN photo. 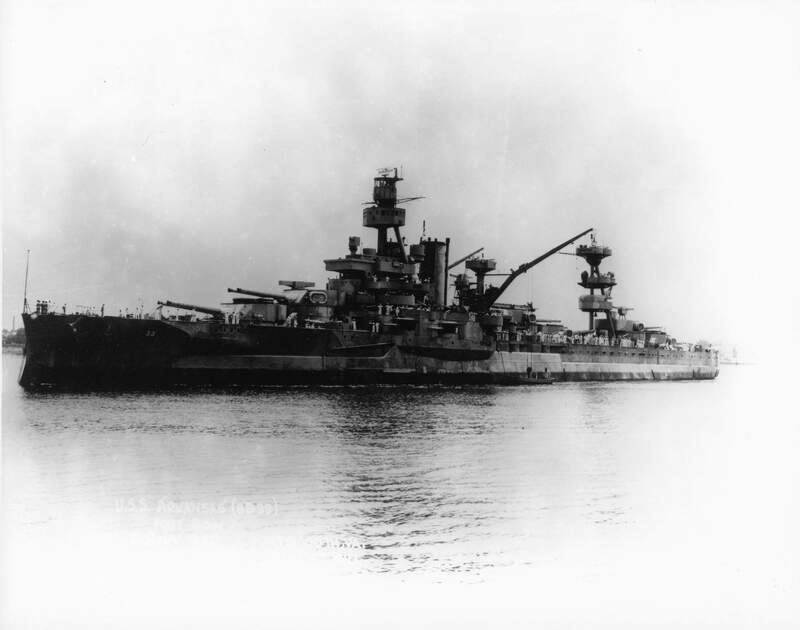 74k Captain Bryant went to the battleship Arkansas (BB-33) and commanded her during two eventful years of rising tension and war in the Atlantic. 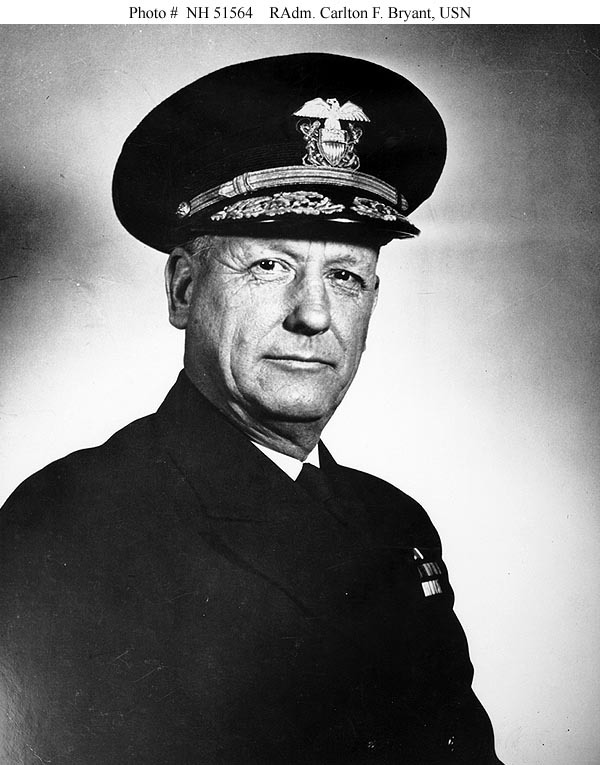 After achieving Flag Rank, in May 1943 Rear Admiral Bryant was given command of an Atlantic Fleet battleship division. His force provided effective gunfire support during the June 1944 Normandy Operation and the invasion of Southern France two months later. From October 1944 until the beginning of 1946, he was Commander, Fleet Operations Training Command, Atlantic Fleet. Elevated to the rank of Vice Admiral when he retired in May 1946, Carleton F. Bryant died at Camden, Maine, on 11 April 1987. Rear Admiral Carlton F. Bryant, USN, Portrait photograph, dated December 1950 but probably taken circa 1945. U.S. Naval Historical Center Photograph # NH 51564 submitted via Bill Gonyo. 384k Arkansas (BB-33) at the Navy Yard, N.Y. in May, 1943. Note the new Quad.40MM and the new 3-Inch mount. See expanded text on next photo below. USN photo courtesy of Pieter Bakels. 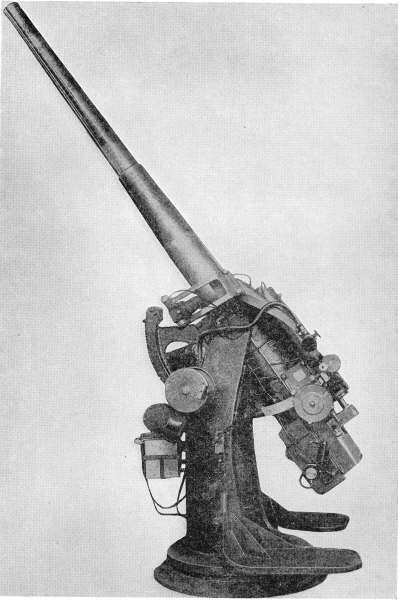 135k Bofors 40mm anti-aircraft gun. Note the considerable trunnion height, about 66 inches and the cut away rear to allow for extreme elevation (90 degrees). 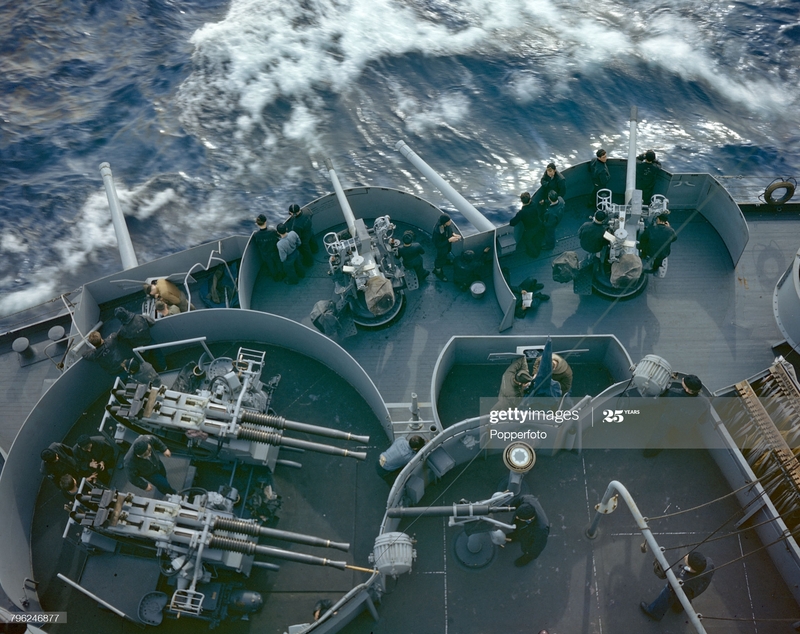 On the Upper Deck the gun was capable of training wherever the superstructure did not interfere and it could be fired at all angles of train. The carriage forming the greater part of this mount rested over a low cylindrical stand, bolted to a foundation plate in deck and was supported by two ball bearings,designed to reduce friction, an inner - and an outer ball bearing. The inner bearing took the compression, load, weight and vertical downward trust of recoil when the gun was fired. The outer bearing held the carriage on the stand and took the tension, due to the roll of the ship and to upward thrust of recoil when the gun was fired at low angles of elevation. A training worm, meshed with the training circle, was connected by a shaft and gearing with the trainer's two-hand drive at the right of the gun. 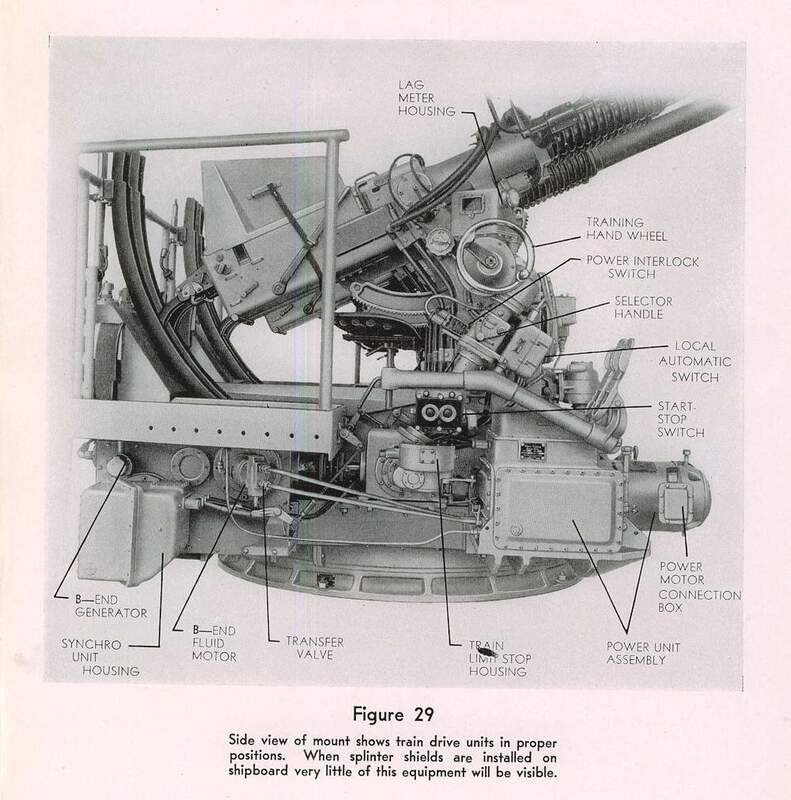 On the left side was the pointer's two-hand drive that actuated a pinion meshing with the elevating arc. At the top of the carriage were the trunnion seats in which the trunnions rested. The latter formed part of the slide through which the gun slides recoiled and counter-recoiled. 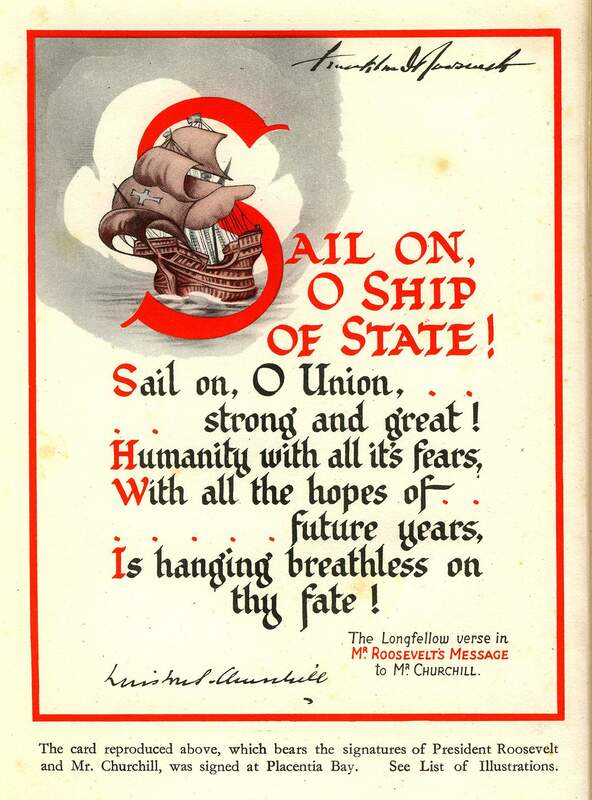 Text from A Textbook, prepared for the use of Midshipmen of the United States Naval Academy by Officers of the United States Navy. The US Naval Institute, Annapolis, MD., 1939). USN photo courtesy of Pieter Bakels taken from "Naval Ordnance". 231k Stb.side, Main Deck, looking aft, showing alterations at the N.Y. Navy Yard on 25 May, 1943. USN photo courtesy of Pieter Bakels. 313k A slight breeze blows the clouds of smoke from the factory through the air and ruffles Arkansas's (BB-33) signal flags and Old Glory in this view at the N.Y. Navy Yard on 25 May 1943. USN photo courtesy of Pieter Bakels. 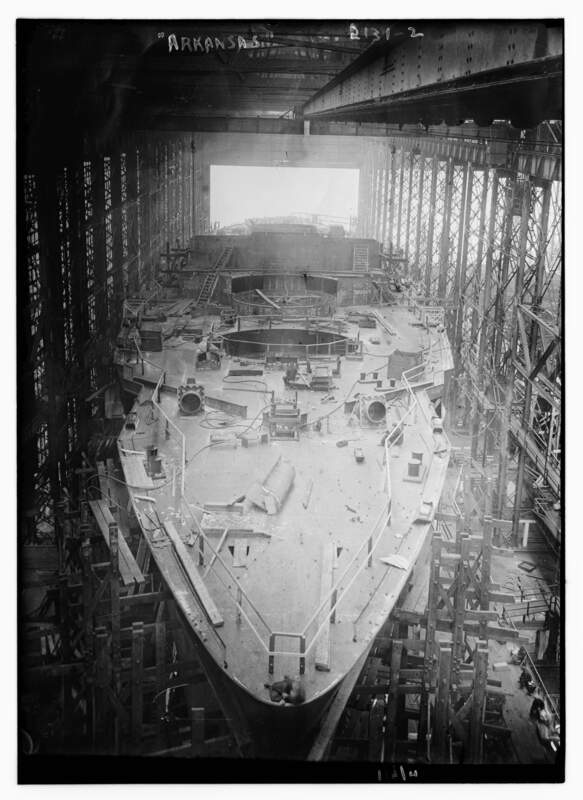 402k View from after mast, looking Fwd.Navy Yard, N.Y. 25 May 1943. USN photo courtesy of Pieter Bakels. Photo Serial # 3280(42). 204k Plan view, looking towards bow, showing alterations. #1-Bucket type ventilators. Navy Yard, N.Y. 25 May 1943. USN photo courtesy of Pieter Bakels. 98k View of the Arkansas (BB-33) looking out to her stern top catapult, 25 May 1943. USN photo courtesy of Ed Zajkowski. 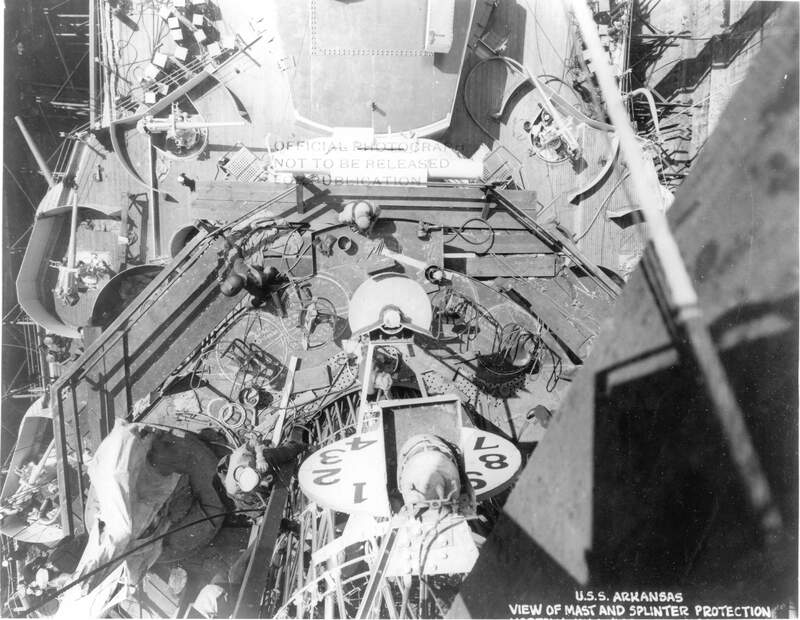 379k View of the secondary armament aboard the Arkansas (BB-33), 25 May 1943. USN photo courtesy of Ed Zajkowski. 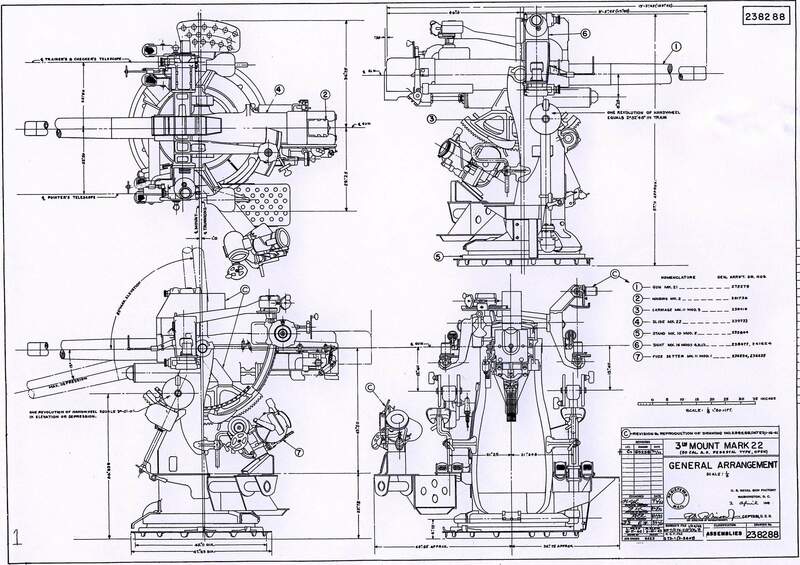 36k Arkansas (BB-33) class line drawing, 11/43. Courtesy of Joe Radigan. 76k Arkansas (BB-33), in March 1944 wearing Measure 22 camouflage. Courtesy of Joe Radigan from the Imperial War Museum, photo # A21867. 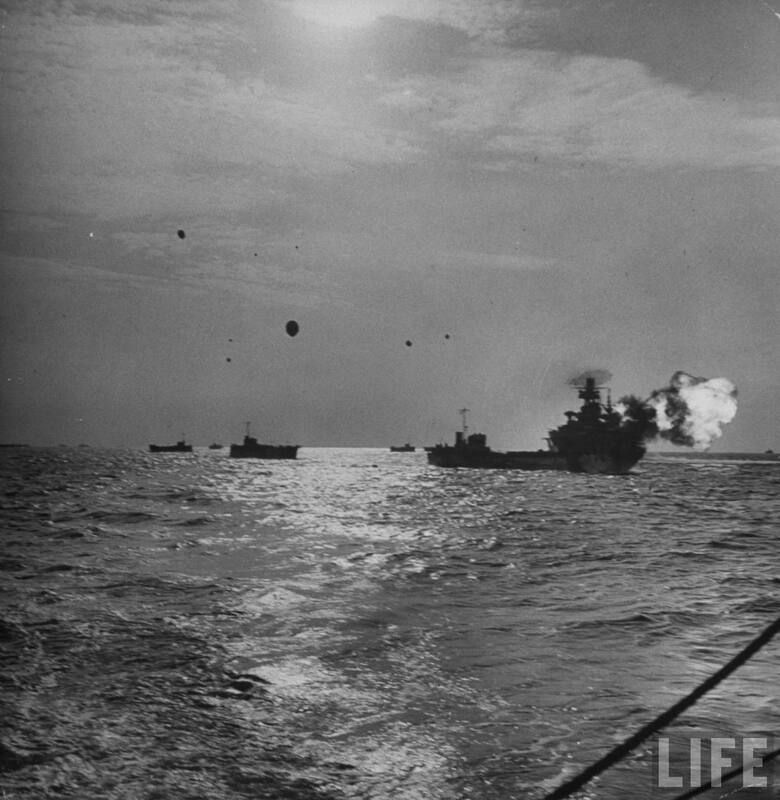 424k Allied warships of Bombarding Force 'O', supporting the landings on Omaha area. 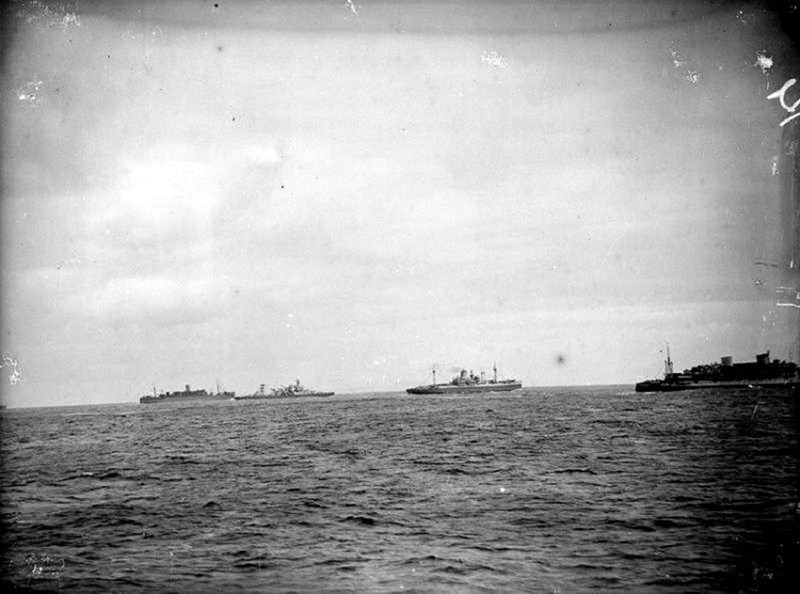 The column is led by Texas (BB-35), (left) with HMS Glasgow, Arkansas (BB-33), FFS George Leygues and FFS Montcalm following. Source: Imperial War Museum Admiralty Official Collection, Photo No. © IWM (A 23923), courtesy of Mike Green. 393k D-Day ammunition expended by ship of the Bombarding Force 'O', above. From "Report of Naval Operations in the invasion of Normandy, France, 6/6/44-7/3/44" issued by Allied Naval Commander-In-Chief, Expeditionary Force. courtesy of Tracy White @ Researcher @ Large. 259k Arkansas (BB-33) bombarding German positions on 6 June 1944 off Omaha Beach. LCT-763 is carrying troops ashore. 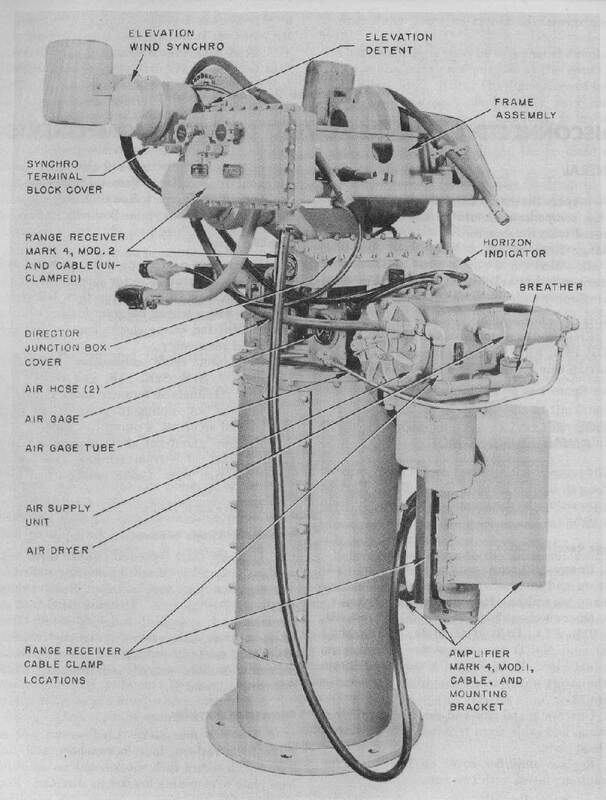 Note that the wartime sensor has erased the radar and electronics atop the Arkansas's foremast. Source: Australian War Memorial, Photo No. P02018.287 courtesy of Mike Green. 96k Arkansas (BB-33) fires her 12-inch guns at German positions, while supporting the Omaha Beach landings, 6 June 1944. Official USN photo # 80-G-231250, now in the collections of the National Archives. 173k American battleship Arkansas (BB-33) firing its big guns while shelling the beaches of Normandy during the Allied invasion of France, aka D-Day. Photographer: Frank Scherschel, courtesy of Life. 582k Officers and men of the Arkansas (BB-33) on the lookout for enemy planes during the invasion of Normandy, France, 5 June 1944. Just spotted LST's enroute to Normandy. USN photo # 80-G-244199 & 80-G-244200 (insert) now in the collection of the US National Archives in College Park, Maryland, courtesy of Sean Hert. 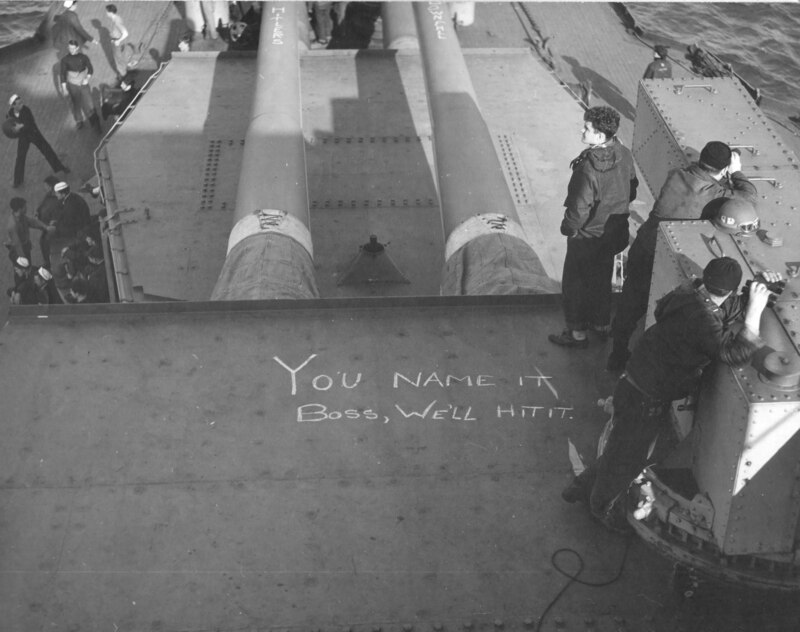 444k Top of turret of 12" gun bearing inscription You Name it Boss, We'll Hit it! In left background men toss medicine ball during lull in battle, 7 June 1944. USN photo # 80-G-244214, now in the collection of the US National Archives in College Park, Maryland, courtesy of Sean Hert. 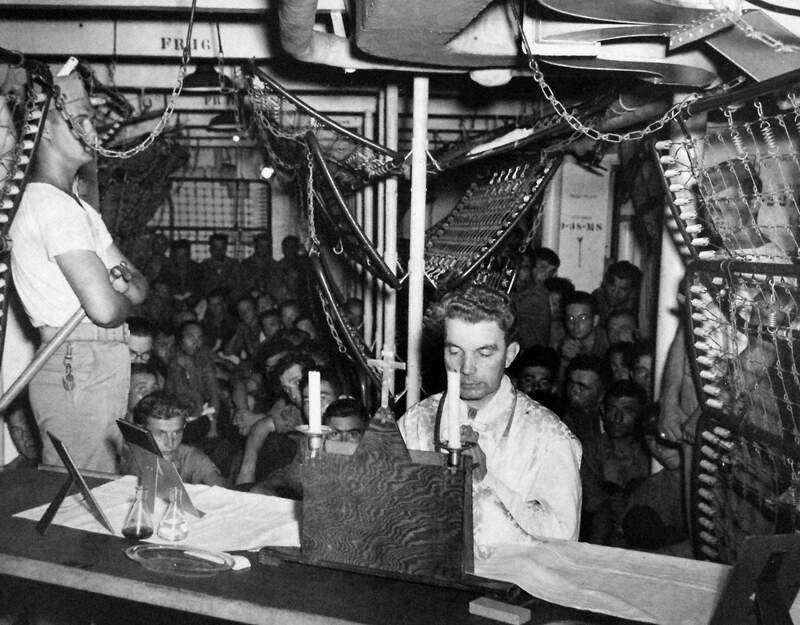 482k Chaplin T.J. Fallon, holding Roman Catholic church services aboard Arkansas (BB-33) off coast of Normandy, 11 June 1944. USN photo # 80-G-244221, now in the collection of the US National Archives in College Park, Maryland, courtesy of Sean Hert. 408k On 14 August, Operation Anvil the invasion of the southern French coast between Toulon and Cannes, began. 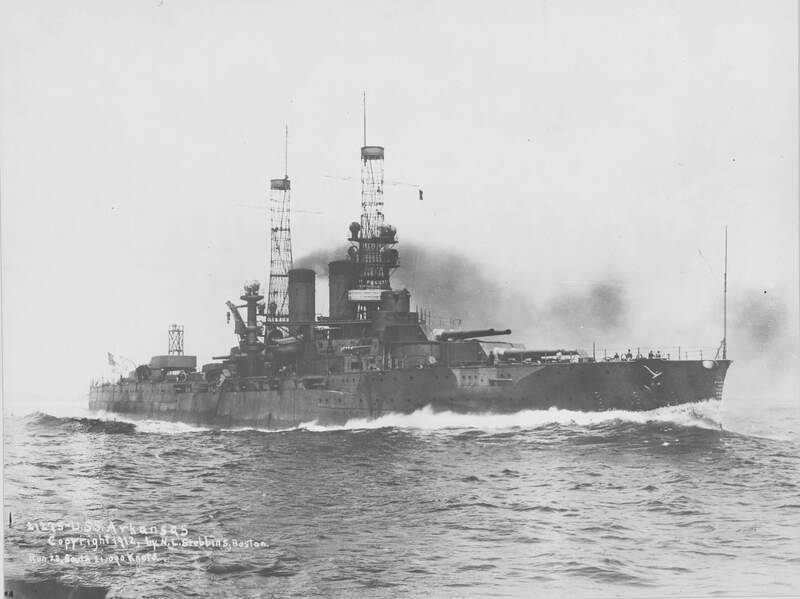 Arkansas (BB-33) provided fire support for the initial landings on 15 August, and continued her bombardment through 17 August. After stops at Palermo and Oran, Arkansas set course for the United States. On 14 September, she reached Boston, and received repairs and alterations through early November. Arkansas is viewed on a release date of 1 September 1944. Text courtesy of DANFS. USN photo # 80-G-244203, now in the collection of the US National Archives in College Park, Maryland, courtesy of Sean Hert. 519k Crew of the Arkansas (BB-33) line topside to watch Jack Haley's USO show in Oran, North Africa. USN photo # 80-G-244201, now in the collection of the US National Archives in College Park, Maryland, courtesy of Sean Hert. 711k LCVP alongside the battleship Arkansas (BB-33) transfers wounded men for medical treatment. Normandy, France, 1944. USN photo from Navy Medicine # 09-7912-22 from flickr.com via Robert Hurst. 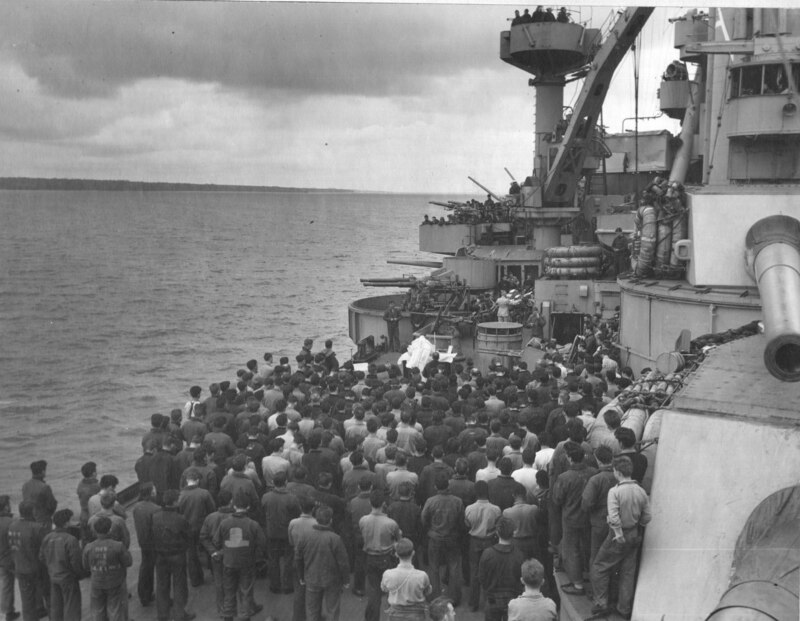 460k German prisoners of war onboard Arkansas (BB-33) for transportation from Southern coast of France to a prison camp. Shown: Chaplain T.J. Fallon, holding church services. 20 August 1944. USN photo # 80-G-244223 from the National Museum of the U.S. Navy via flickr.com. Photo courtesy of catalog.archives.gov via Joe MacDonald. 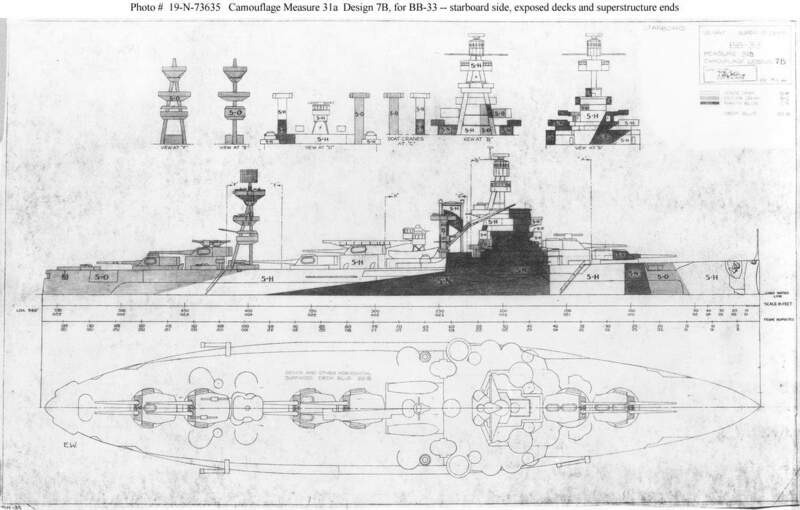 114k Drawing prepared by the Bureau of Ships for a camouflage scheme Measure 31a, Design 7B intended for the battleship Arkansas (BB-33). This plan, approved by Captain Torvald A. Solberg, USN, is dated 11 October 1944. 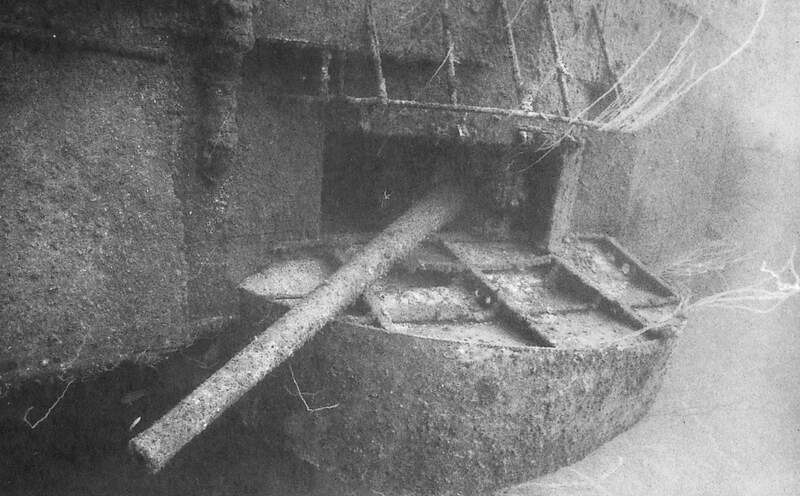 It shows the ship's starboard side, exposed decks and the superstructure ends. Arkansas was photographed in this pattern in November 1944. 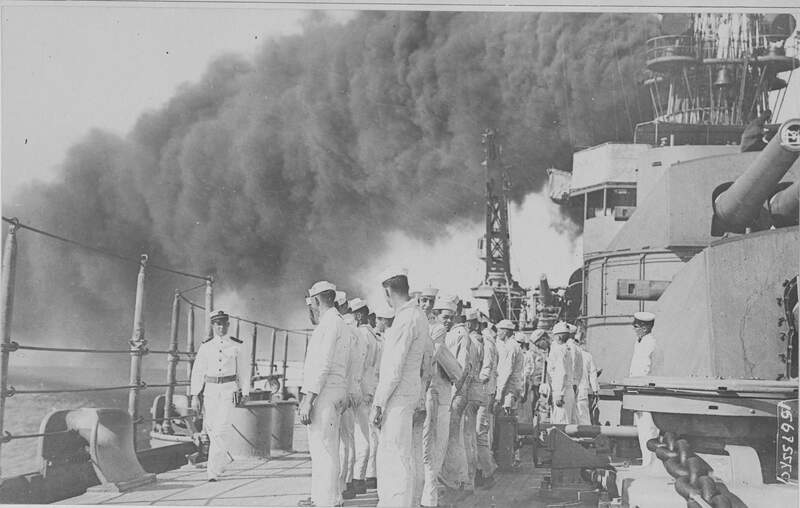 Photograph # 19-N-73635, from the Bureau of Ships Collection in the U.S. National Archives. 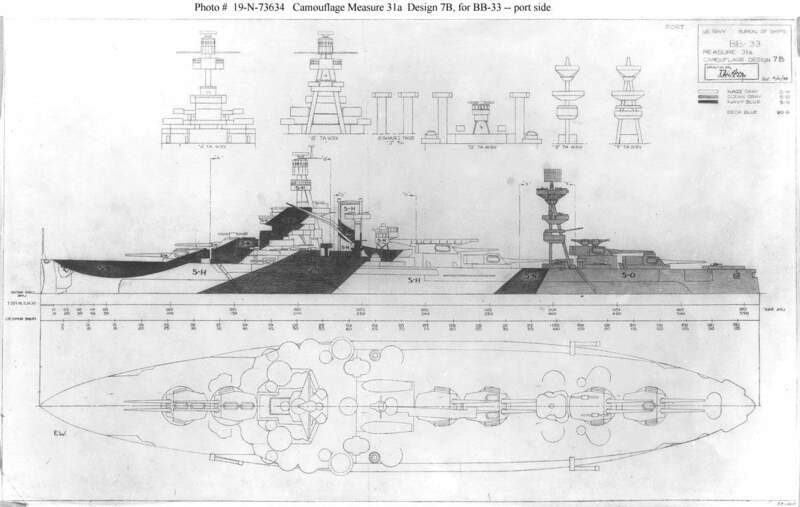 94k Drawing prepared by the Bureau of Ships for a camouflage scheme Measure 31a, Design 7B intended for the battleship Arkansas (BB-33). This plan, approved by Captain Torvald A. Solberg, USN, is dated 11 October 1944. It shows the ship's port side. Arkansas was photographed in this pattern in November 1944. 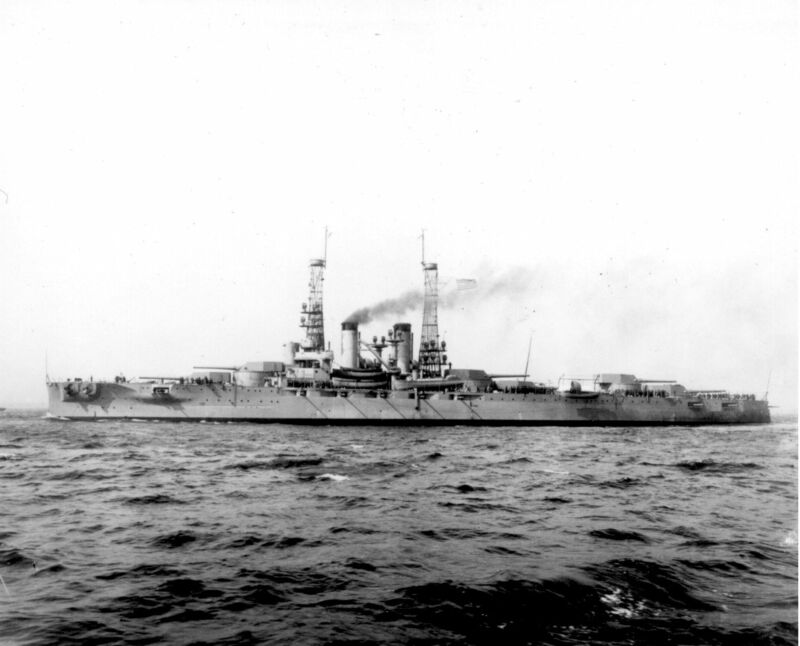 Photograph # 19-N-73634, from the Bureau of Ships Collection in the U.S. National Archives. 320k Arkansas (BB-33) off the Boston Navy Yard, Massachusetts, 5 November 1944. She is painted in camouflage Measure 31a, Design 7B. 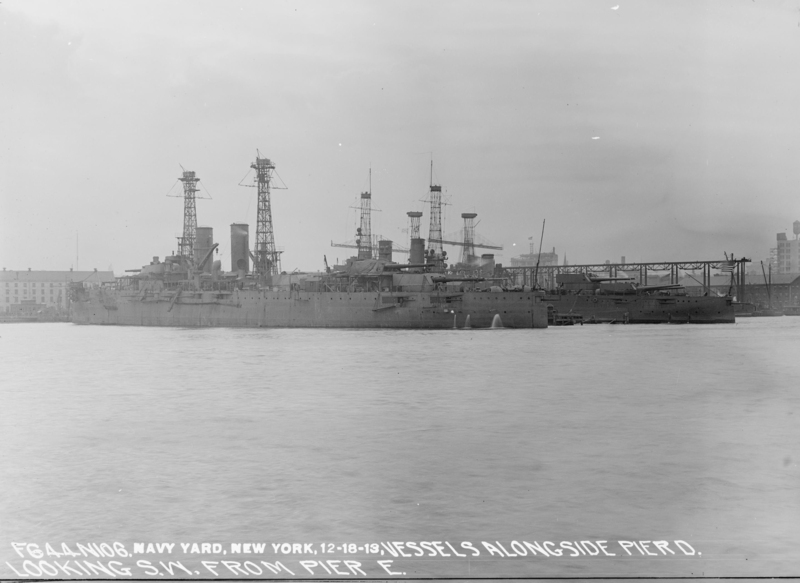 Photograph # 19-N-74310, from the Bureau of Ships Collection in the U.S. National Archives. 127k Captain Wade DeWeese was the commanding officer of the battleship Arkansas (BB-33) in 1945. USN photograph courtesy of Bill Gonyo. 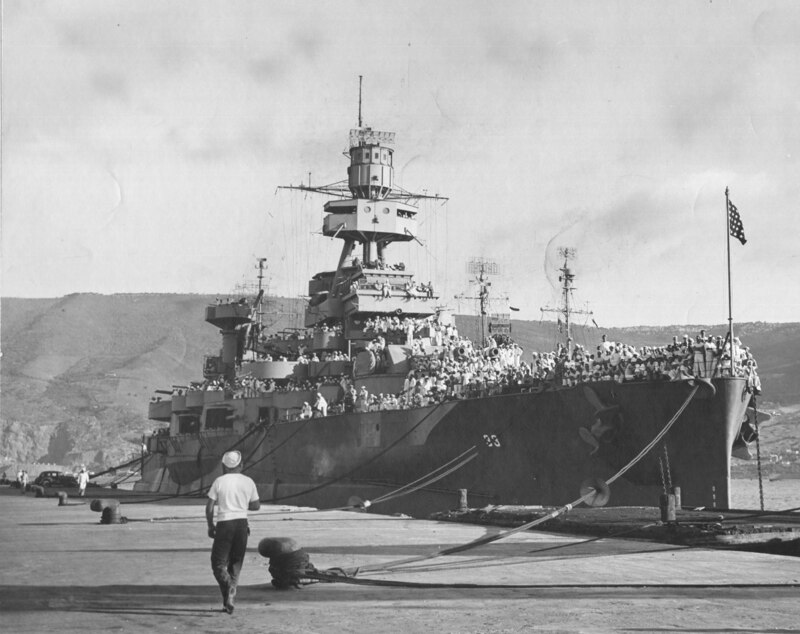 964k Arkansas (BB-33) anchored at San Pedro wearing measure 21 camouflage. Photo of the ship after her final wartime refit on 1 January 1945. The bridge was cut down and 40 and 20mm guns were added at that time for improved anti-aircraft defense. USN photo. 83k Anchored in San Pedro harbor, California, on 1 January 1945. A tanker and a Navy attack transport (APA) are in the background. USNHC photo # 19-N-77075. 100k A line drawing by A.L. 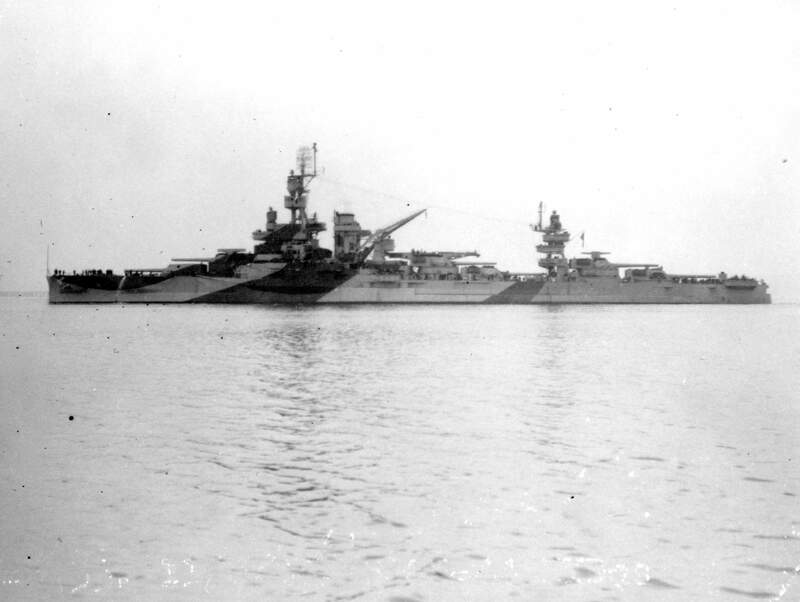 Raven of the Arkansas (BB-33) in 1945. Photo and text courtesy of U.S. Battleships: An Illustrated Design History by Norman Friedman. 67k Arkansas (BB-33) inboard profile, 1945. Photo and text courtesy of U.S. Battleships: An Illustrated Design History by Norman Friedman. 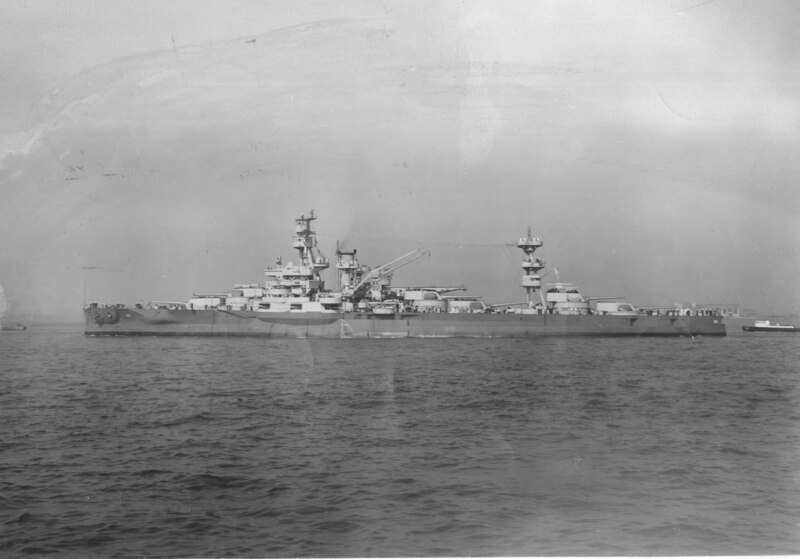 2.42k Broadside view of the Arkansas (BB-33), July 1945. Photo courtesy of Joe MacDonald. 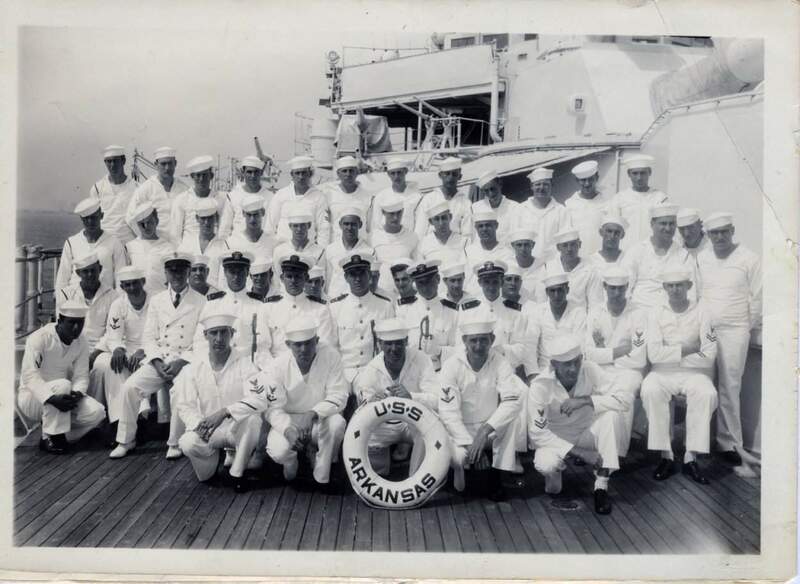 1.80k Post war crew photo of the Arkansas (BB-33), 15 November 1945. Photo courtesy of Doyle Counts via Robert Counts. 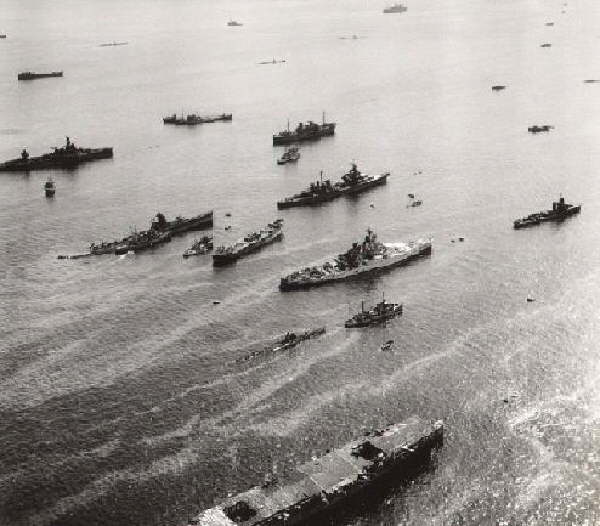 45k The Arkansas (BB-33) is in the left hand corner of this photo with other test ships at the Bikini Bomb Test, 1946. 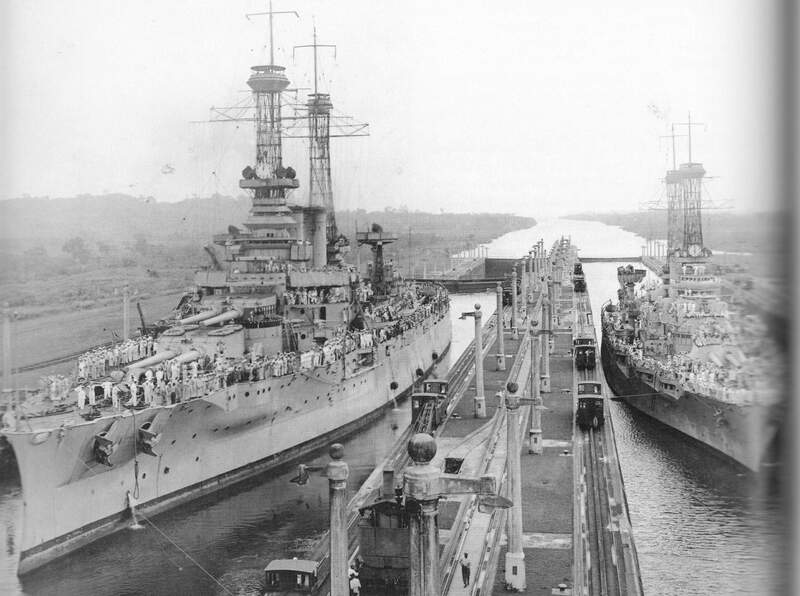 I believe the New York (BB-34) is in the center, and the Pennsylvania (BB-38) is to her immediate right. Courtesy of submarinesailor.com. 127k Arkansas (BB-33) in lower left rim of the Atomic blast, meets her fate in "Operation Crossroads", June 1946. 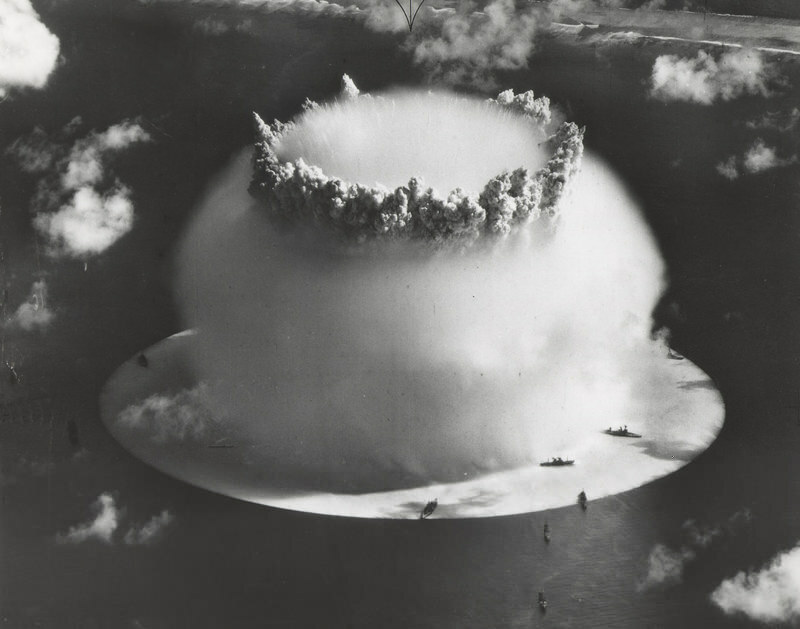 A 21 kiloton underwater nuclear weapons effects test, (Event Baker) conducted at Bikini Atoll (1946). Official USN photo courtesy of dtra.mil. 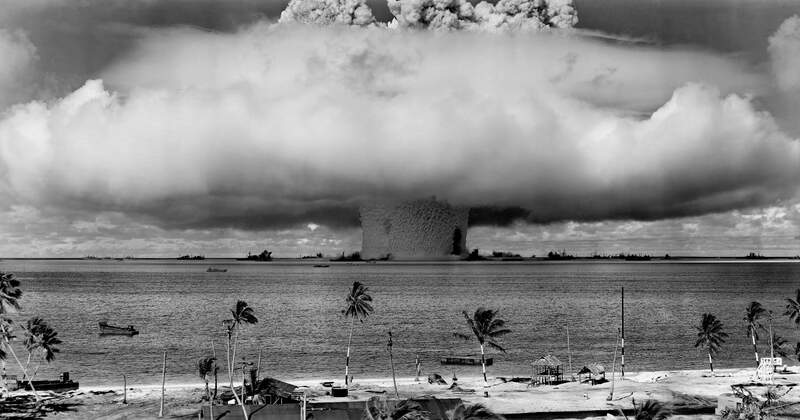 1.40k The Baker explosion, part of "Operation Crossroads" at Bikini Atoll, Micronesia on 25 July 1946. USN Photo courtesy of Pieter Bakels. 3.42k Arkansas (BB-33) in July 1946 showing the damage from the first Bikini bomb test. Photo courtesy of Joe MacDonald. 715k Gone in a blinding atomic fury, the old Arkansas (BB-33). Photo courtesy of Pieter Bakels. 1.00k The underwater test at Bikini shows its terrific power amid the anchored vessels, made bare seconds after its release. Photo courtesy of Pieter Bakels. 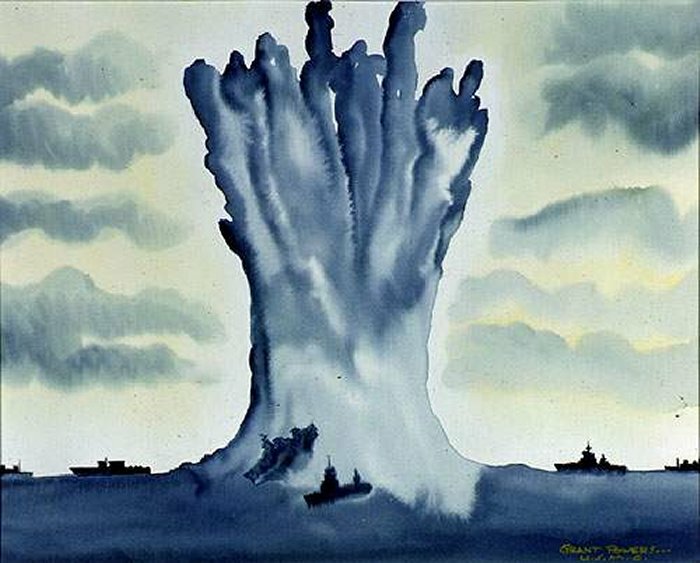 45k "Battleship Arkansas (BB-33)" by Arthur Beaumont, 25 July 1946, During Atomic Bomb Test BAKER Bikini Atoll, Marshall Islands, the Arkansas and numerous other Pacific Fleet expendables were used for experimental bomb blast reactions. 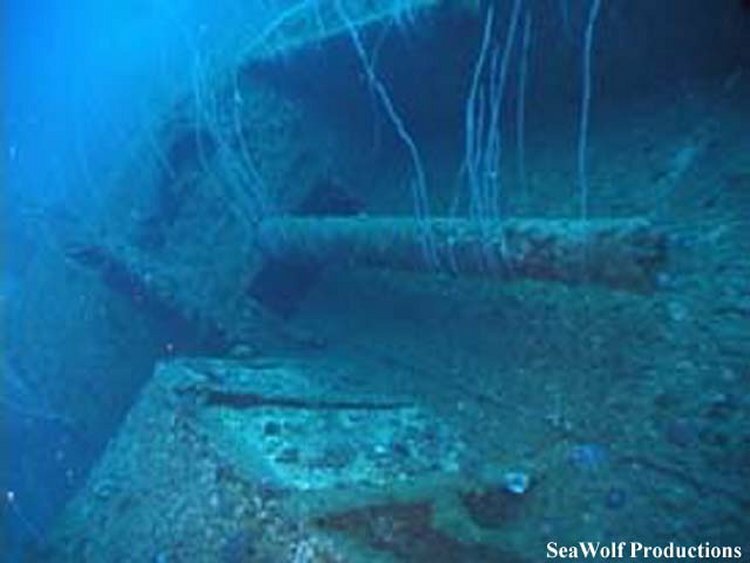 It is here that the Arkansas, which received four battle stars for her World War II service, met her end. 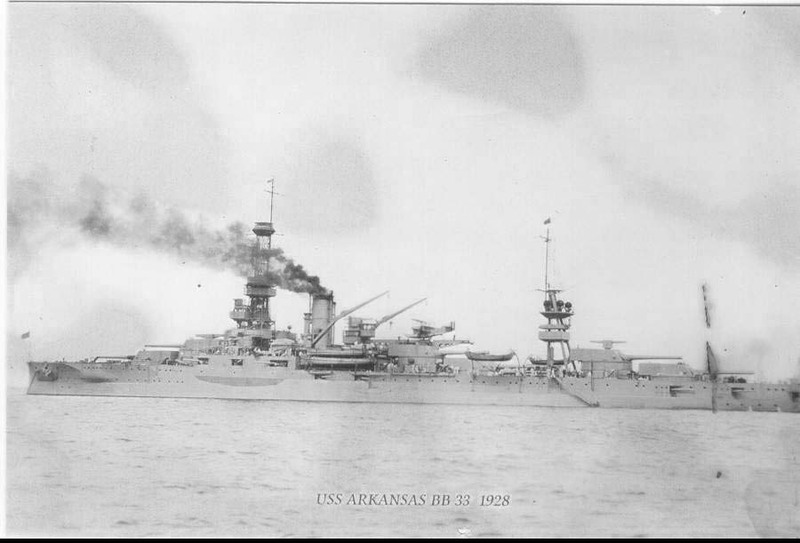 A view of Arkansas following test ABLE. As can be seen in this watercolor, the battleship suffered considerable damage to the masts and deck from this atmospheric detonation. She did not survive the second test, falling victim to underwater damage after the BAKER detonation. See ARKANSAS-Bikini Able and Baker Test Underwater Images. Arthur Beaumont # 8 Watercolor, 1946. 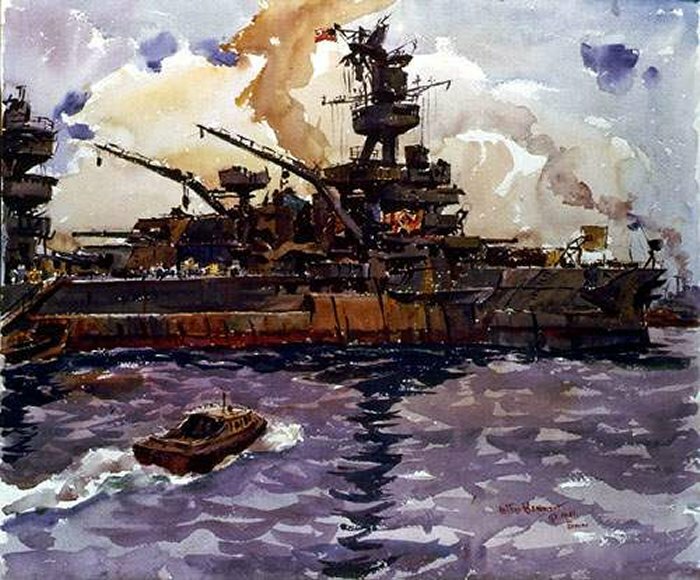 27k "Battleship Arkansas (BB-33) Being Tossed in Giant Pillar", by Grant Powers. 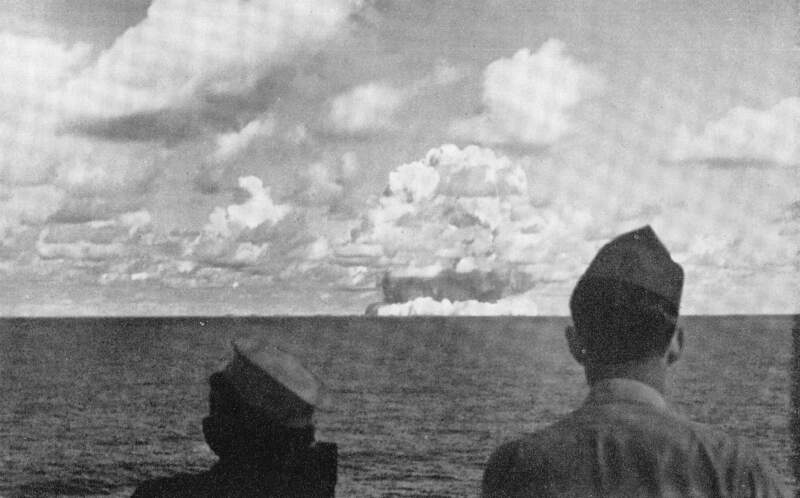 Unlike ABLE's atmospheric explosion, BAKER's detonation started with a spray dome that appeared at the underwater site. Owing to the denser nature of water, which quickly cooled the explosion, the initial fireball did not grow as large as ABLE's. The spray dome broke the surface near Arkansas and she sank quite suddenly. See ARKANSAS-Bikini Able and Baker Test Underwater Images. Grant Powers # 4 Watercolor, 1946. 526k Battleship Arkansas (BB-33) lying upside down at a depth of 180 feet in Bikini Lagoon. 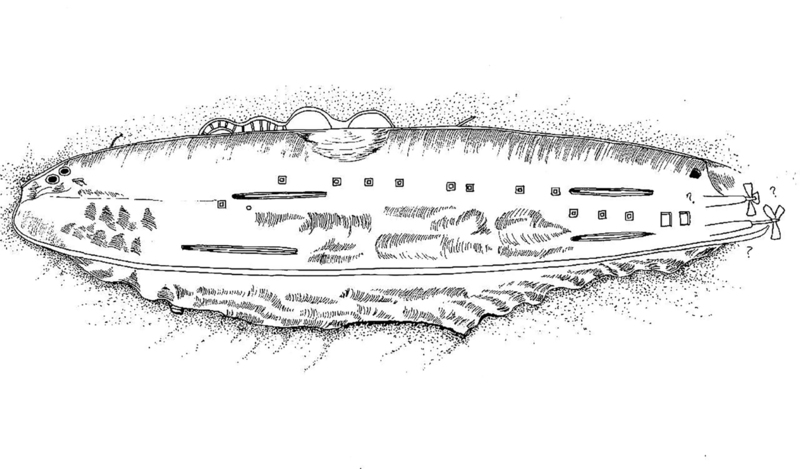 Diver's sketch from a 1989 National Park Service dive. National Park Service photo, Jerry Livingston and Larry Nordby - Delgado, James P., et al., The Archeology of the Atomic Bomb, National Park Service, Santa Fe, New Mexico, 1991, p 95., via wikipedia.org. 47k One of the Arkansas' (BB-33) 21 x 5"/51 guns lying in 175 feet of water. Photo courtesy of seawolfproductions.com. 283k One of the Arkansas' (BB-33) 5"/51 portside guns. Guns lying in 180 feet (55 metres) beneath the waves at Bikini Atoll, Marshall Islands. Photo courtesy Larry Murphy, National Park Service.Lost Warships: An Archaeological Tour of War at Sea by James P. Delgado via Robert Hurst. 367k Diver at Bow of Arkansas (BB-33), Marshall Islands, Bikini Atoll, Micronesia, Pacific Ocean. 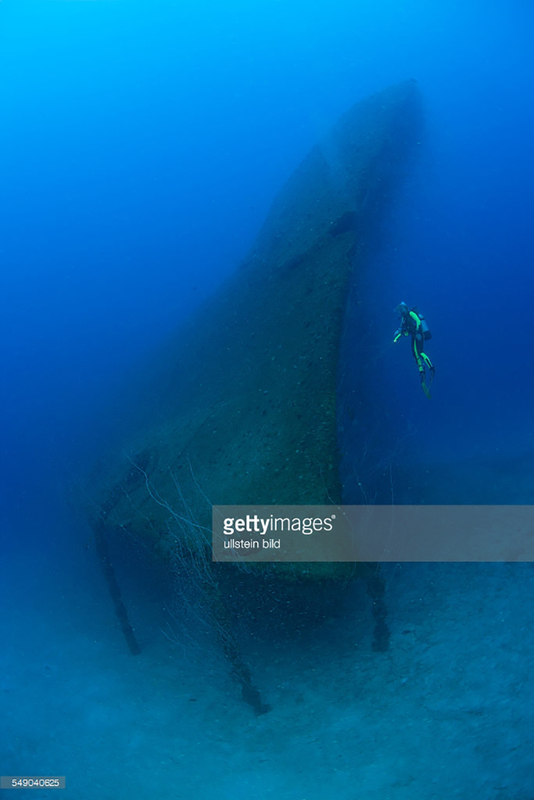 Photo by Reinhard Dirscherl/ullstein bild via Getty Images courtesy of gettyimages.com.